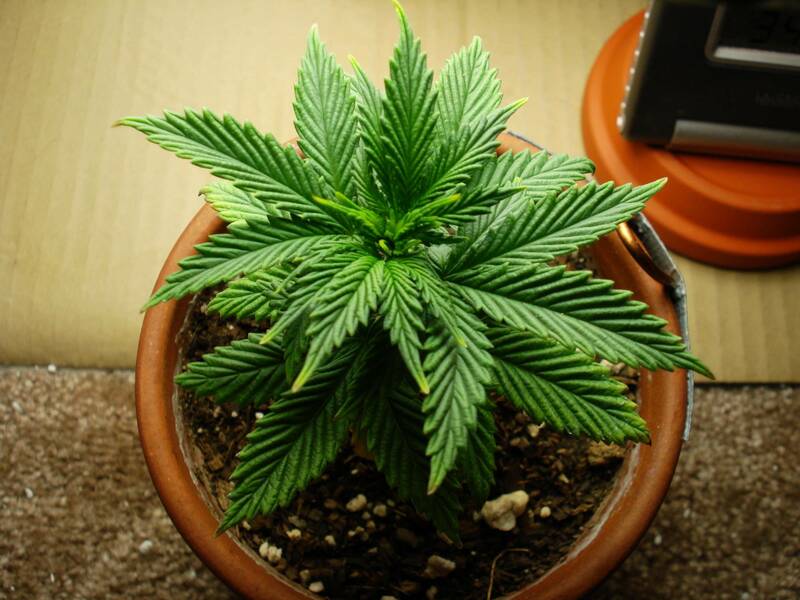 Early this morning, my living plant, only 2 weeks from finishing flowering was seized and destroyed by a group of cops. 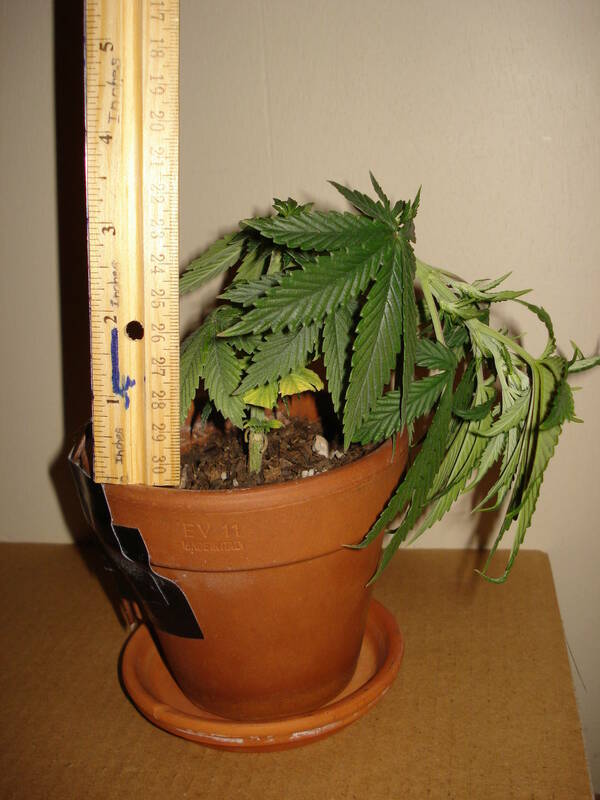 It was not at random, but a series of events that lead to this horrible outcome for this grow journal. Basically, bad decisions, incriminating stickers and being in the wrong place, at the wrong time. Here's the whole story on how and why it was Seized by the Cops. 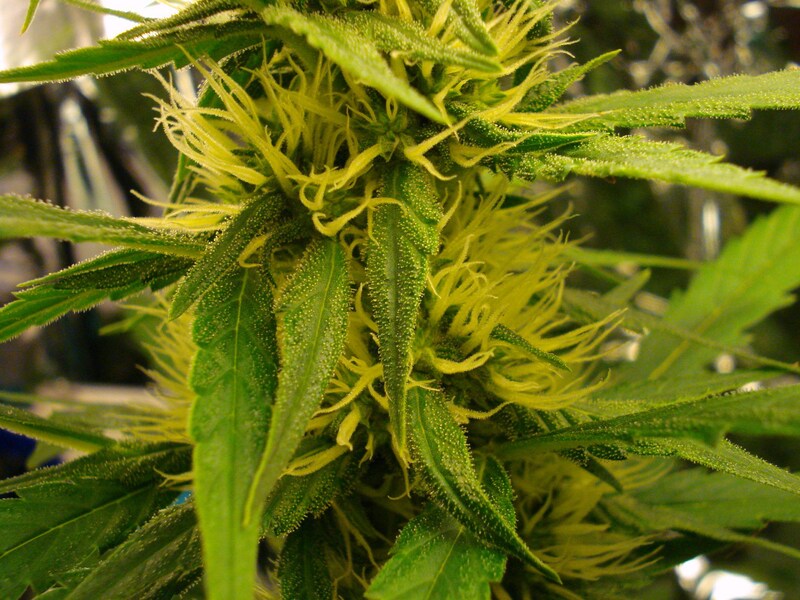 Please read so you don't make the same mistakes on your grow, or in your life. Well, since everyone else makes a collection of their entire grow on the first page, I'm doing the same. Besides, like my bedsheets, my OP is really messy! 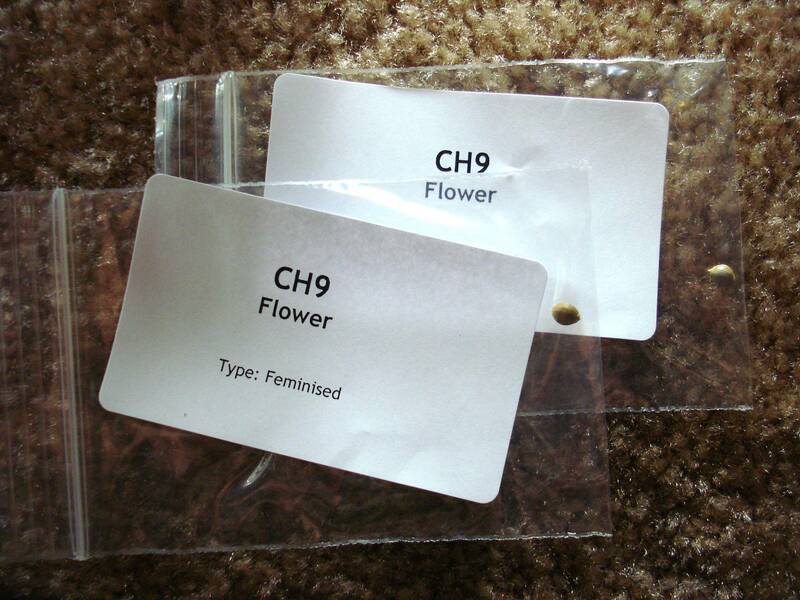 Here are the feminized " Flower " seeds by CH8 breeding company and the strains stats (provided by the website I bought them from). 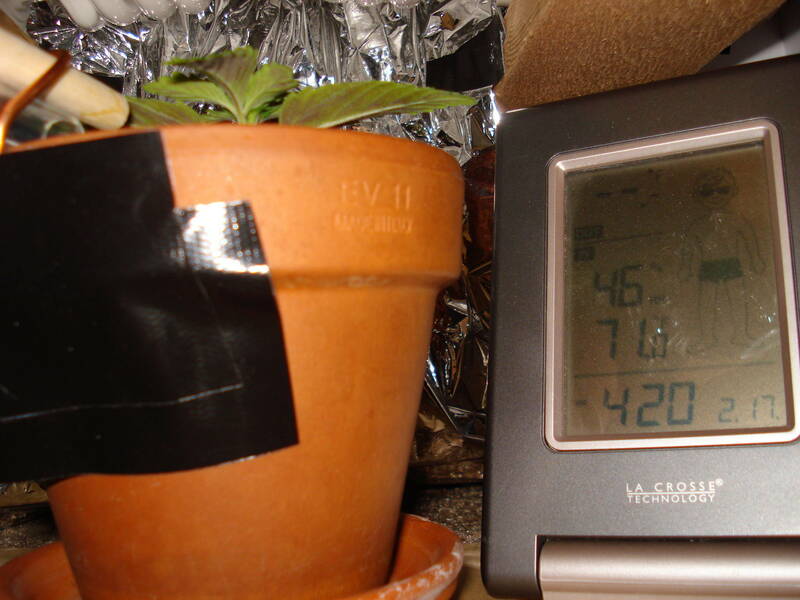 Notes: Last photo: It was important to me that the seed be planted at exactly 4:20pm, in honor of my goal of harvesting on April 20, 2010. It was a bad choice to use clay pots from the start. They have bad drainage, and they evaporate water too fast thru their clay material. Next time, I will use plastic with bottoms that have plenty holes in them. 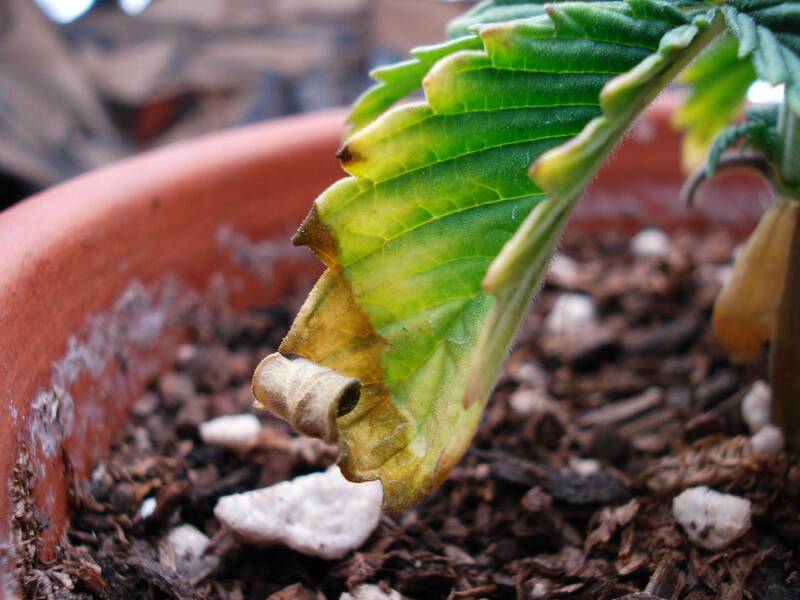 Notes: Still using drip system (have not yet learned its not helpful to my plant). 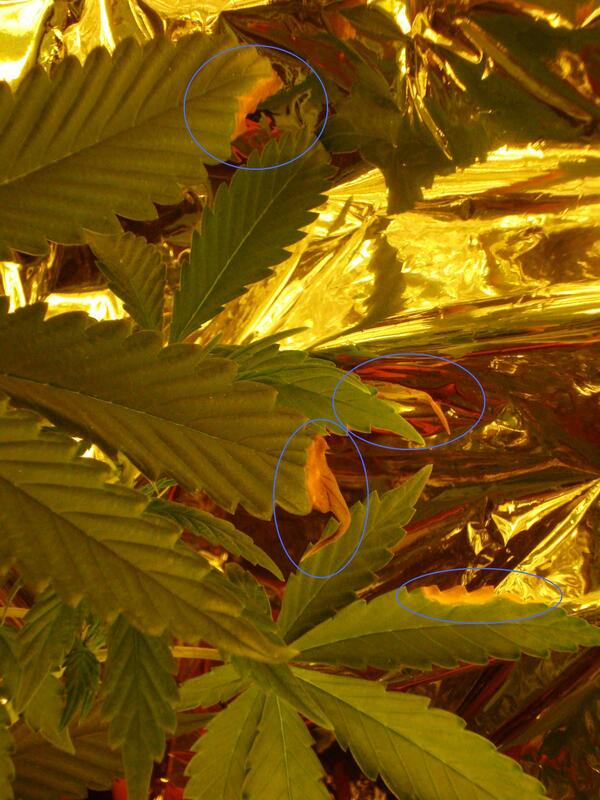 Also, notice the purple color under the leaves on the last photo. 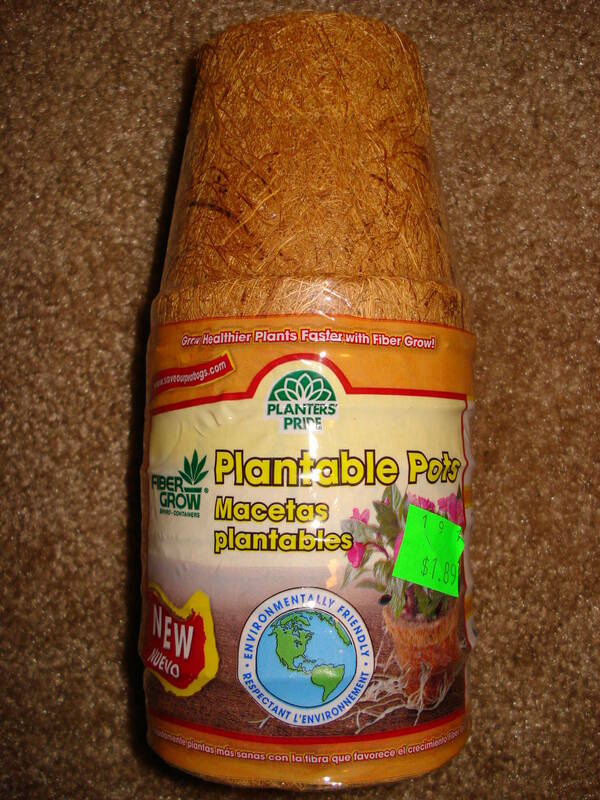 Up to this point, I have not being using a fertilizer, just bottled water. 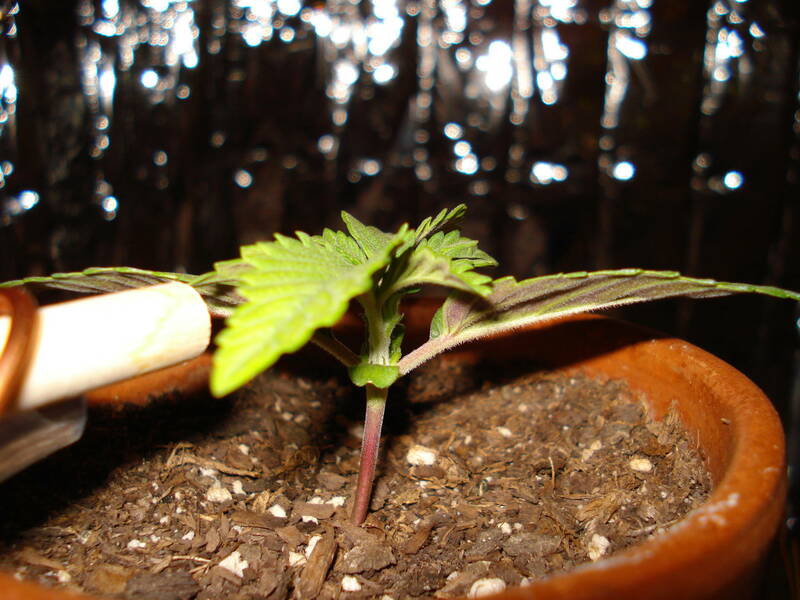 I later find out, thru research, that the purple is an early sign of nutrient deficiency (aka she needs food). I wish I learned that sooner. Oh well. 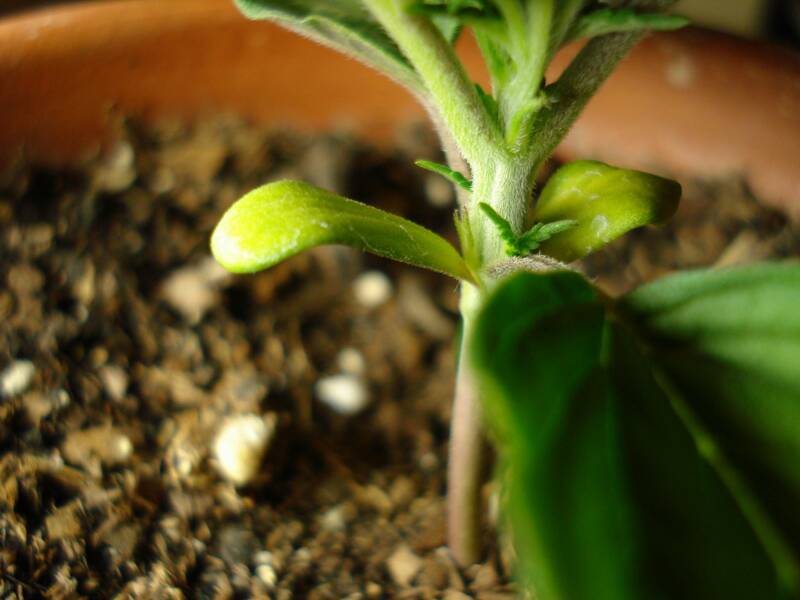 Notes: Notice yellowing on the cotyledon (baby) leaves on 3rd photo. 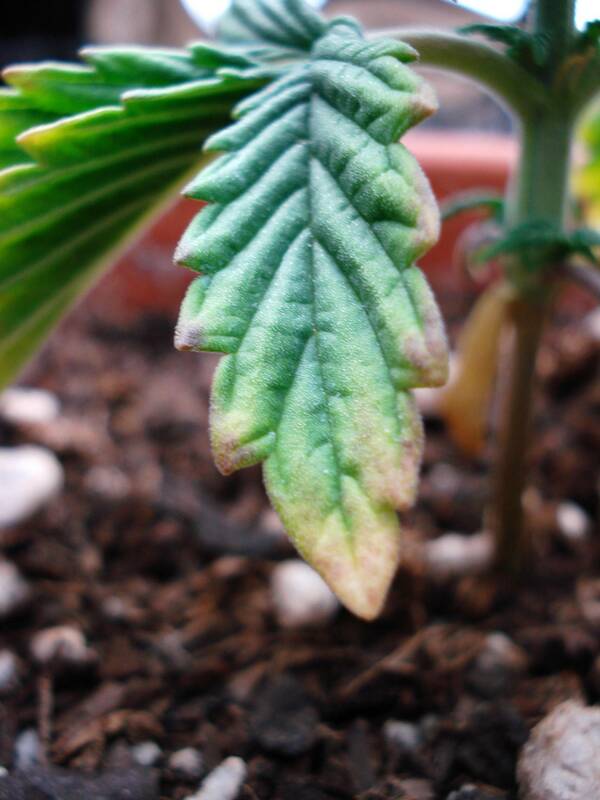 Sign of nutrient deficiency...should of saw the signs. 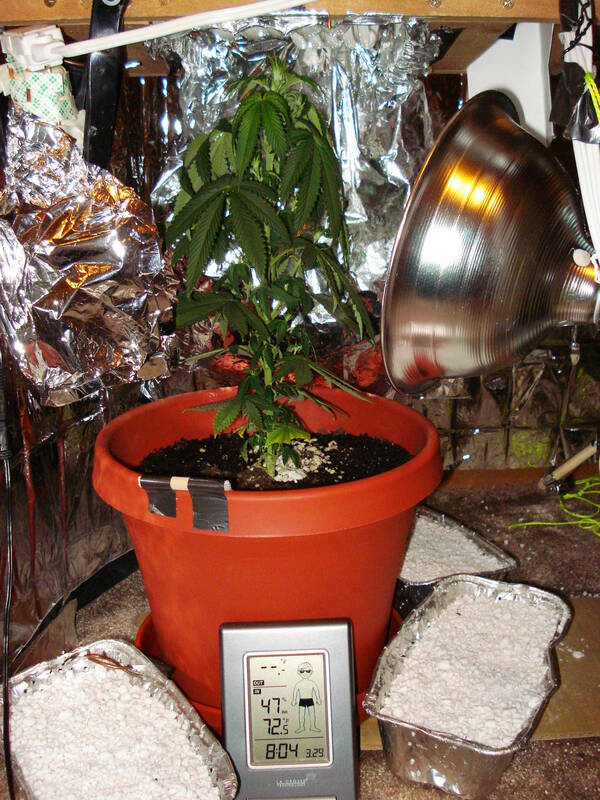 I also added a pan of perlite (last photo) to aid with humidity. Seemed to help, but not by much (a few % only). 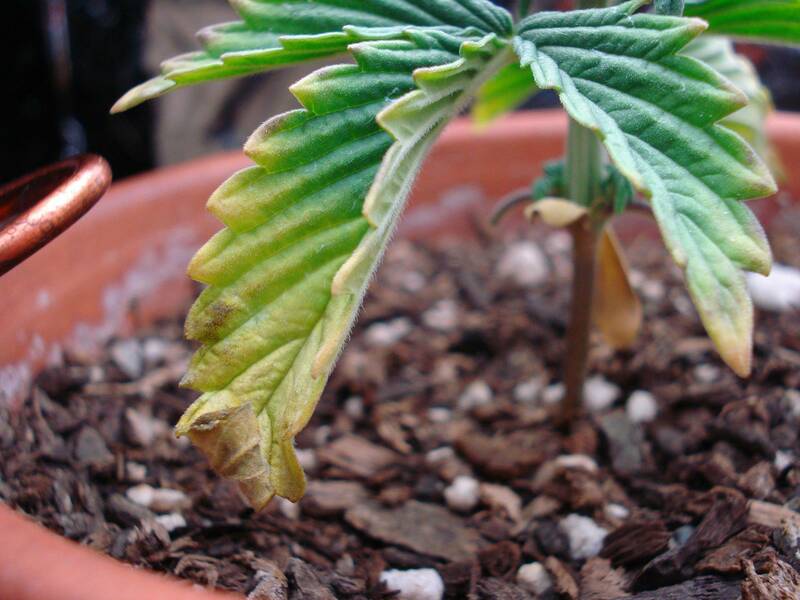 Notes: First sign of major yellowing on bottom leaves. Again, its the fact I haven't been using food. 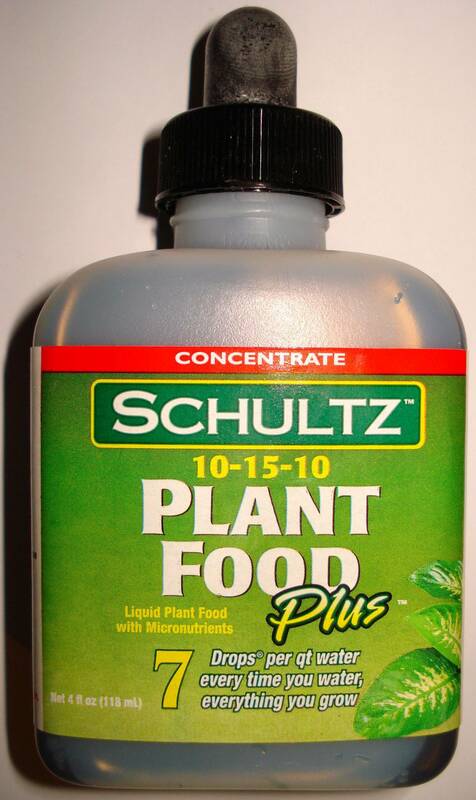 But today, I buy Shultz(r) liquid plant food (2nd last photo), and with Inverted's advice of using 2 full droppers per gallon (last photo). I also made the mistake of spraying the leaves with the mixture (forth photo from left). That was a Bad idea. Notes: Yellowing still getting worst. 2 mistakes pictured here. 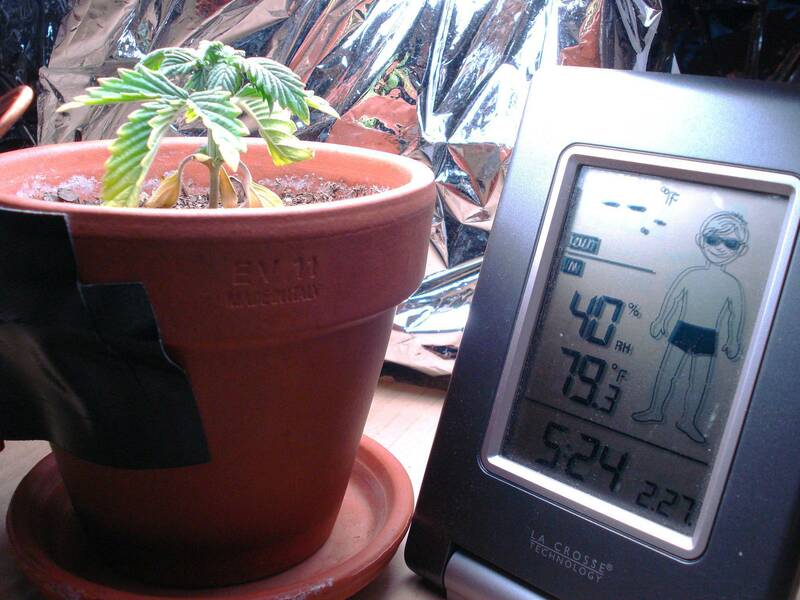 First, photo 3: I had my fan blowing directly on my plant the entire light cycle. It should have been on rotate-mode. That was a bad choice by me. 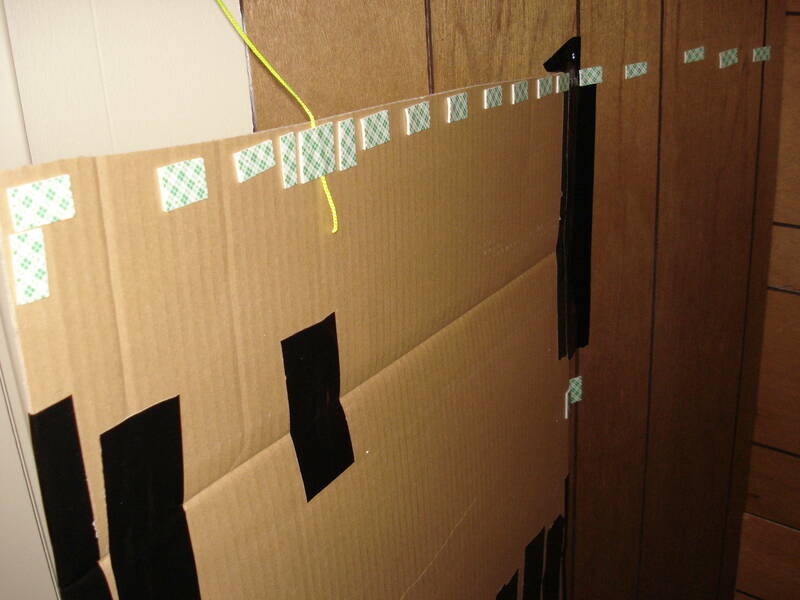 Second Mistake, photo 4: My taped-up sheathing failed, thank God it was during the day. I learned that thumb tacks are the way to go when putting up sheet stealth. Notes: Drooping is getting pretty bad here. 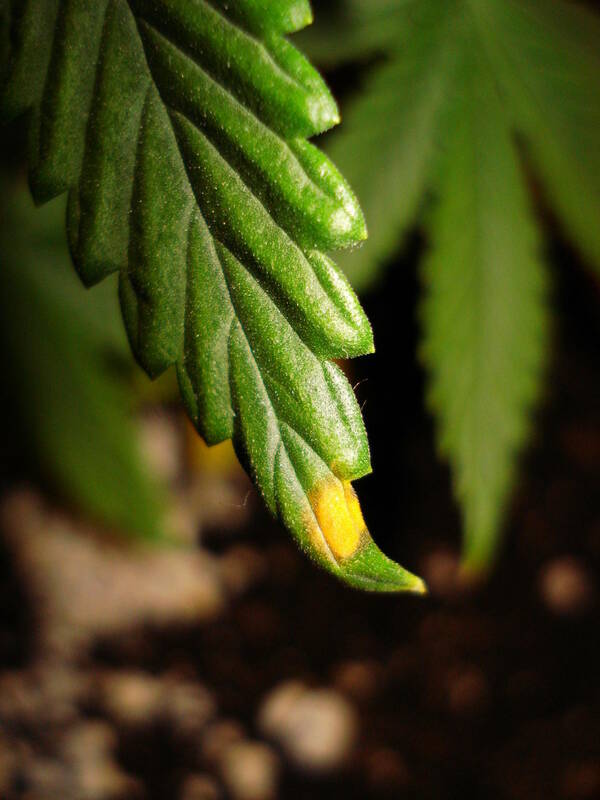 The yellowing won't stop on lower leaves. The yellow eats it like a disease, its weird. Added a small 80mm fan to the woodern 'light wagon" to aid in cooling and strengthening the stem with a little wind (a good idea). 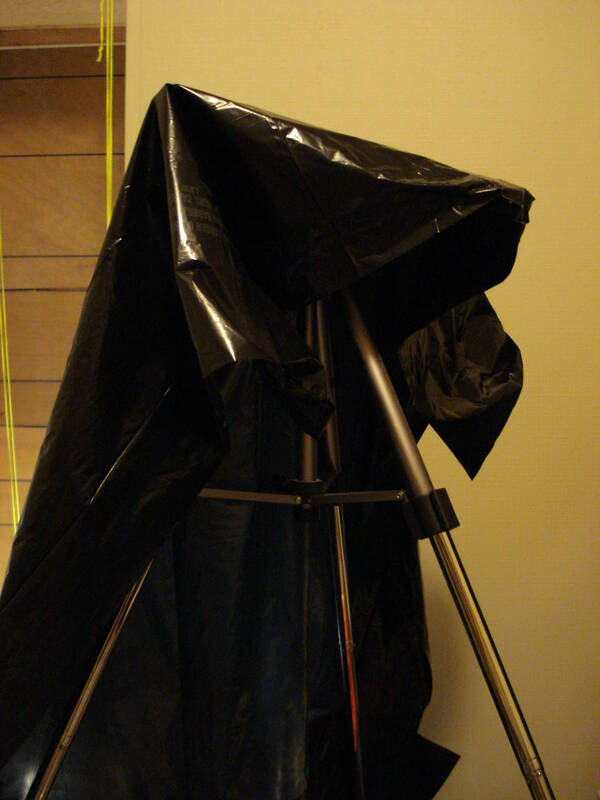 Also, the last photo is my *fixed* stealth covering using a large cloth sheet. 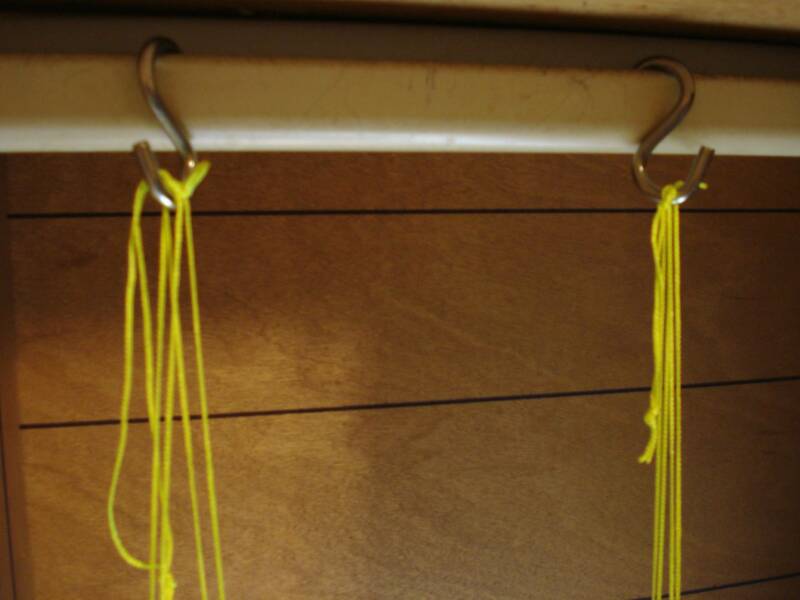 I used push-pins instead of duct-tape, like I used before. Works WAY better! Don't use tape on cloth, it doesn't work. Push-pins or small nails only. 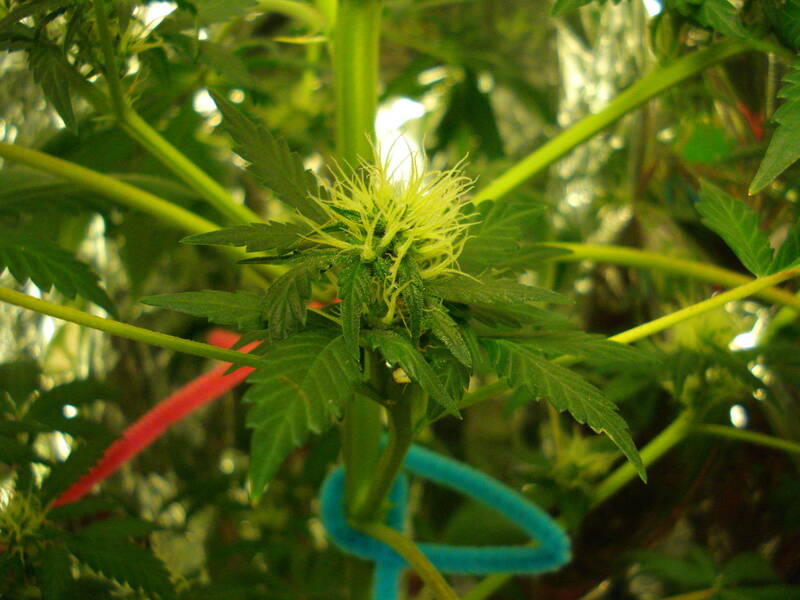 Notes: Noticeable yellowing on tips on upper canopy (Photo 2). 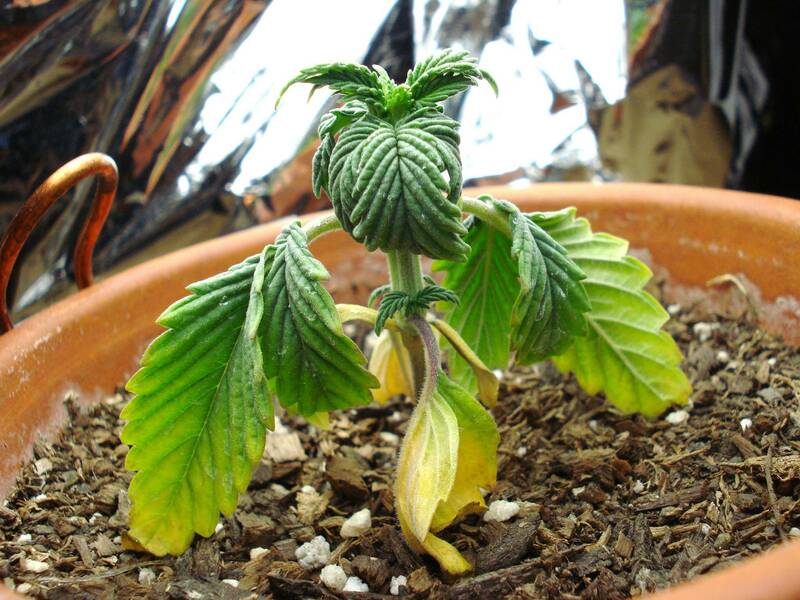 Curling is getting really bad on the bottom leaves. The bottom leaves are dying a little more everyday. I've been cutting them, and smoking them. The smell (before I smoke them) has a unique sun-ripened guava smell. Now I know why its called "Flower!". Smells sweet and pleasant. Notes: Still problems with curling and yellowing, but not bad. I posted this one day diff. one because its the end of the month, and I didn't do the 29. 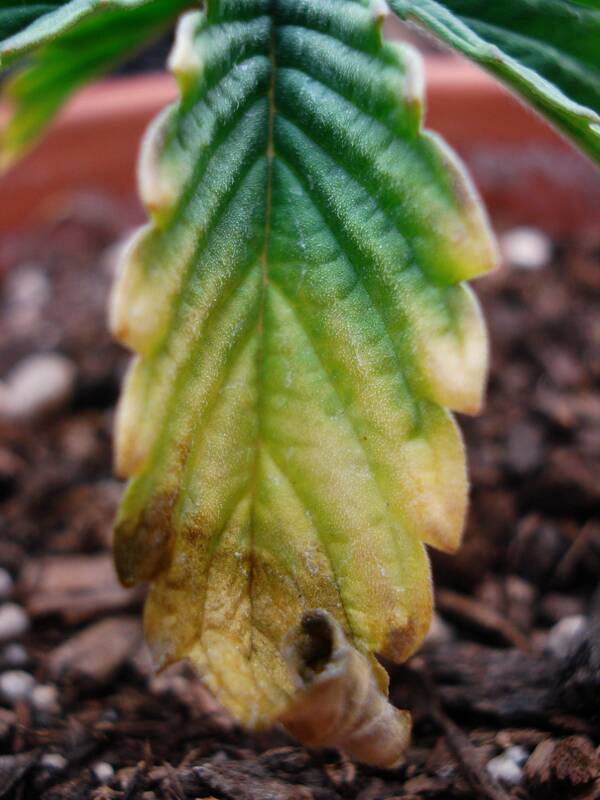 Notes: Yellowing and dying tips on the bottom leaves are still a problem, and it looks pretty bad here (photo 2, 3). The top canopy is also showing signs too (last photo). But still alive, so its not too bad. 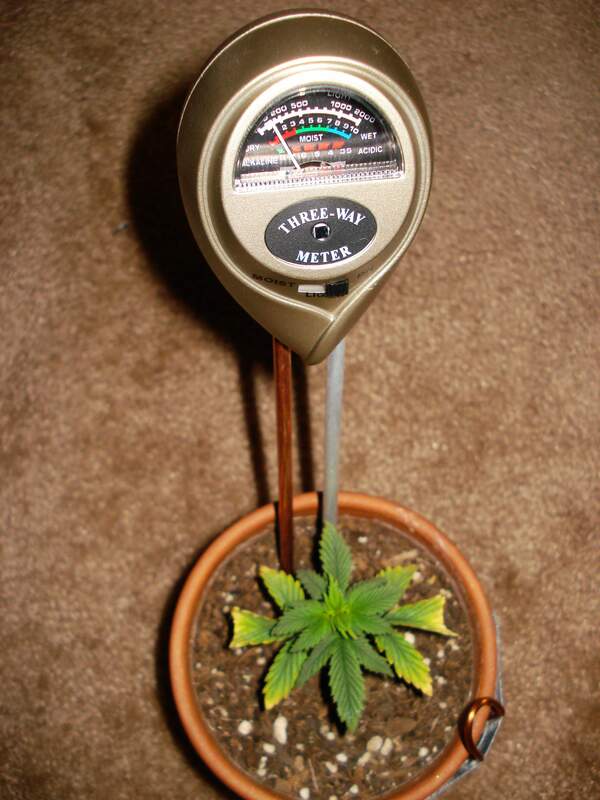 Notes: Bought a 3-in-1 meter, for light, soil wetness, and pH (photo 3). Light output is off the charts on the needle (photo 4). The pH is about 6.5, not too good (Photo 5). Wetness between damp and dry (last photo). Notes: Big growth changes. 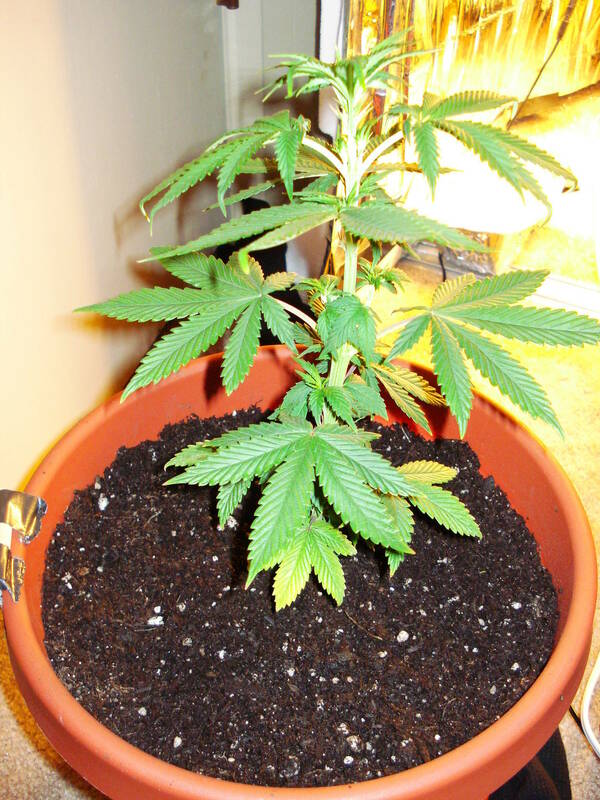 Still growing healthy, but some yellowing on bottom. 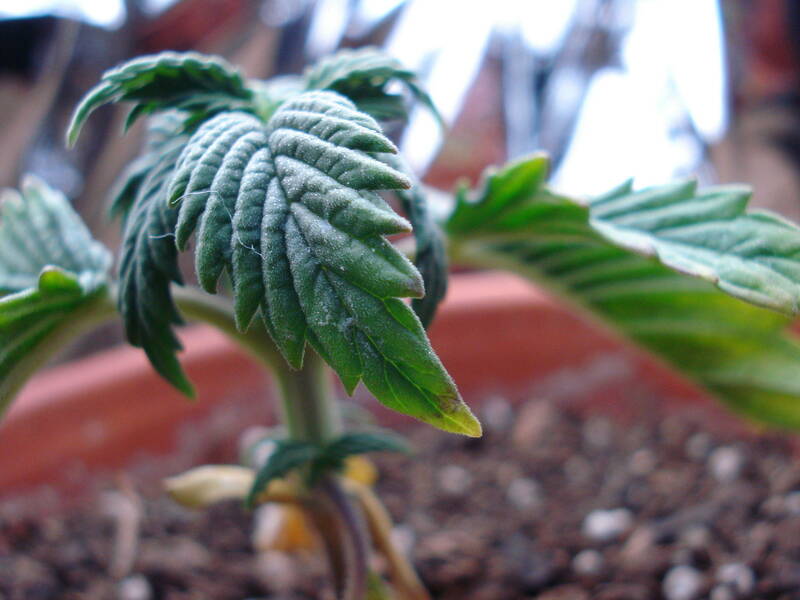 Notes: Growing great now. Really fast. 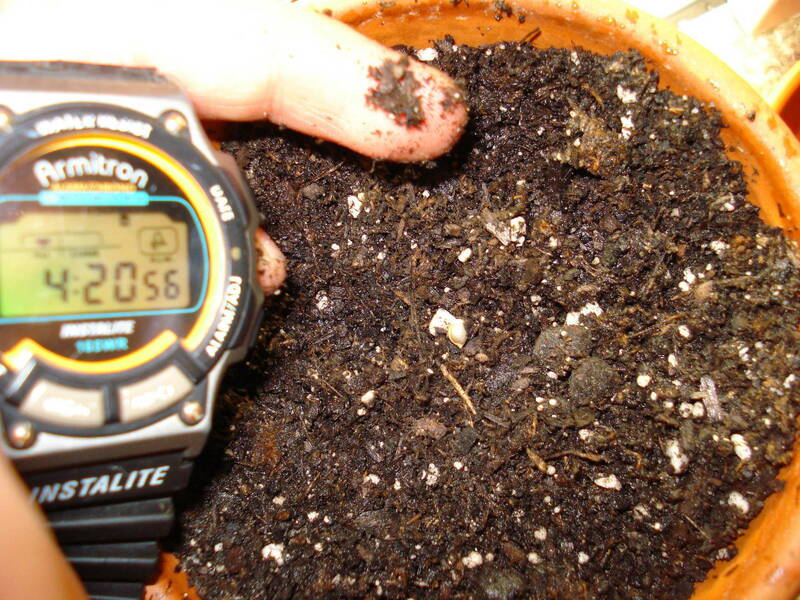 In the last photo, you can see that the roots are starting to come out the bottom of the pot. I thought this meant its ready for transplant: but, according to Inverted, I was wrong. So, I kept it inside the small clay pot. Like he said, Water control is KeY! 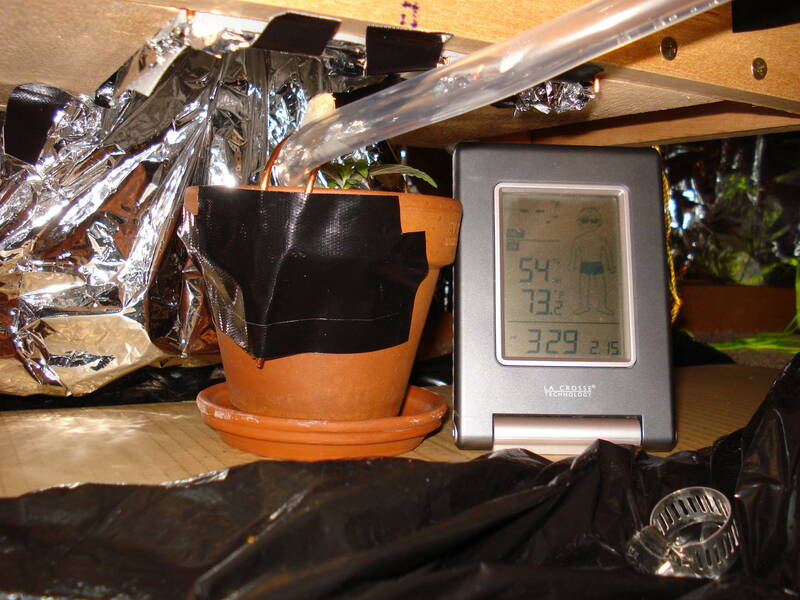 Large pots mean poor water/moisture control, which should be avoided. 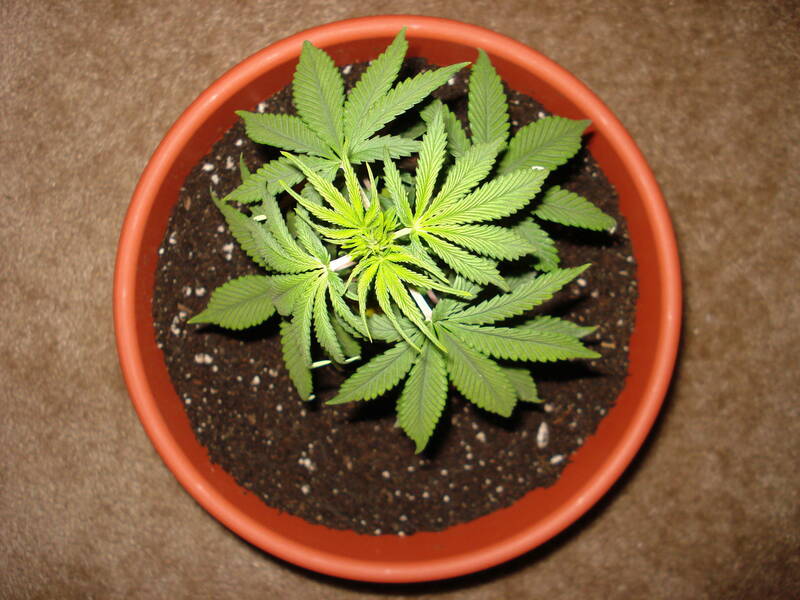 So, small pot it is. 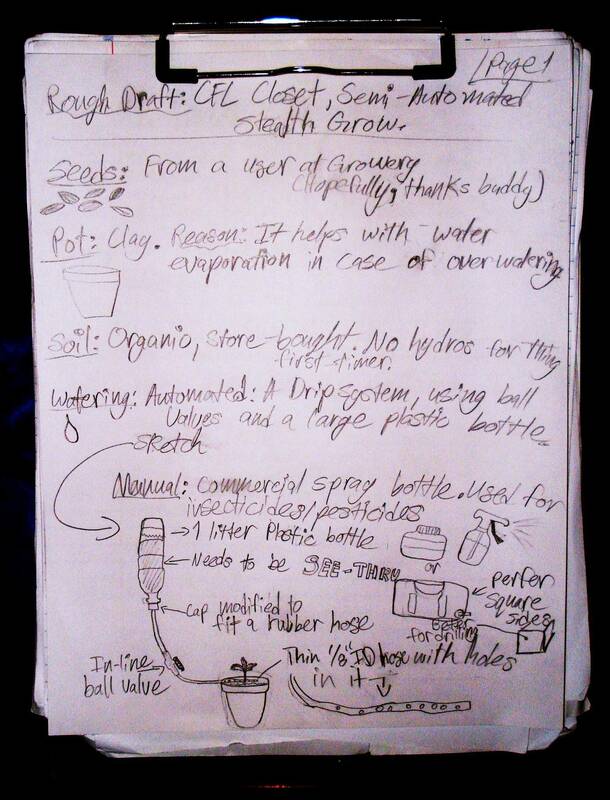 Notes: Today was the day I implemented my simple CO2 supplementation idea (using the gravity drip system I used for watering previously). 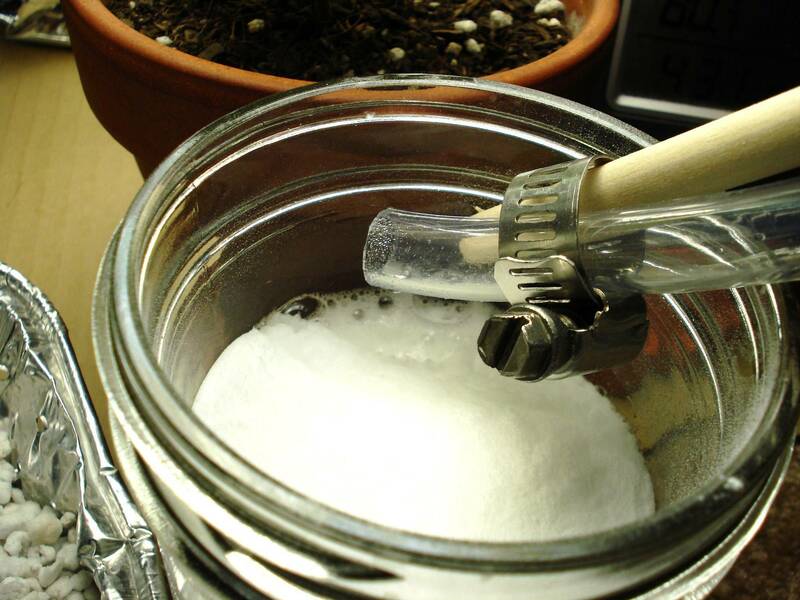 I used the classic Baking soda + vinegar chemical reaction to make CO2. 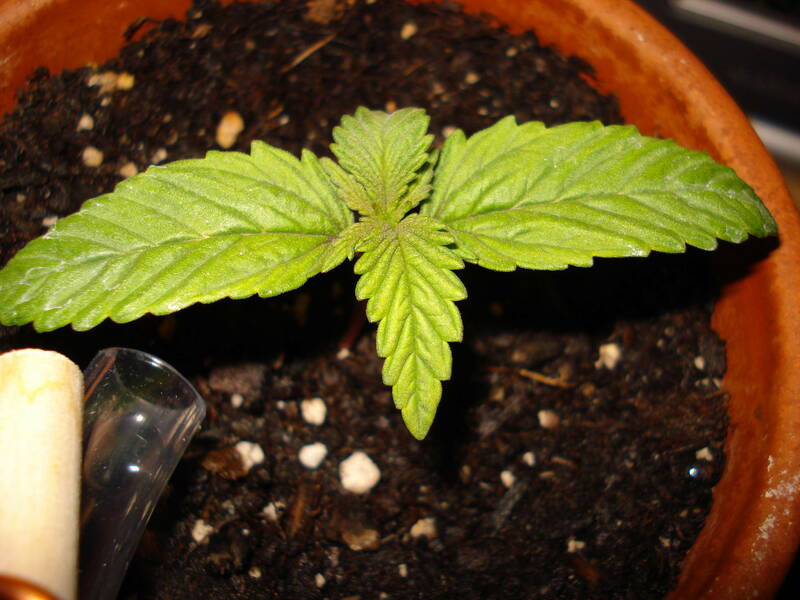 The reason why I wanted to use CO2 supplementing was because I had been doing research on it, and what I've learned that plants grow a lot faster when you add it (because plants use CO2 from the air to create carbon-based organic chemicals to grow, thru photosynthesis). And the reason why I started doing this now is because I am moving out of this place around June 5, 2010. 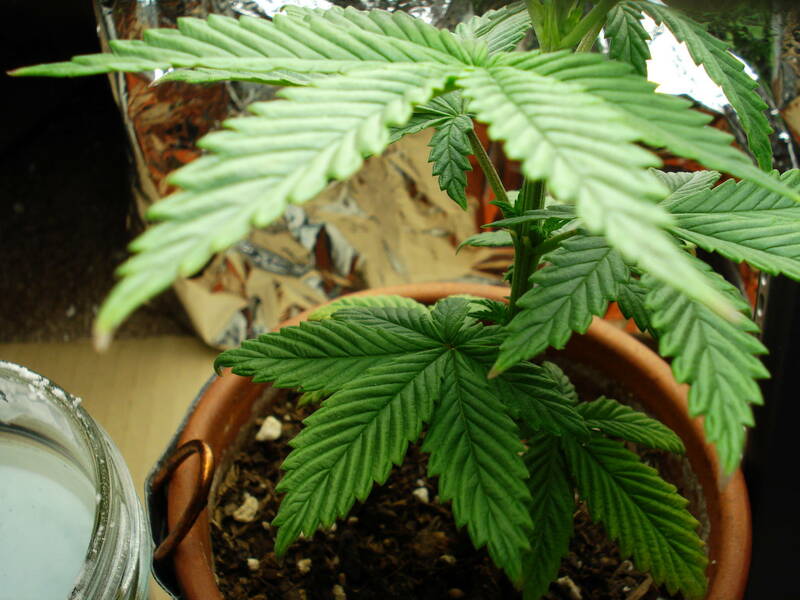 And I want to be finished flowering by at the latest, May 15, 2010 and with my plants advertised flowering period of 7 weeks, that means I have to start flowering at the latest, March 20, which is exactly 1 month from the sacred holiday, April 20. So the CO2 is to "catch-up" on the vegging, a last attempt to get as much growth in these last days as I possibly can. 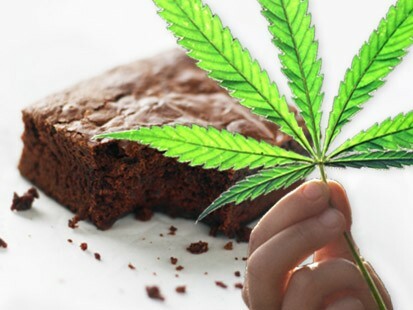 So, my *new* plan is to have some immature budz to smoke by that international holiday. We'll have to see. 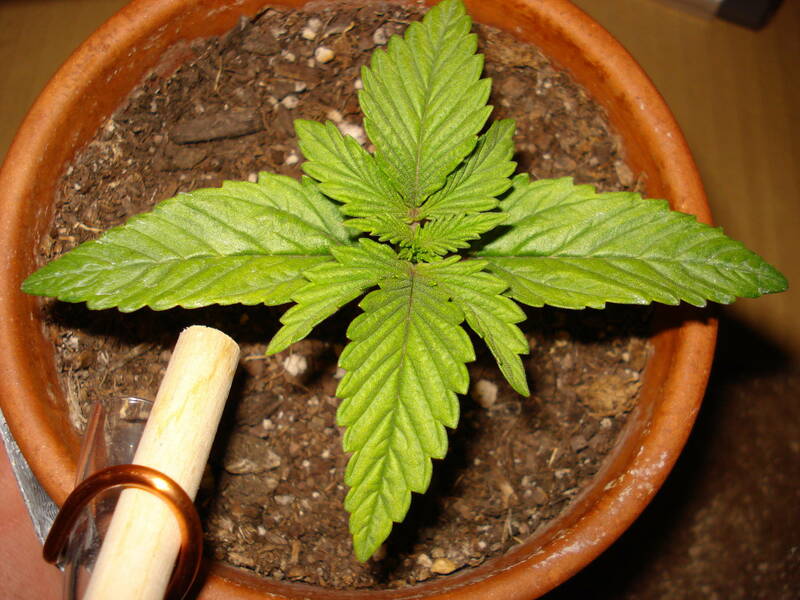 And here's what a difference water does to the plant. Note how stift and "up" the leaves are now....the difference is stricking! ^Didn't post photos because its only one day apart from the day below, so I put the link instead....the original post has interesting dropping patterns you might wanna look at. ^As you can see, the perking/drooping pattern continues to occur on a regular timeline. 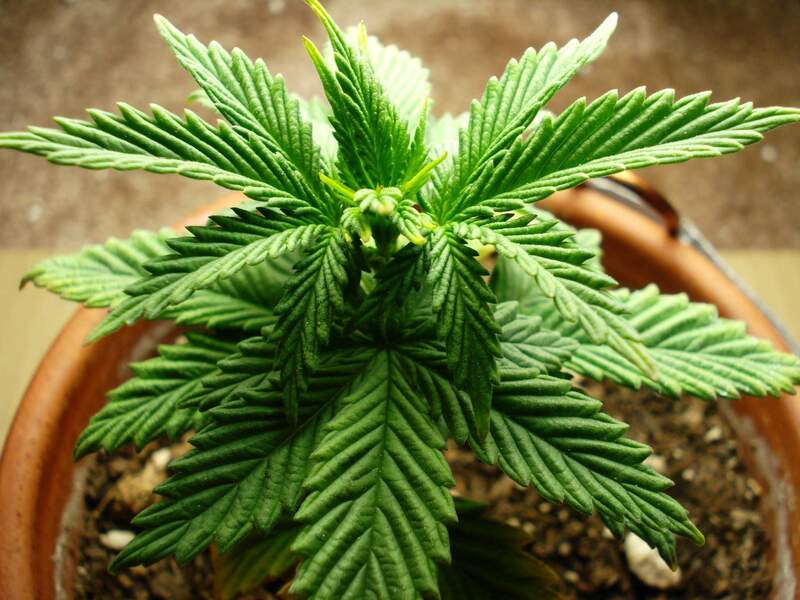 Its at the point where I believe it is just natural rhythms of the plant, and is NOT a sign of ill health. However, this pattern is not something I see with other tropical plants I've grown in my place like palms, so this is all new to me. ^Drooping at its worst (see 1st photo background for date and time). 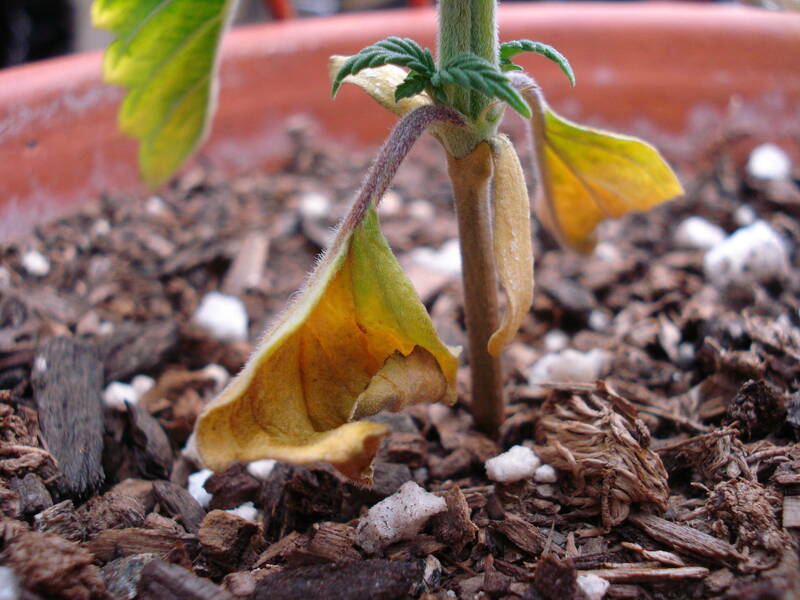 At first, I thought I killed my plant, because the drooping was happening at the stem too, and so was dramatic. 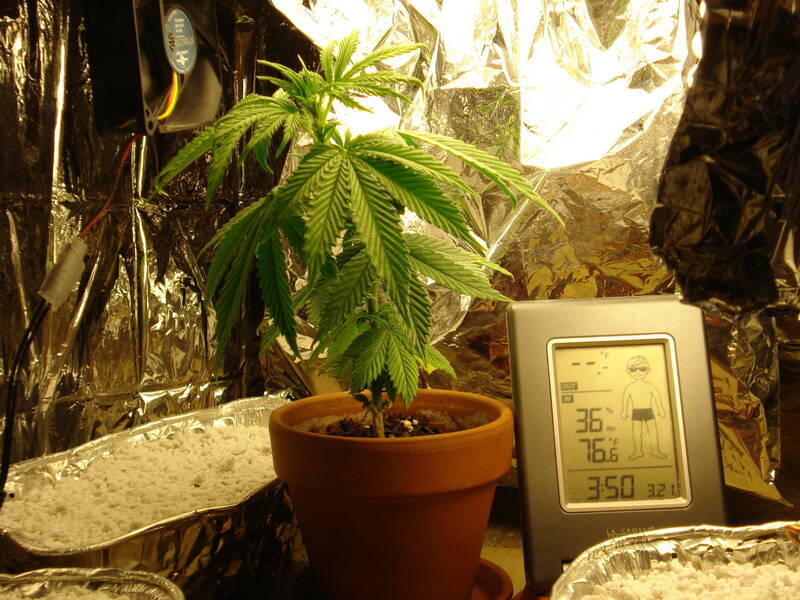 I figured with my new lighting that consists of three 42 watters and one 23 watter CFL (total 149 watts, 42 more watts than during vegging), I might have stressed her with heat. 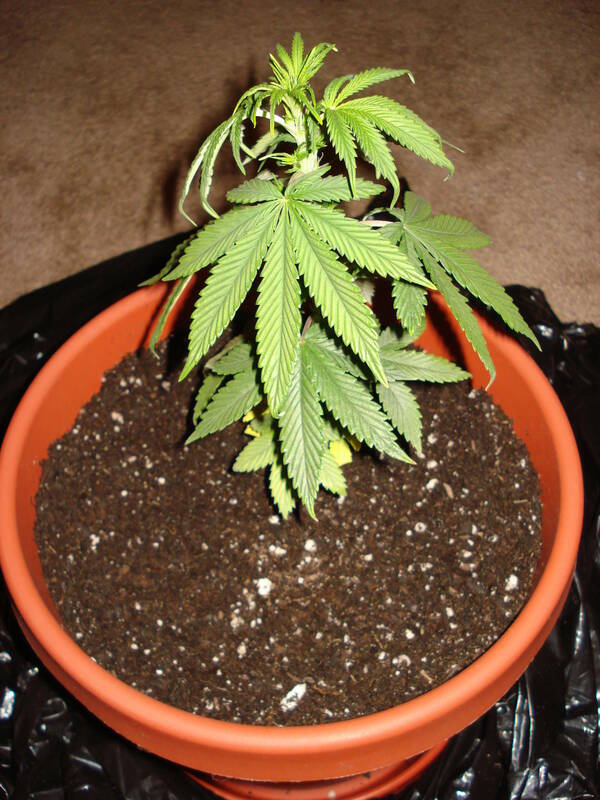 Then, I checked the soil, and it was really dry, even thou I just watered her a day ago. So, soaked the water with the usual vegging mixture, and after about 1 hour, she perked back up, like some kind of magical plant life (last photo on right). 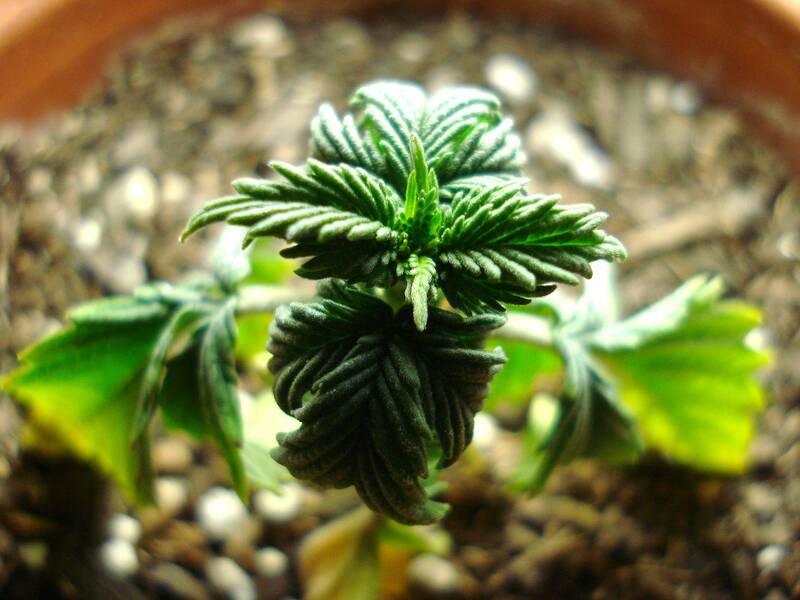 It seems that this small plant need more water than I realized. 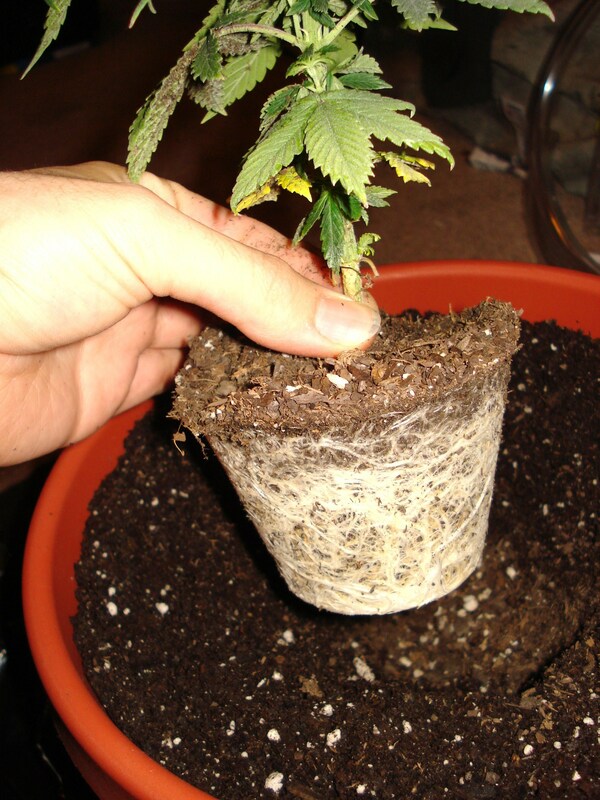 It may be the time to transplant to a larger pot. ^After this photo, I went on a 2 day vacation out of town, so she was on her own. 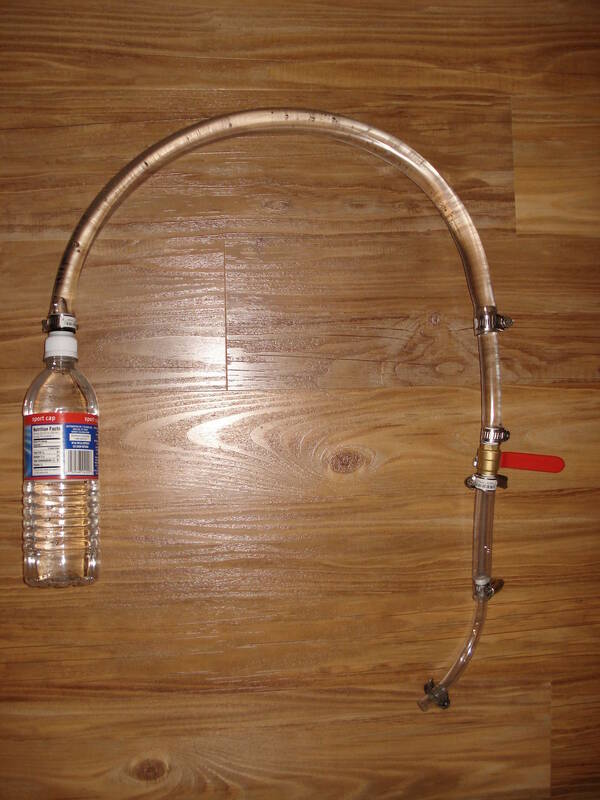 I wanted to use my drip system, because thats why I built it, for vacations, but the T.C. advised against it, so I did the soak-and-leave it approach, and it worked great. Thanks guys. Main Photo: Well, she survived without me. How cool is that. 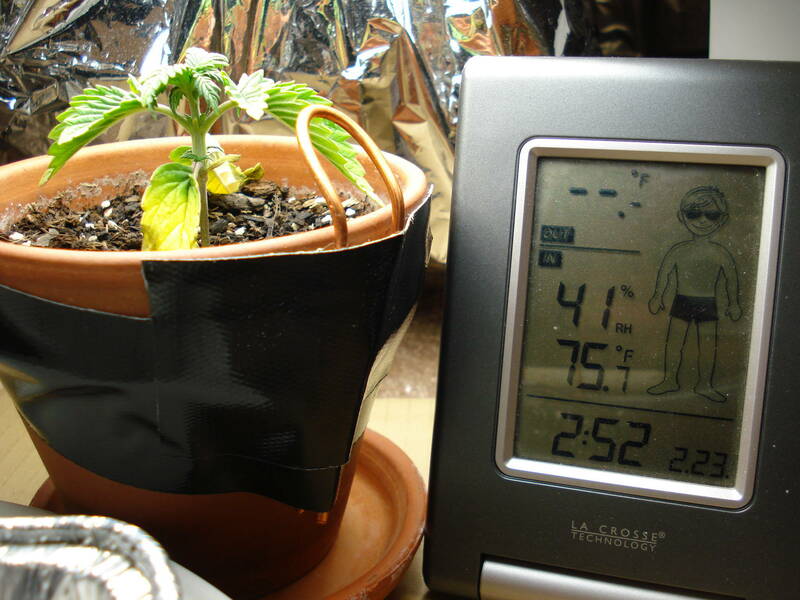 The soil-soaking trick works very well, even for days. In my experience, its a proven method. Drip-system (aka constant water supply) unneeded. 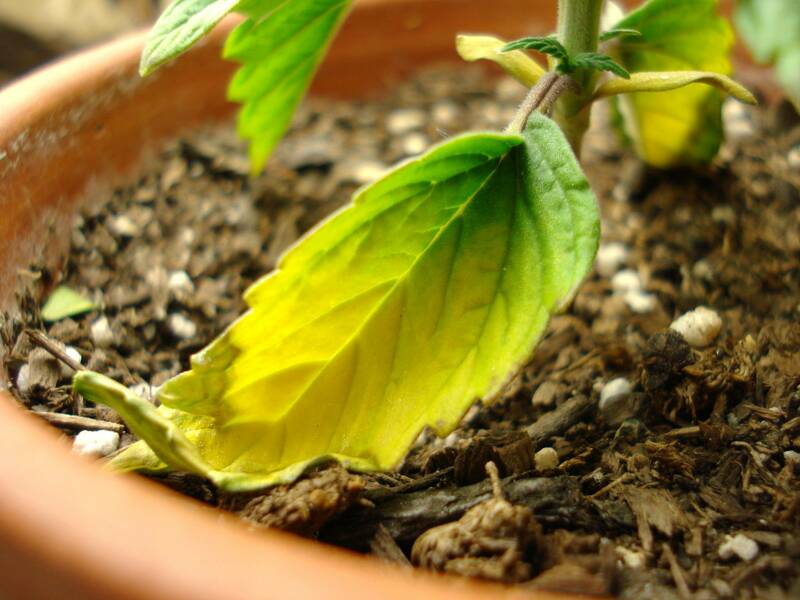 Photo on Right: As you can see, there's some burn damage on just this one leaf from a vertical-hanging 42 watt CFL flowering bulb. I actually had a feeling my left custom-reflector bulb was too close, but I didn't have time to move it over, so I just left it. But the damages is sooooo minor, I don't even care. I think it looks cool, like a battle scar. ^First photo: She's getting so big, its hard to take photos of her. Also, my grow lights aren't helping either. 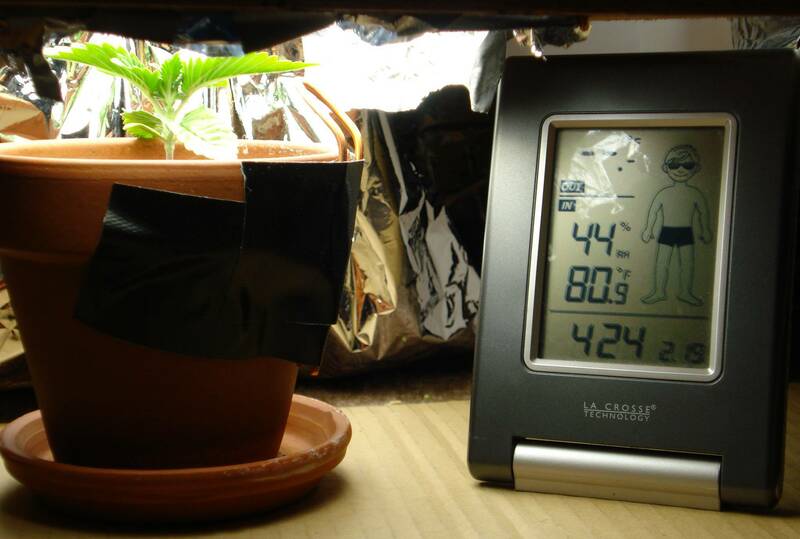 I moved the rH/Temp gauge to the wooden light wagon to make a better estimate of the plants conditions (I wish I had a remote probe). A 1 foot ruler in the bottom-foreground is for reference (Couldn't find my tape-ruler: I hate being lazy and unorganized). She's about 14" tall. 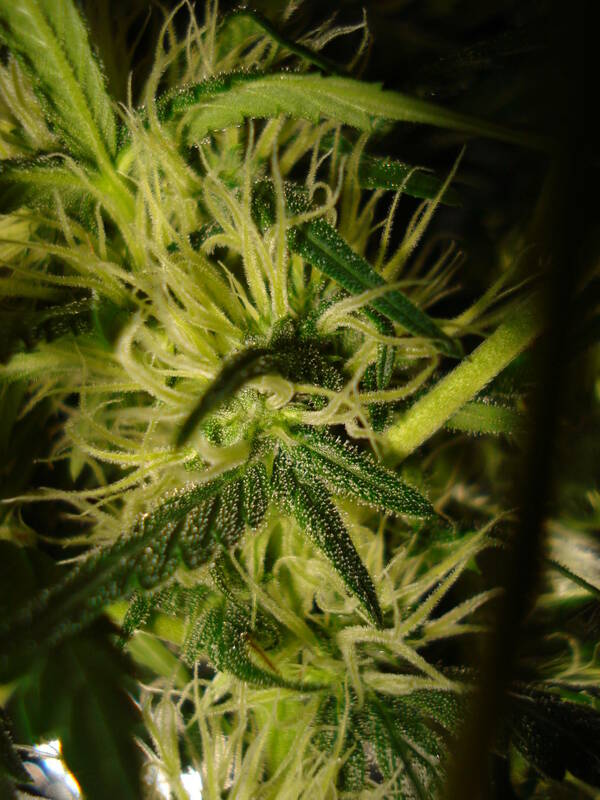 Photos 2 and 3: There's so many little stems and bud sites shooting up everywhere, its crazy. Its hard to keep track of them all. Its cool to see the pre-flowers already: I have an idea what it will look like in the end. Last Photo: same as pictured above, taken April 2nd. Shows the burns of the bulb on my precious girl. 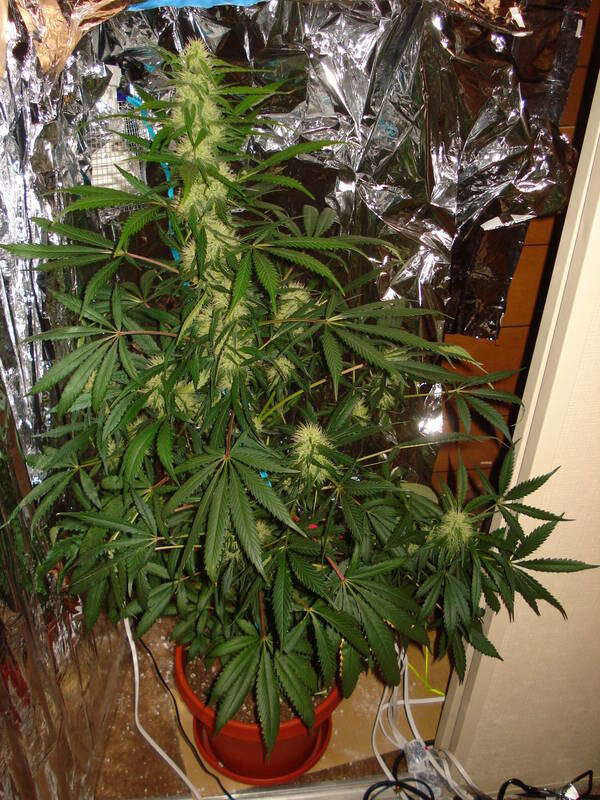 ^Photo 1: Those pre-budz are really maturing fast! Looks so hairy now! 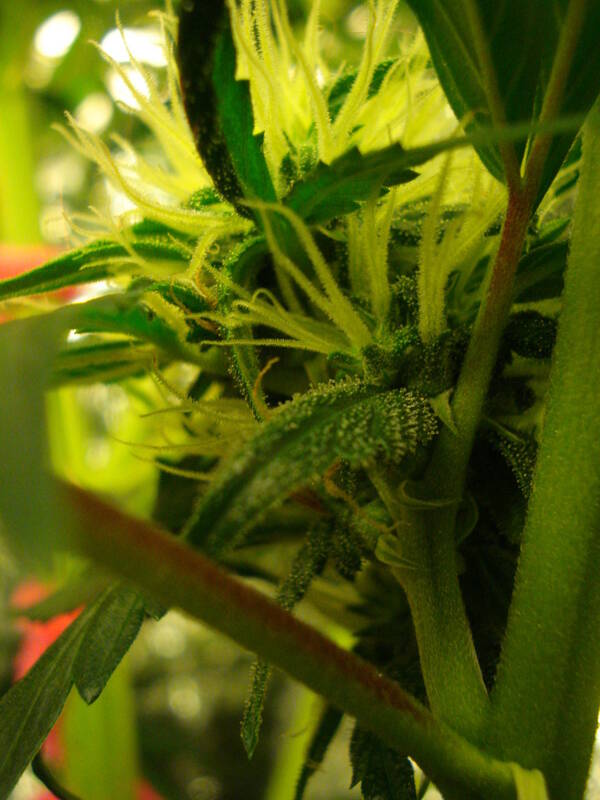 I can even see some Herb Crystals on some of the small bud leaves. Pretty stoked! 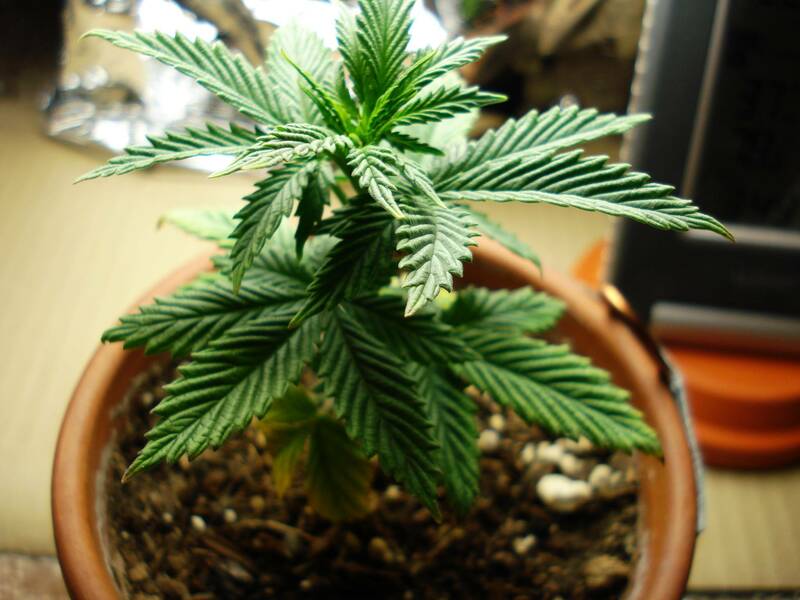 Photo 2: She has been doing A LOT of growing over the past week. I almost have to adjust the string every day! 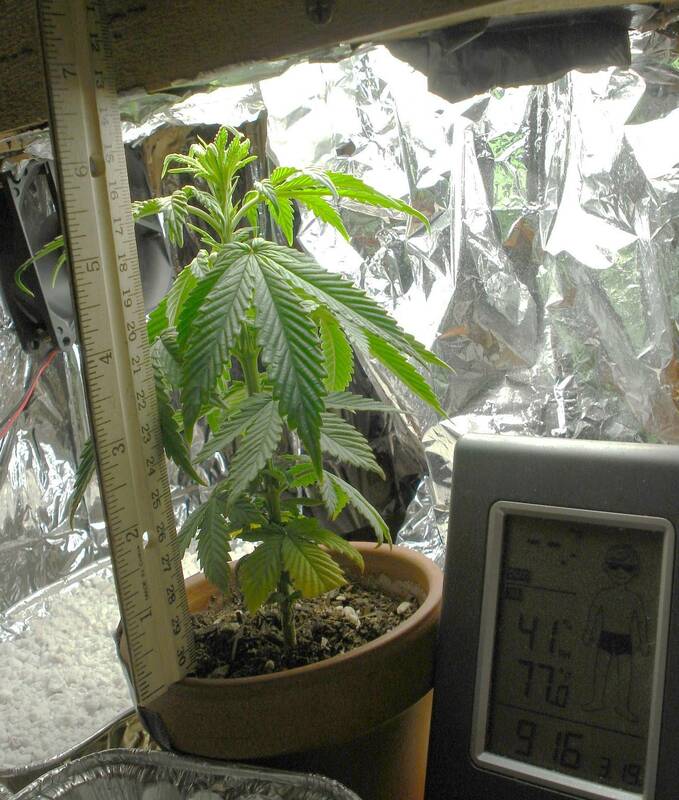 I measured the height: Shes about 28 inches (2 ft. 4 inches) tall now. I will try to measure her every time, because the growth I've seen recently is mind-bogging! 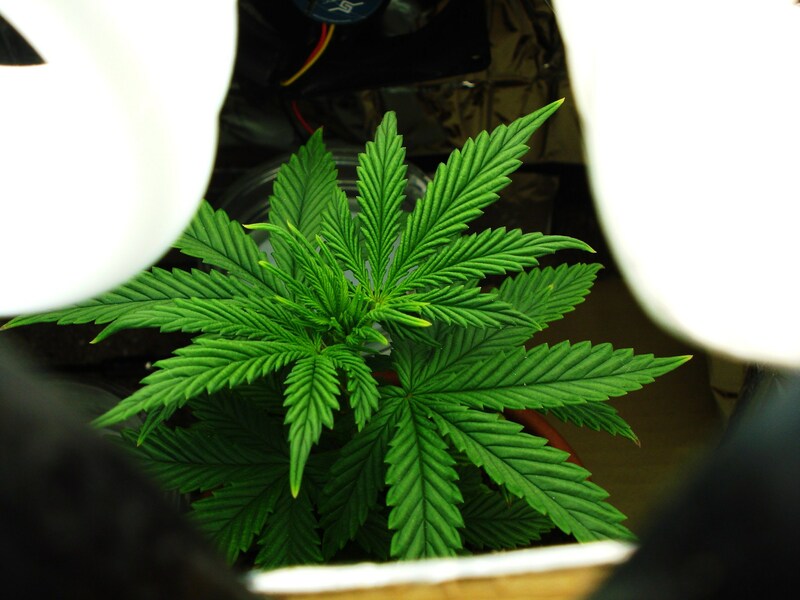 Photo 3: The bottom canopy looks miniature, and is a great example of what NOT having enough light penetration (i.e. 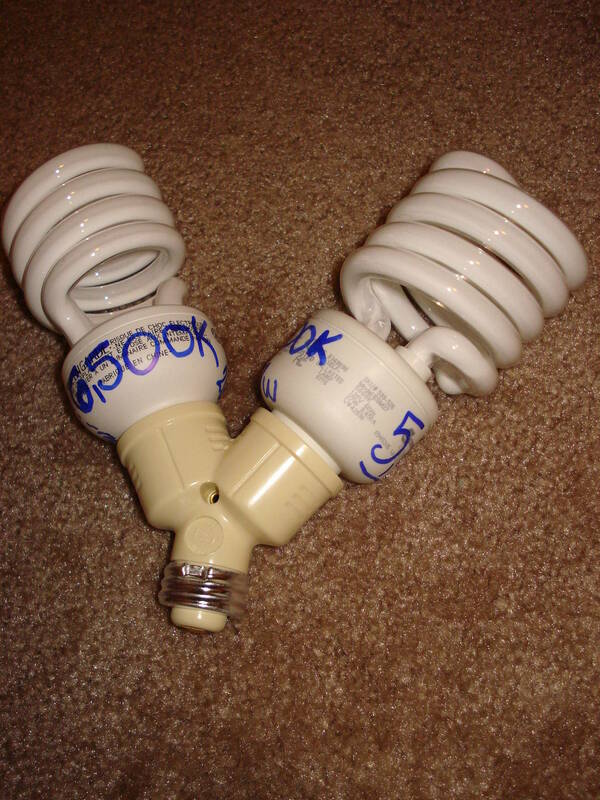 CFL bulbs). Looks like I will be harvesting it a little because it likely won't get anywhere with the little light. From 13ettlejuice's main post on his 'accidental' GrowLog, I got this idea: use large zip-ties to hold up my wooden light wagon. ^So much better! Never have to take off the string again! Its always supported, even during adjusting! Feels so good! ^Photo 1: Wide-view. 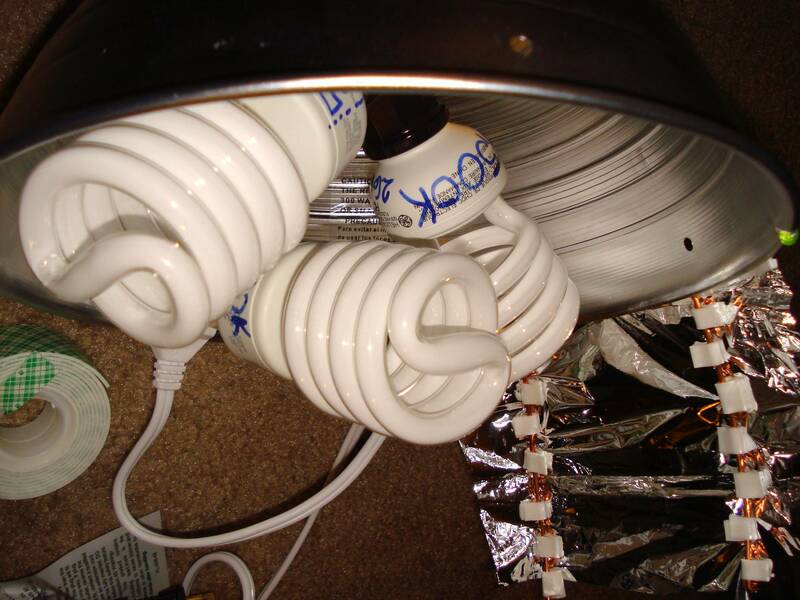 I added another lamp on the bottom with a 23 watt flower bulb, for a total of 263 watts for all bulbs. 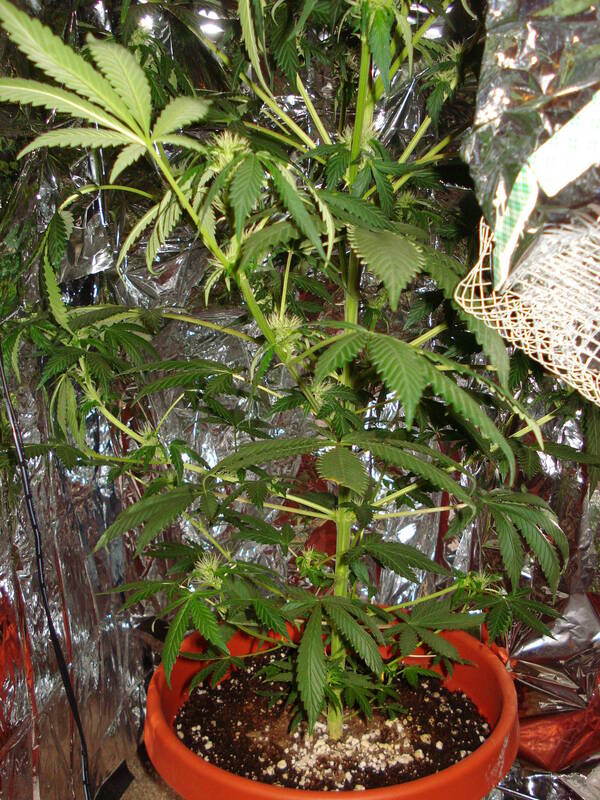 I added this bulb because I will be harvesting some lower budz for April 20 in honor of the holiday, and those lower budz barely get any light (should of trained her ). I know for next time. 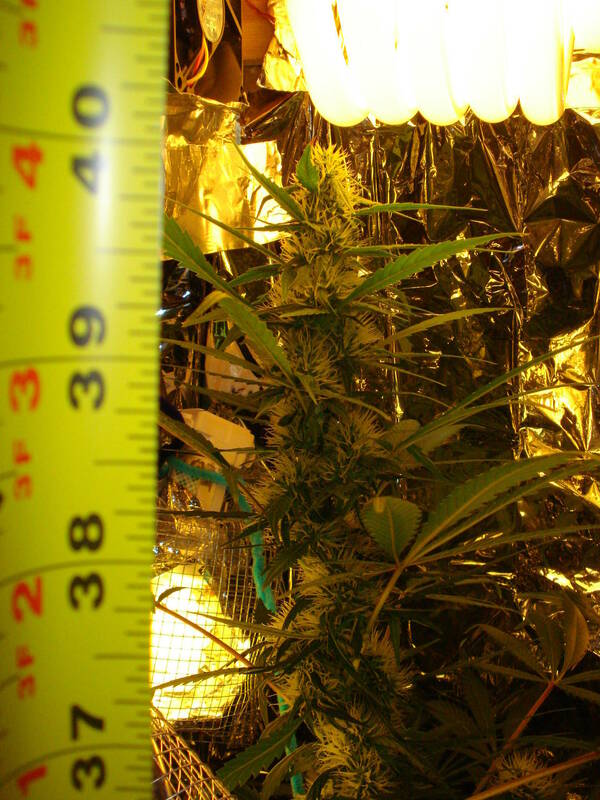 ^Photo 2: Total height is about 35" or about 3 feet tall. This is about a 6 inch increase from last journal. This troubles me, because I am running out of vertical height in my closet. Should I add a 5,000K to prevent this stretching? 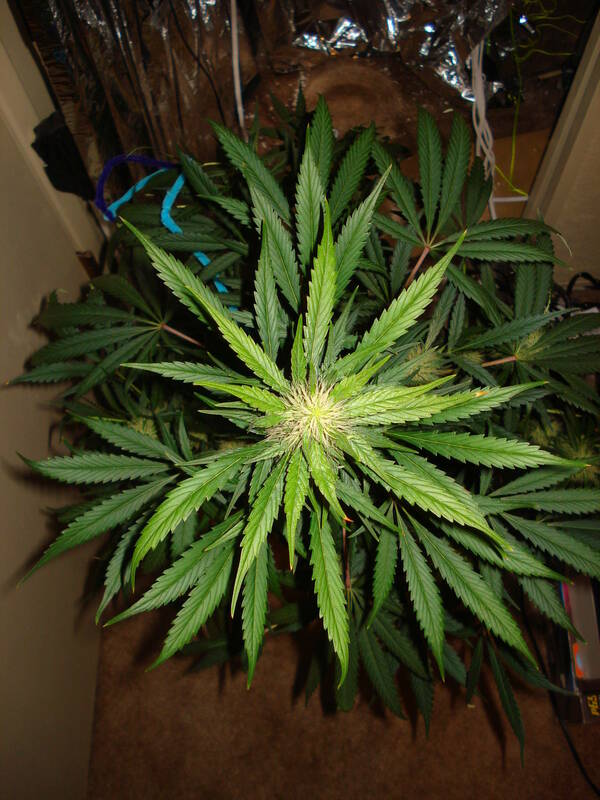 I still have like 20 days left of flowering...at this rate of vertical growth, I'm going to run out of room. Not good. 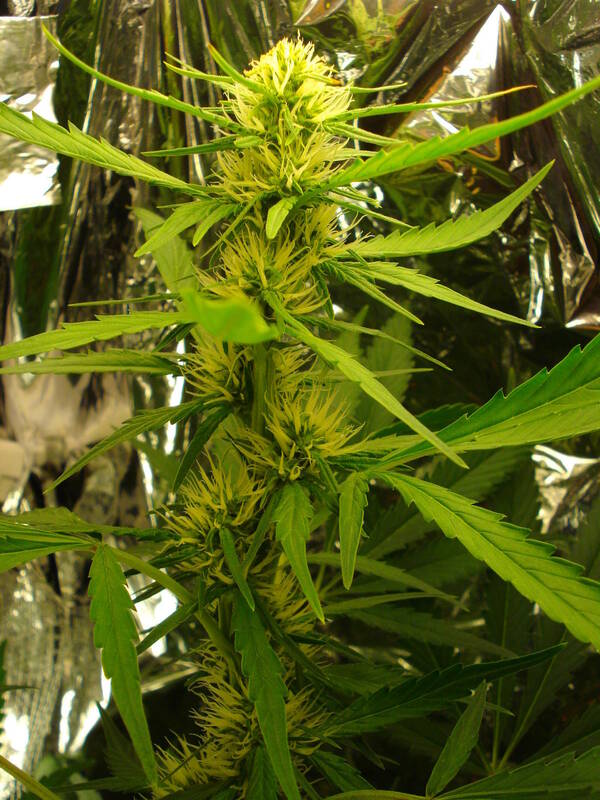 ^Photo 3: Main Cola (is that the name) is looking lovely. Lots of white hairs everywhere. Fan leaves are looking healthy too. Only bad thing is the top got kinda burnt because of the super-fast vertical growth. But it was minor damage. 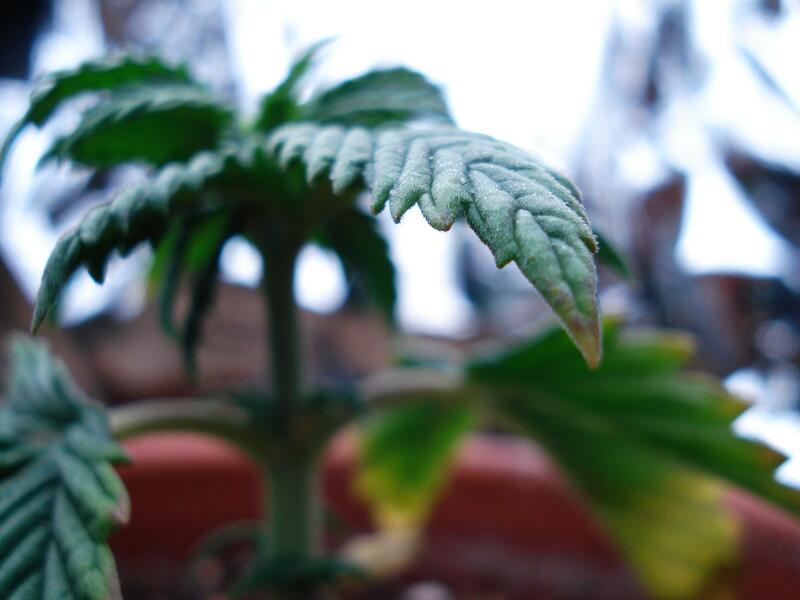 ^Photo 4: One of the mid-height budz. 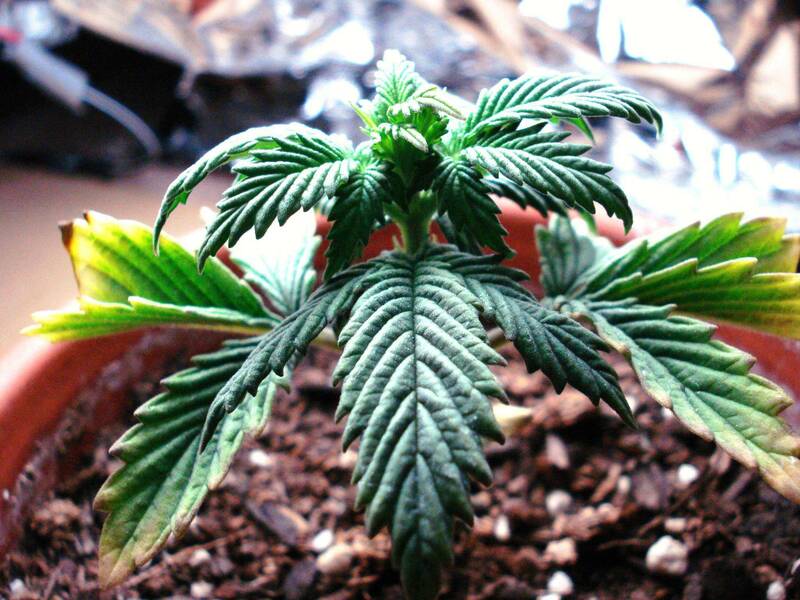 Only young bud with these dark tips. All the rest are white. Not sure why. 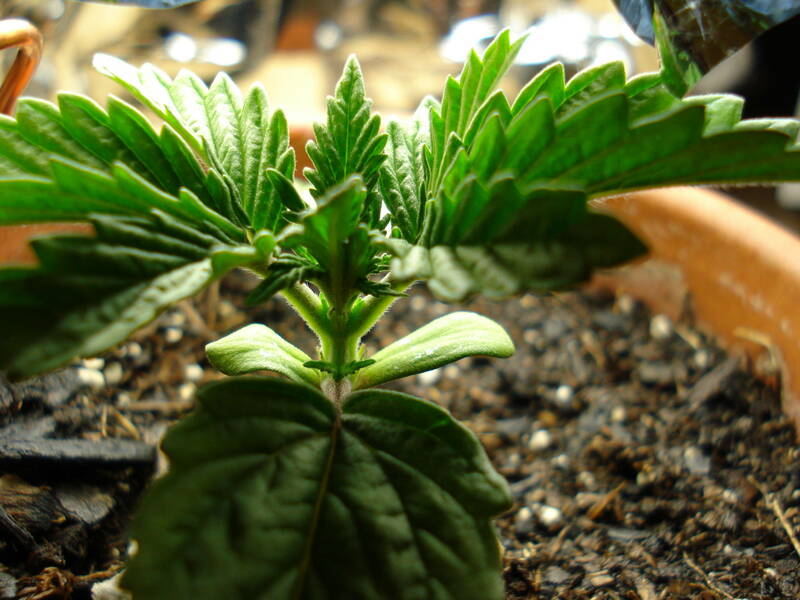 This will be my first grow (when it starts), and I've always wanted to grow my own all on my own, and this is my attempt. 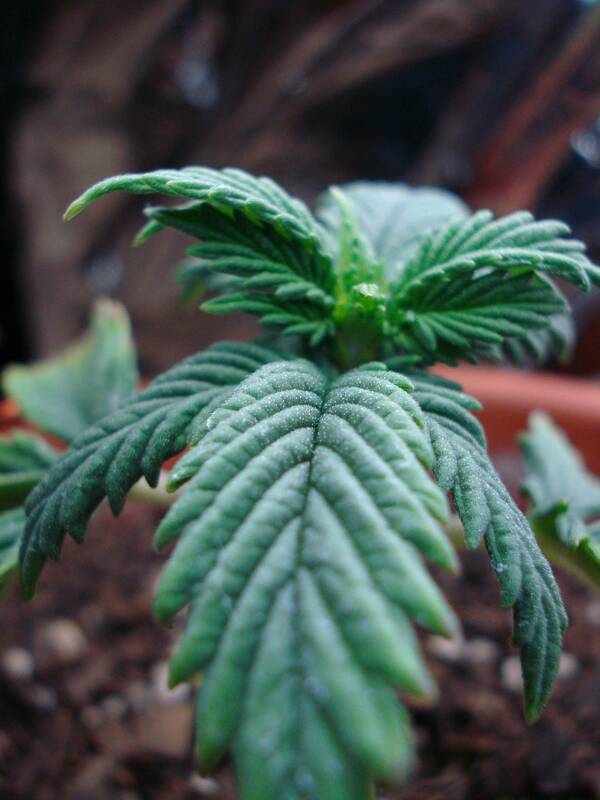 My dream goal for my first grow project is to time it so that when its time to harvest, it will be *right before* be the best International holiday, 4-20 Day, aka April 20 and have a nice abundance of fresh budz that I grew myself. 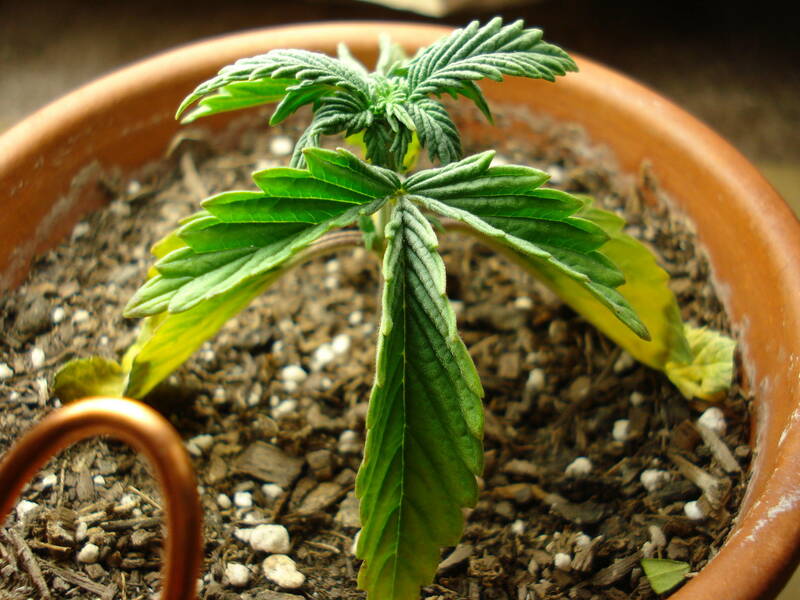 Unfortunately, I've starting this project a little too late (should of germinated in January 1) because budding usually takes a minimum of 2 months (depending on strain), plus a minimum of 1 month Vegetation, so I won't make my Dream Goal on time. 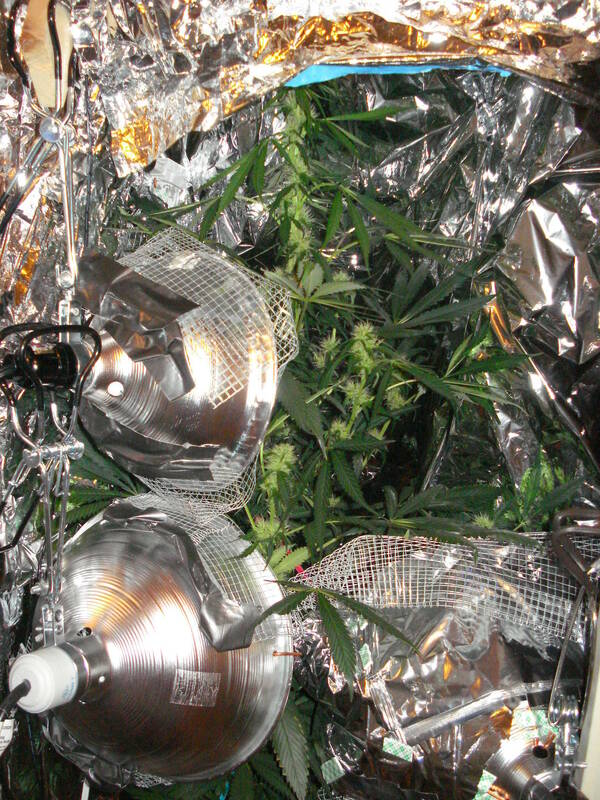 Plus, drying out the flowers takes time, so I could be way off.to make it weeks before 4-20, so I can dry out my budz. I should of starting germination back in January. 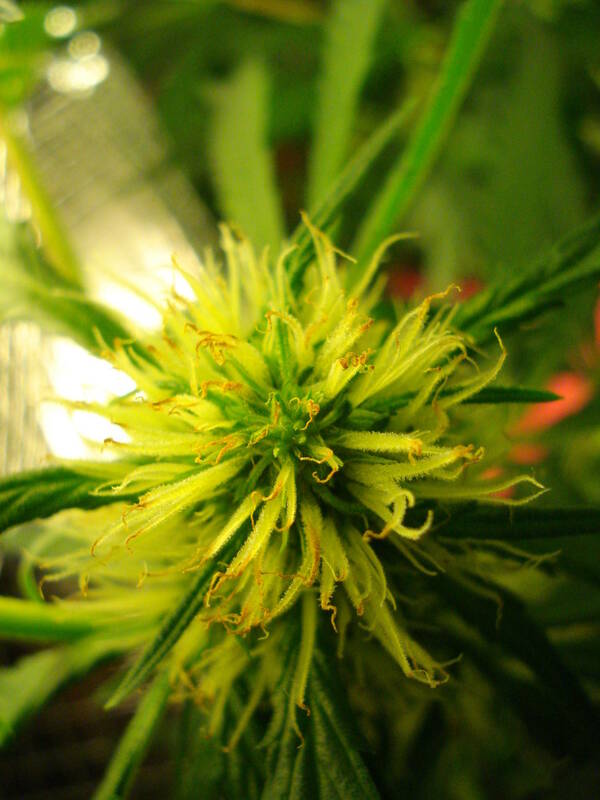 Because of this tight time-scale, I will be searching for a strain with the shortest flowering (with agreement with my budget, of course). 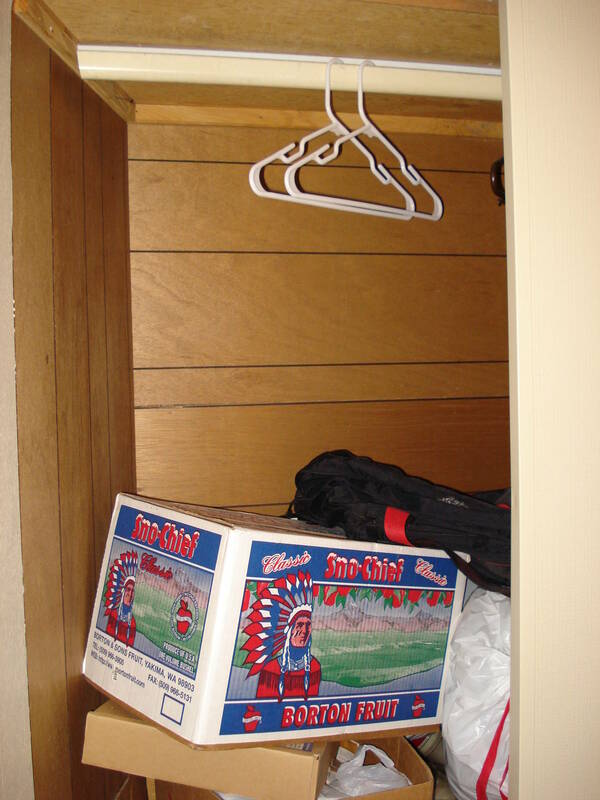 Here's the closet I plan to use for the project (its needs some organizing: its a little messy right now). That hanger "bar" was tricky to figure out since its not a typical round bar, but more of a metal rail. To hang stuff, I'll need some strong "S" hooks. 4 x 6 ft Extension cords for each bulb independently. 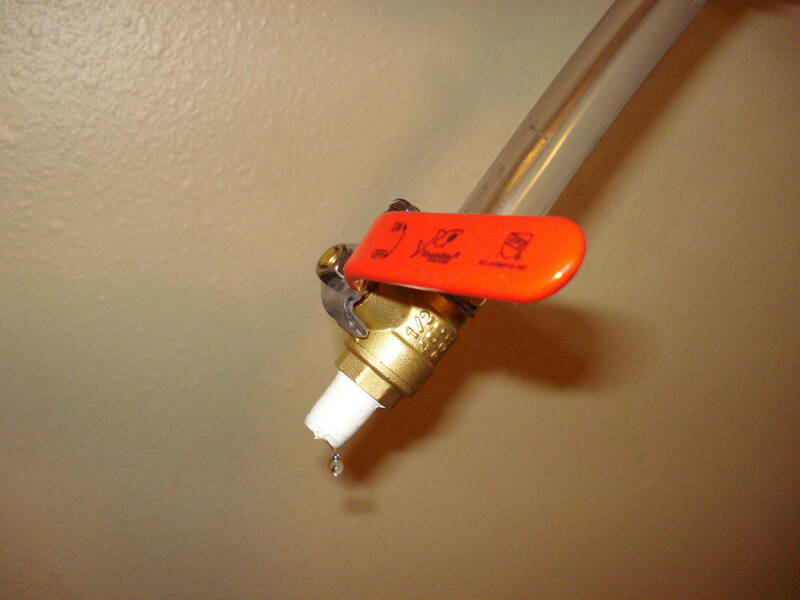 1 barbed brass On/Off ball valve (to control drip rate, and to fit inside tubing). Various lengths of string to hold up the hoses and bottle. 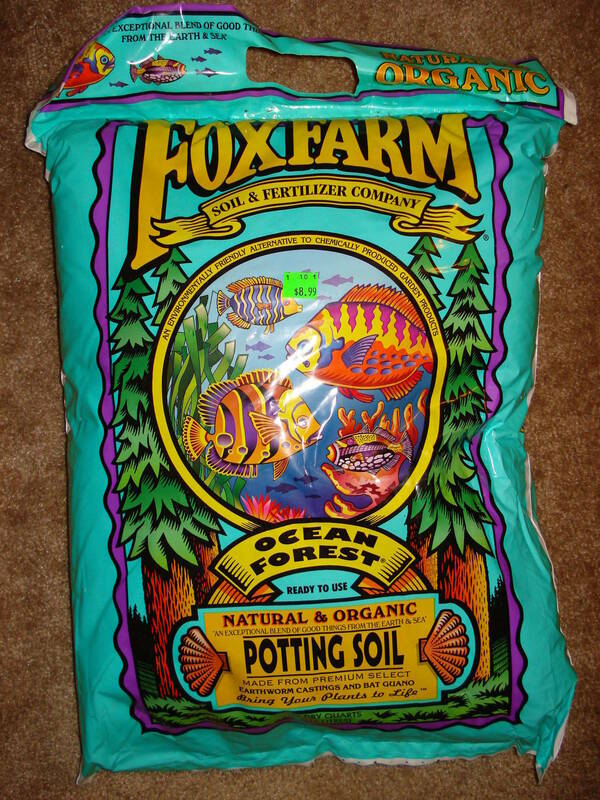 Bag of FoxFarms(R) Ocean Forest Soil. 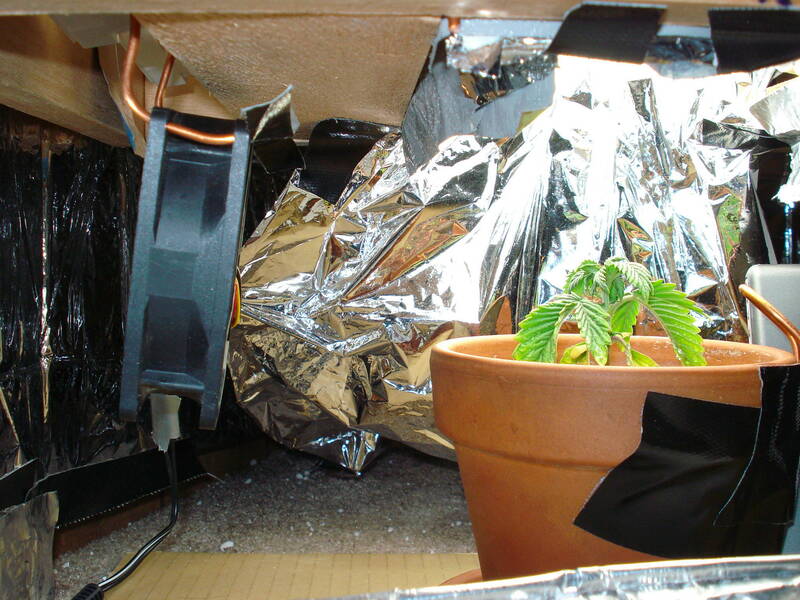 For Plant: 1 x 80mm PC fan set on a 12volt, 1 amp adapter. 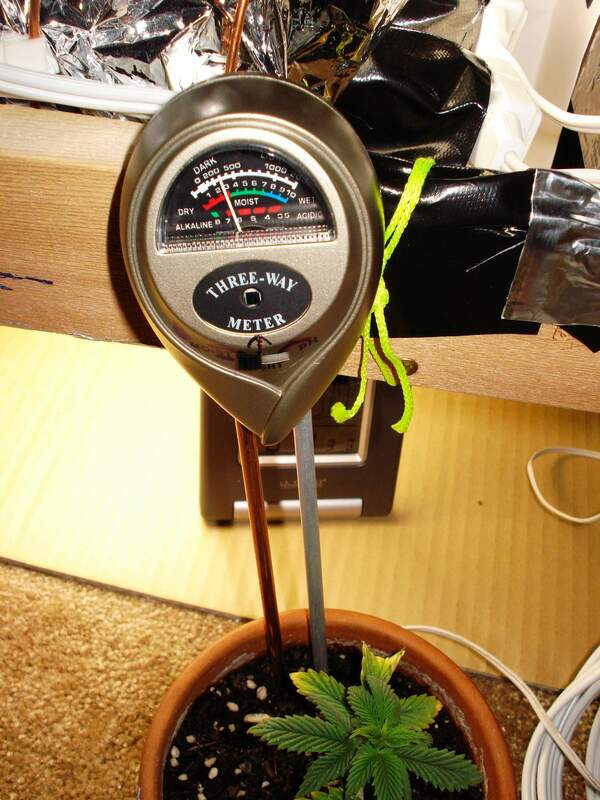 This small fan is also used for strengthen the stem. 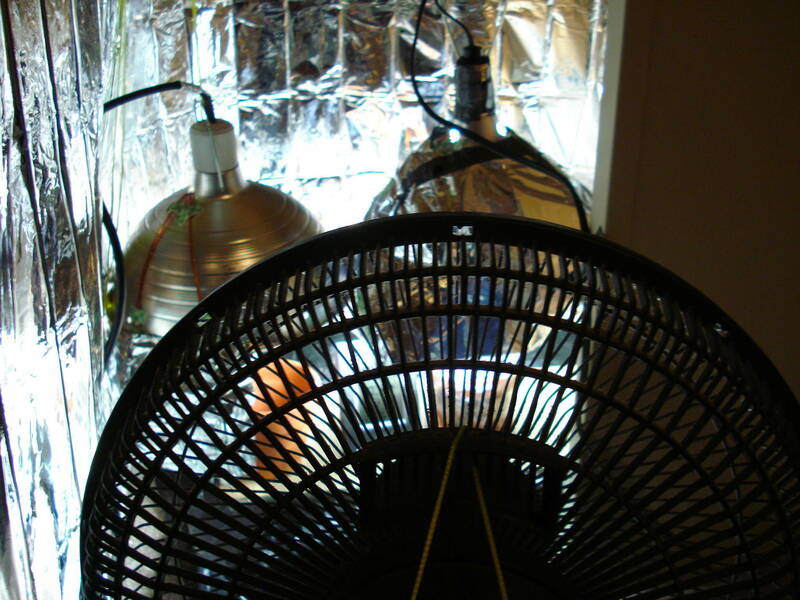 1 x 12" oscillating fan that runs during the light cycle only. 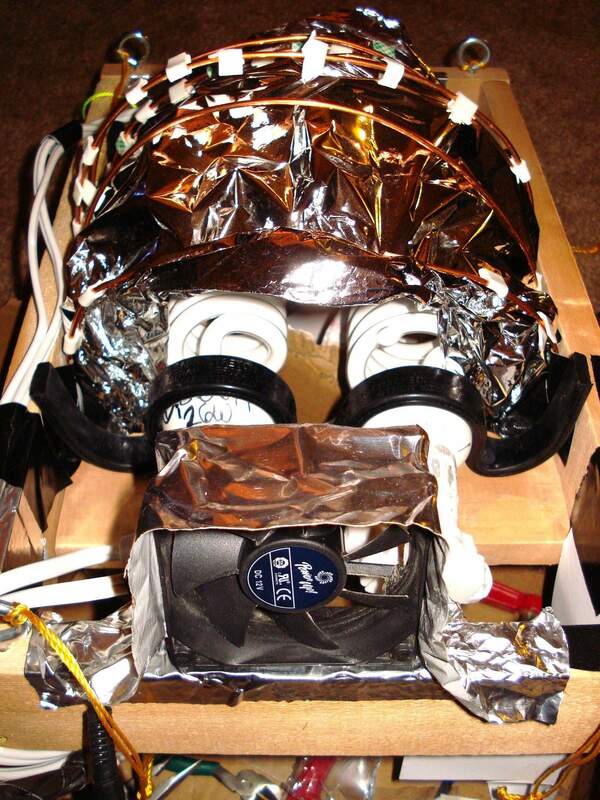 For Lighting: 1 x 80mm PC fan set on a 1.5 amp adapter positioned right near the bulbs. That's much more than my "hopeful" $40 (not including seeds). 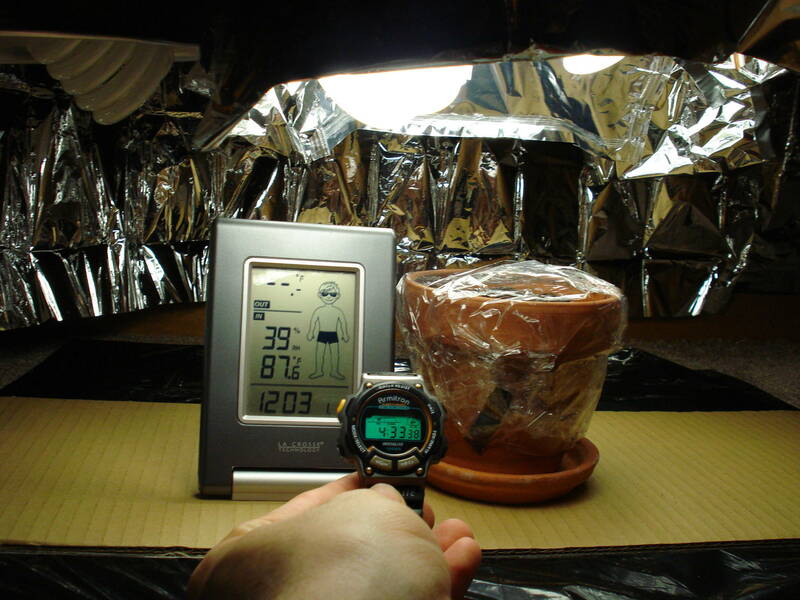 The good thing is I already have some 24-hour timers, I own a desktop fan, I already own black trash bags for stealthing, I can use string to hang the light/water systems, and clays pots and soil is pretty cheap. So, I would say, I basically have everything. ...What do you guys think? 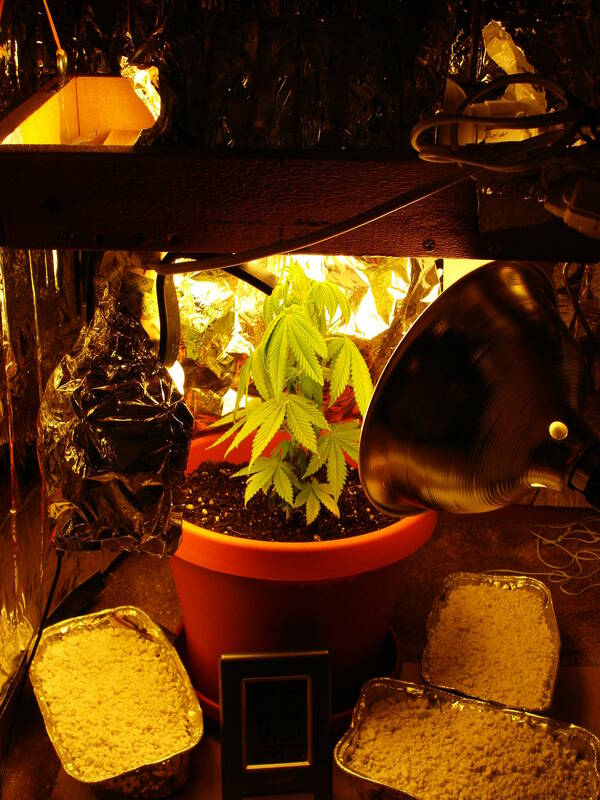 Is this a pretty good budget grow or does it need much improvement? 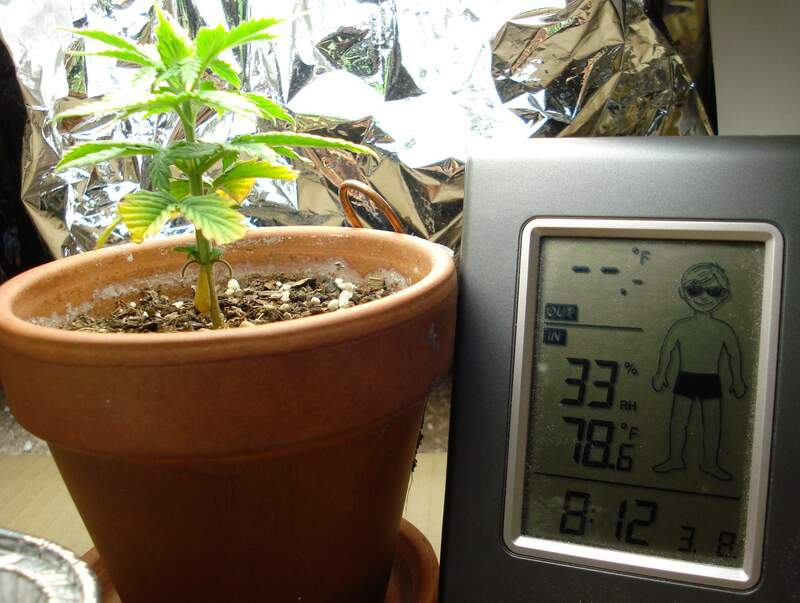 First Grow, Here we Go! This should be interesting. Best of luck! I hope its interesting Mr. Brow, but in a "Wow, that was interesting!" and not "Wow, he really failed, big time!" interesting kind-of-way. And thanks for the Good Luck! I'm gunna need it, for sure! Well, I've been working on my drip-system, and I found some interesting problems with even more interesting (and better) solutions. To get the water to flow correctly, I had to first modify the end of the pet water bottle to remove that little ball-bearing. -> Now I had to get the ball-bearing out. Time for the hand saw. -> The sanding didn't help at all with the sawing of the stem, so I skipped it and tried Plan B: fold back the "lip" on the end of the tube with a pair of pilers. This didn't work either, but any measures. The steel is too thick, I give up. So, I realized that I didn't have the right tools to cut that metal. Also, I found out that the Outside Diameter of the tube is much *smaller* than I expected. 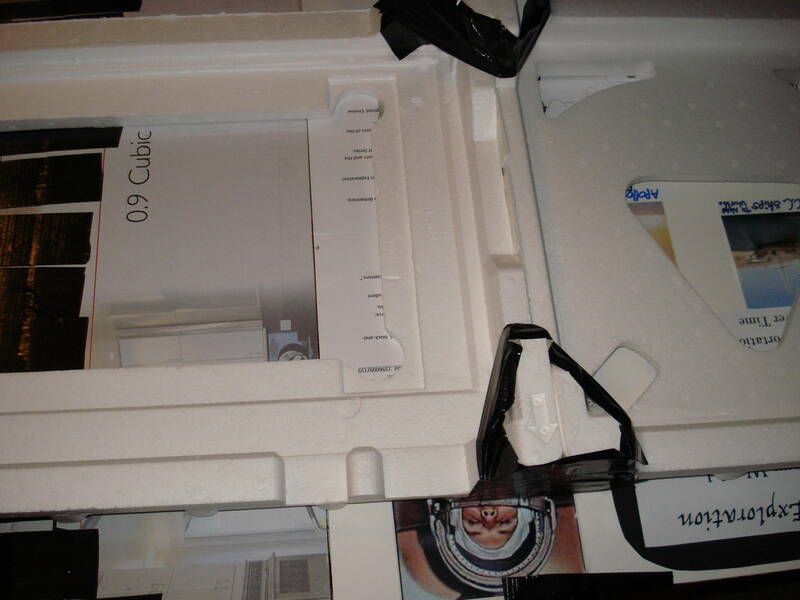 I tried the tube on there with clamps on full-tension: it leaked. I'm giving up on the Pet Bottle. After careful searching, I found an old one with the top cut out. I had turn this specific tub into a ghetto cooler, and believe me, it works great! 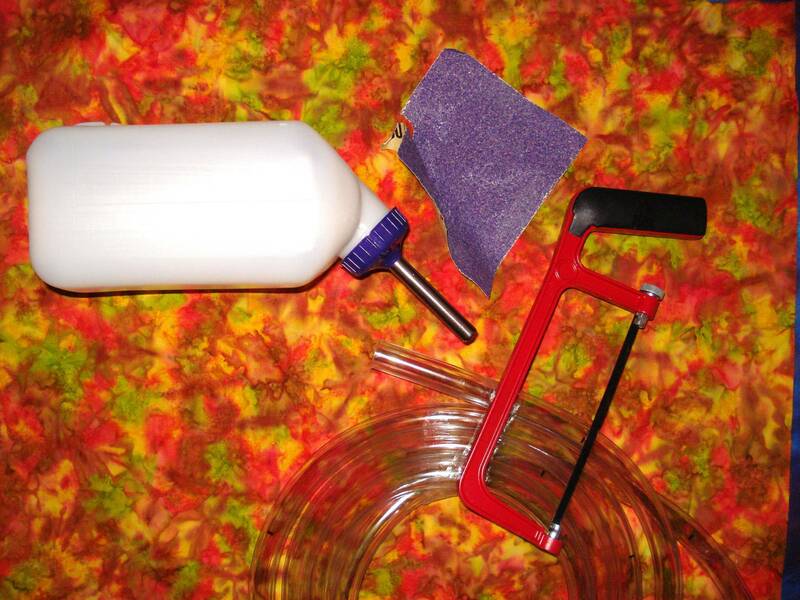 Its got a handle, its cheap, durable, and there's a valve to drain out the melted ice. -> Then I cut the tube so its only 5 inches, then I put A LOT of Telfon(r) tape over the barbs because it fit *very* loose inside the tube, even thou its supposed to fit tight in there like a shinny glove). 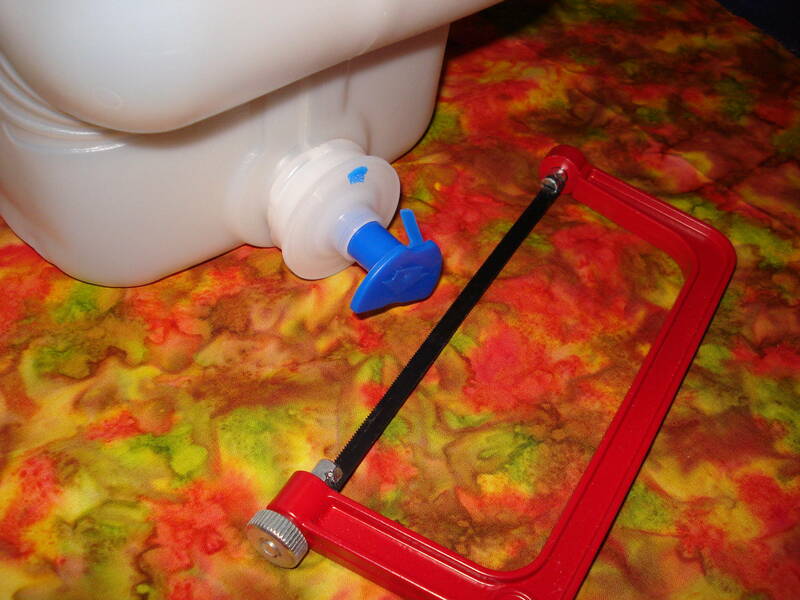 Then, I tightened those metal straps, and then tested it by filling the tub with water. It held the gravity pressure very well! -> Here's the final product. Here I tested it to see if I could precisly get a small drip by playing with the 1/4 valve. 1) The best thing, the stem is almost exactly 1/2 in diameter. But, I recomend puting some Teflon(r) tape to waterproof it *completely*. 3) Its much easier to modify because the stem is plastic (and not chrome metal like the Pet thingy). 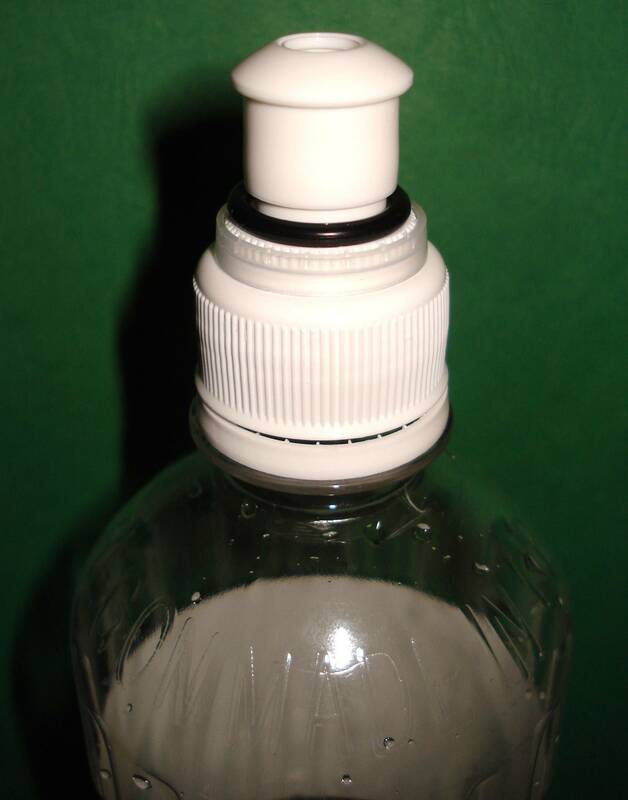 3) Stem is NOT fixed (it moves back and forth) unlike the stem on the pet bottle which was fixed in place. This makes it hard to install the tubing, because it moves inward while I tried to put the tubing on. 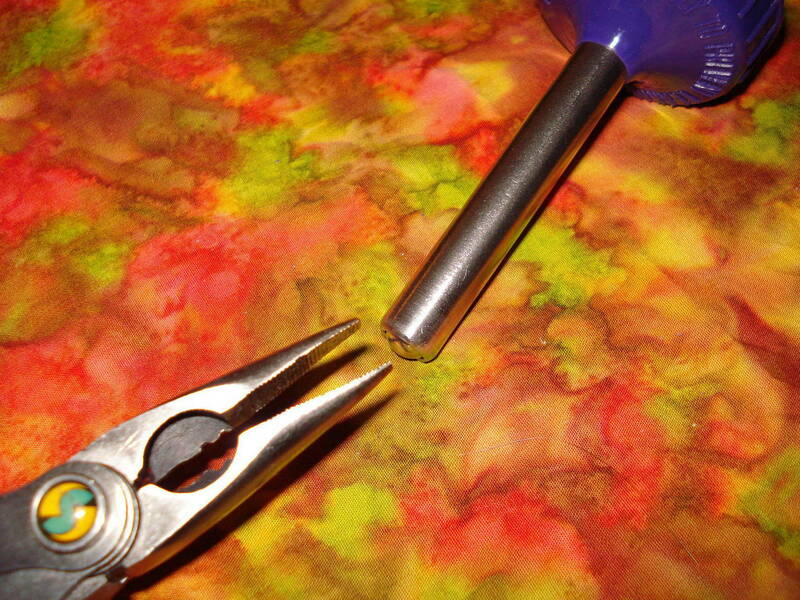 Involving a flathead Screwdriver on the inside of the tube to keep it still while you force the tube on the stem. 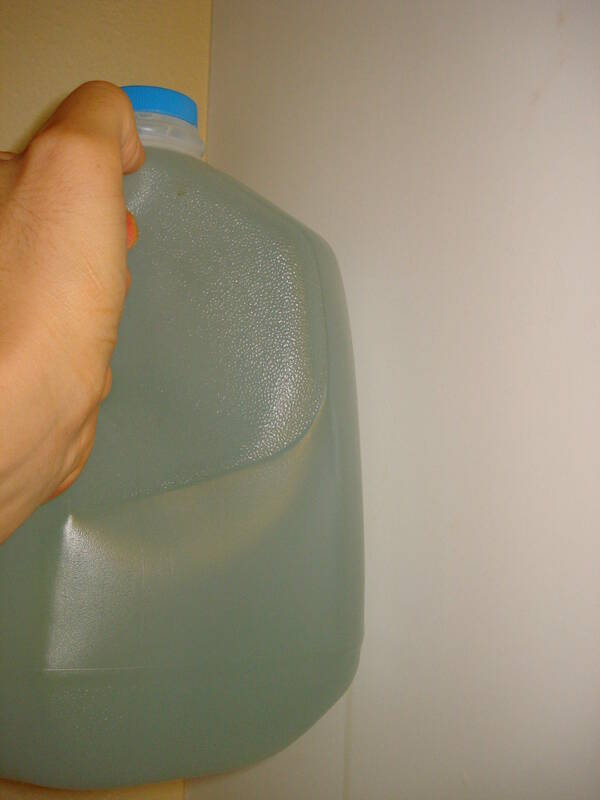 5) Because of the large size of the jug, if it leaks or spills, there will be a lot of water spillage on the carpet, which would be disaster. So, mostly the stem is not as good as the other pet one, but at least its the right Outside diameter at 1/2" wide. 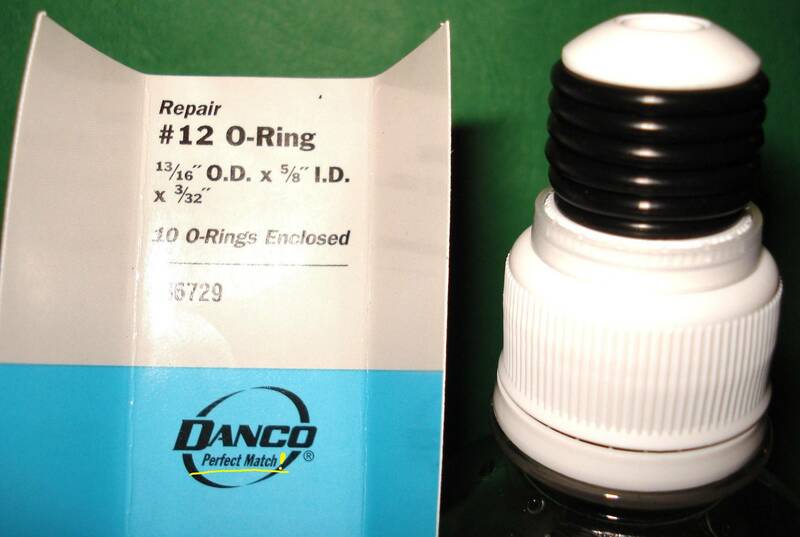 The 1/2" diameter is a common size for tubing and valves, which makes it nice to find parts for. Overall, I like th jug. A much better alternative. On Wednesday, I'll set-up the closet (gotta clean too) with all the life-support systems along with a random tropical plant to make sure my set-up can support life. 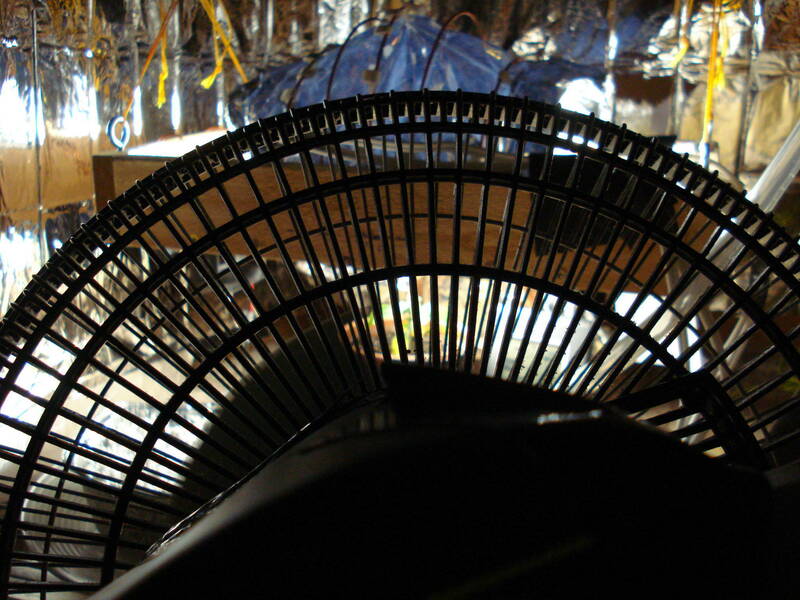 Status Report: Light, fan, and stealth system installed and functional. 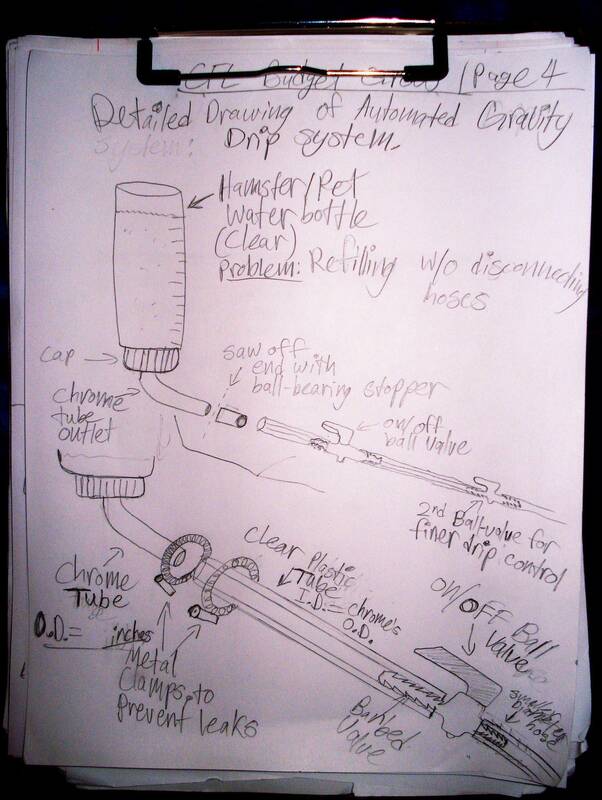 Gravity drip system yet to be set-up. 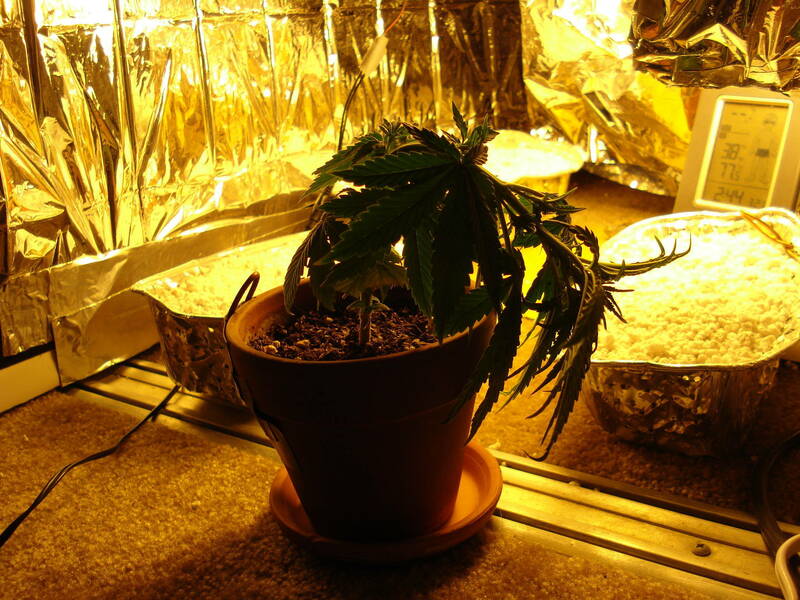 "I think you're going to want at least 100 watts for one plant (the CFL wattage, not the incandescent equivalent). ....I knew my 1 - 42 watt CFL wouldn't be enough after reading this quote by the planet man. Also, I noticed that the color temp. 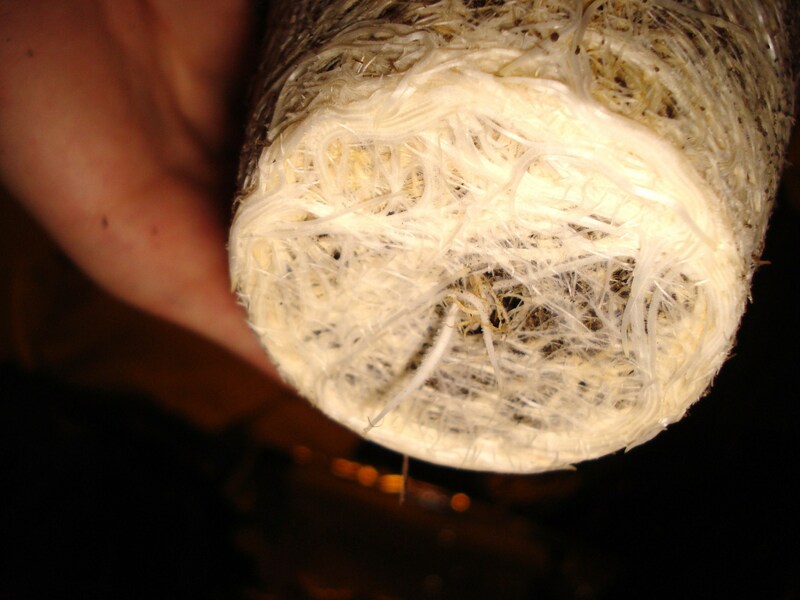 on this 42 watt was 2,700K called "Cool White", which is good for budding but not vegi-growth. So, I went to Homey-D and looked for a 42 watt in "Daylight" color temp., which is typically 5,000K+. 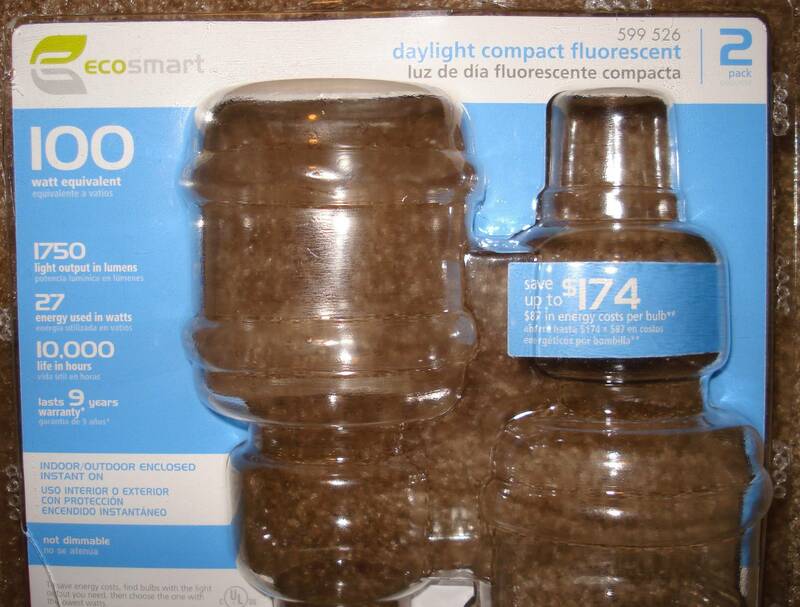 The problem is that I could only find a 27 watt model in the "Daylight" color type, but they were *really* cheap at $1.50 a 2 pack, which as nothing short of awesome! ^ Color temp. 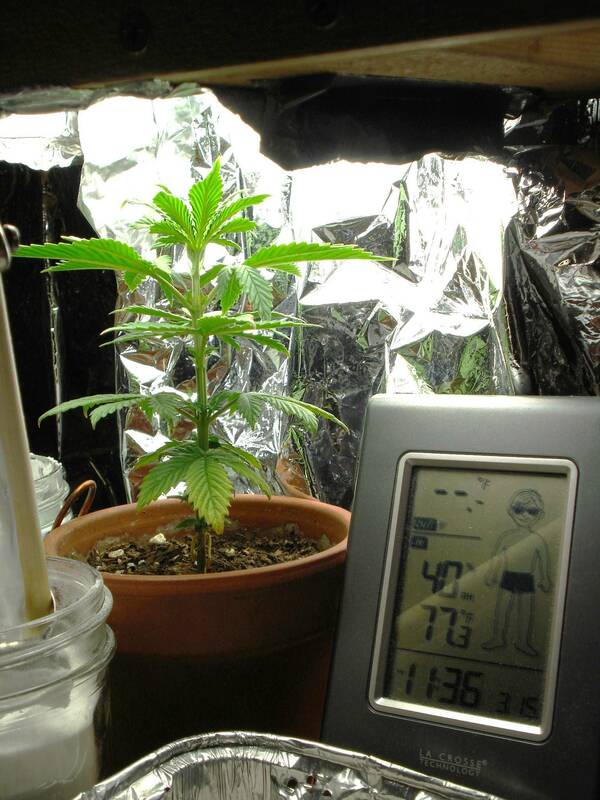 info is in the top-left corner, wattage on the right (the large "100" is the equivalent, NOT the actual wattage). I also bought another reflecting dish, but this one is smaller at 8.5" diameter. 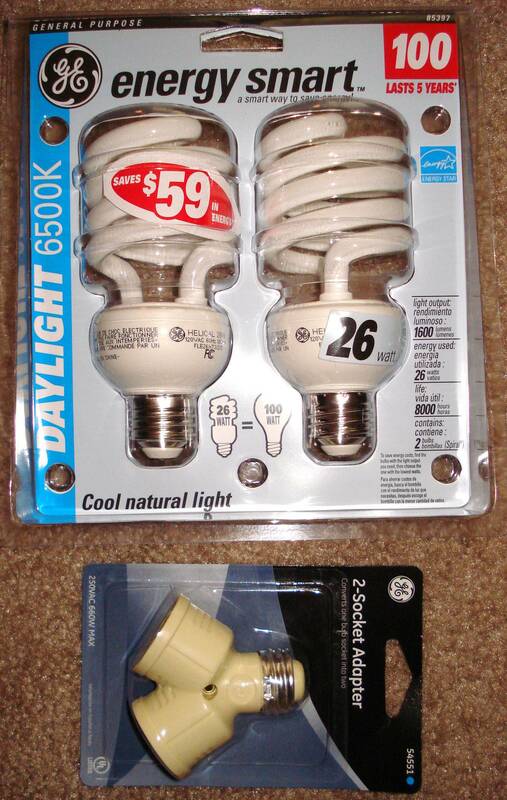 I got the smaller one because these "Daylight" bulbs are smaller than the larger 42 watt CFL's I bought. 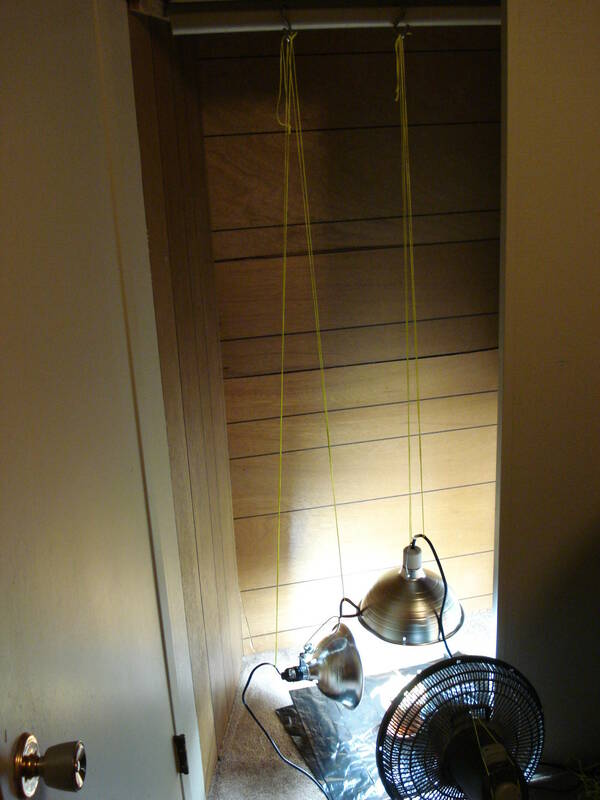 I installed both 27watt "Daylight" CFL bulbs in the the lamp clamps, then hung them up using construction string. ^As a stand-in, I'm using a dead tropical plant I had living but died when I went on vacation. 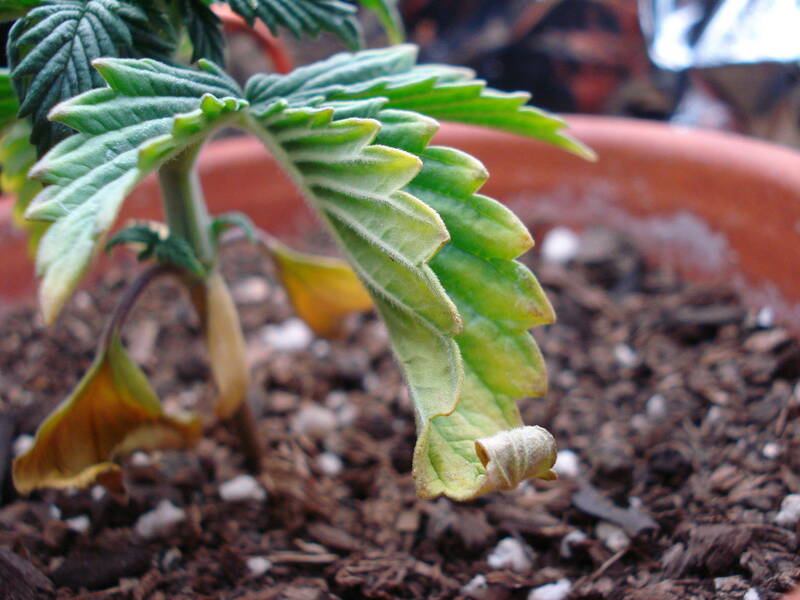 I'm hoping this plant I'm using for demostration doesn't become a metaphor to what happens to my *actual* M.J. plant that I attempt to grow. Since the lights were in place and functional, I could now work on stealthing it. 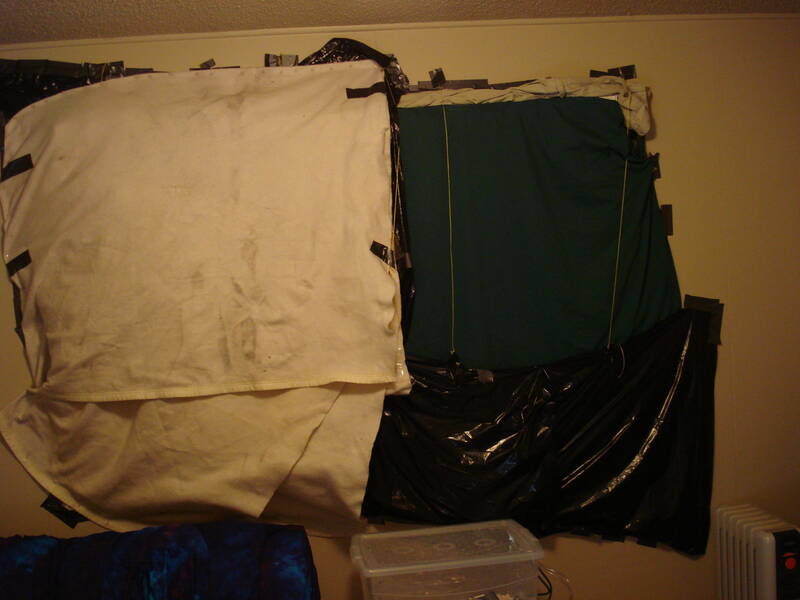 I used 2 large black garbage bags, a tri-pod and some duct-tape to cover some of the light hitting the window in the room. It works pretty well, even thou its really simple and doesn't cover much. ^ As you can see from the photo, the light is *not* on the window, but around it. This small light-blocker works perfectly! I'm glad it was easy to set-up and didn't cost anything (since I already had the materials for it). I'm happy with it so far. 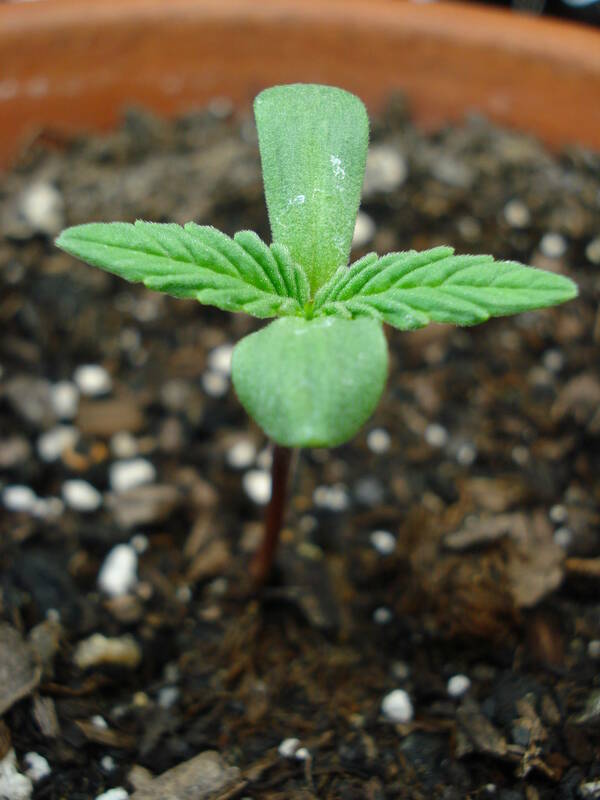 I've found a website and company close to the Pacific Northwest that I have been searching for hours looking for the right seed (they have A LOT of seeds). I will not speak of the website name (in case that's againist the law), so the company shall remain nameless. However, I will discuss some of the statistics they provide for the seeds I'm interested in getting. - Cheap. $10 a seed or less. 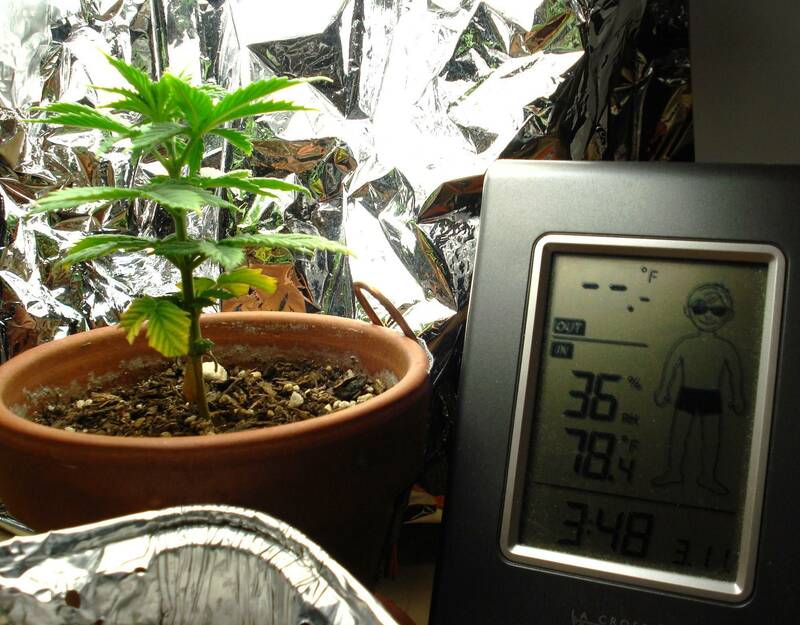 Indoor yield: Up to 100 gr indoor with 35-45 days of veg." 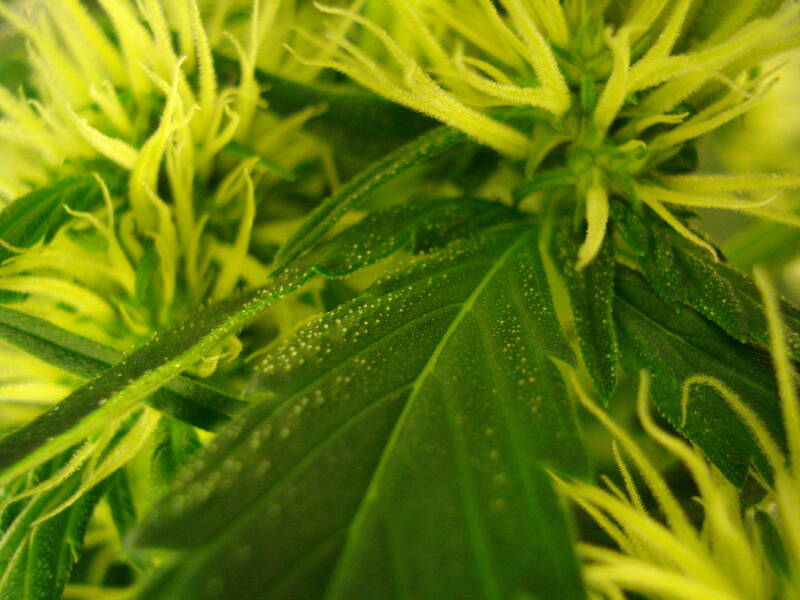 [iFlowering time: 6.5 weeks (45 days). 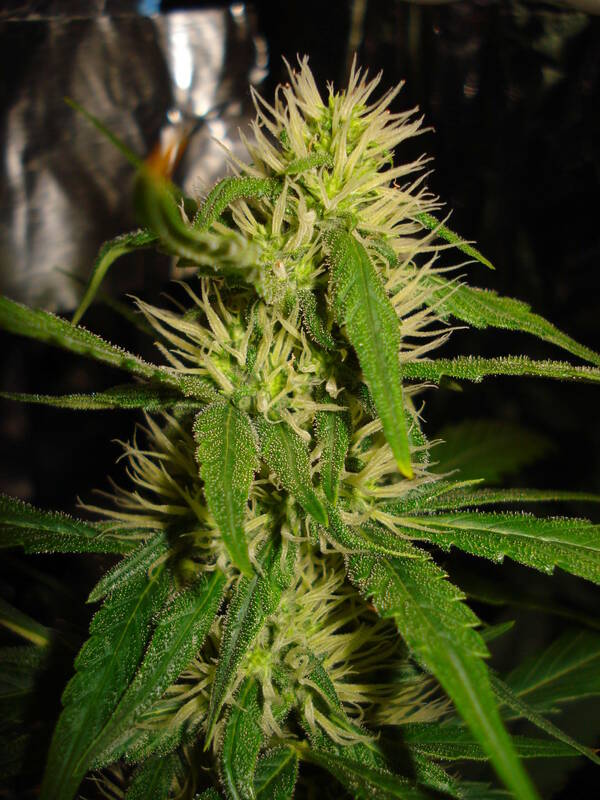 Cost: $7.25 per Feminized seed"
^ I like this one a lot, but the seeds are a little pricey. But, because Its got a lot of good qualities, I may reconsider, especially with that *very short* 5 week budding period and the fact its an auto-flowerer. 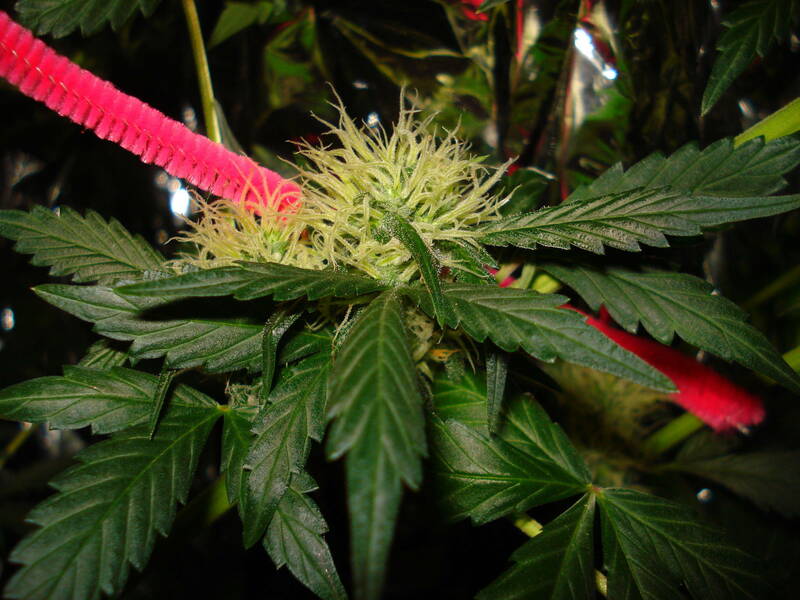 I wonder how they make it auto-flower, that almost seems like genetic-splicing or a madd-scientist made it. How do you breed for that trait? Thats all for now. its 2:45am, and I need to go to sleep now. Thrusday I will buy a small tropical plant (that I forgot to buy on Wednesday) and install the gravity drip system so I can see if my system can support plant life. I think you might want to consider a different arrangement for your lights. this arrangement is good for seedlings, but in a week or so you're going to want to at least triple the amount of bulbs you have on that plant. 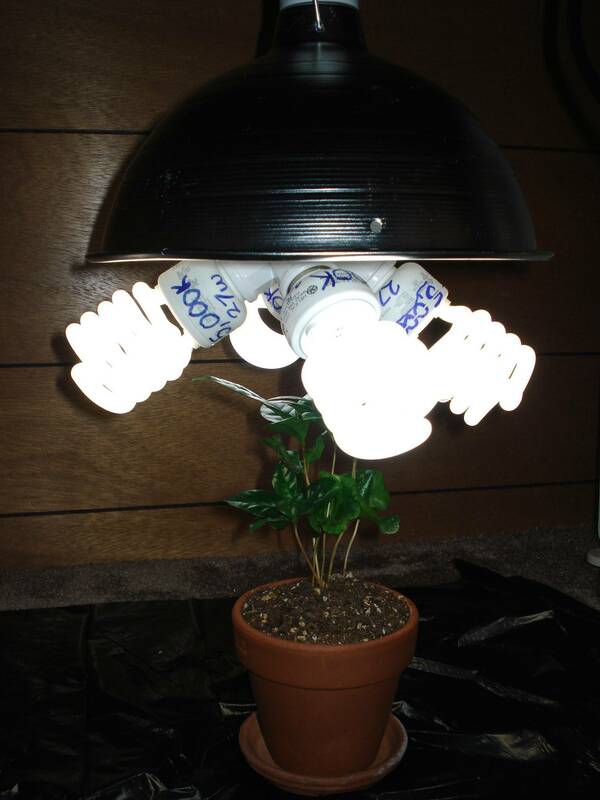 Something like this is very easy and cheap to make, but allows you to get a ton of light onto the plant. I've built several of these so if you need help finding any parts just let me know. Thank for the kind remarks Harry_Ba11z and you too Inbred_Gimp. I was touched (but not in a gay way, in a MANLY way) when I read your quote: "a very interesting person Mr. Crystal, but you're also very thorough which is doubtlessly the most important thing for finding success in this hobby. " I tend to be pretty detailed with everything I do, and this new hobby is no different. Also, by being thorough with my project step-by-step, I hope to inspire or encourage someone who wants to do something similar. Not that my method is revolutionary or unique, but I hope it gives some ideas and insight for anyone doing a semi low-budget project from my success/failures. 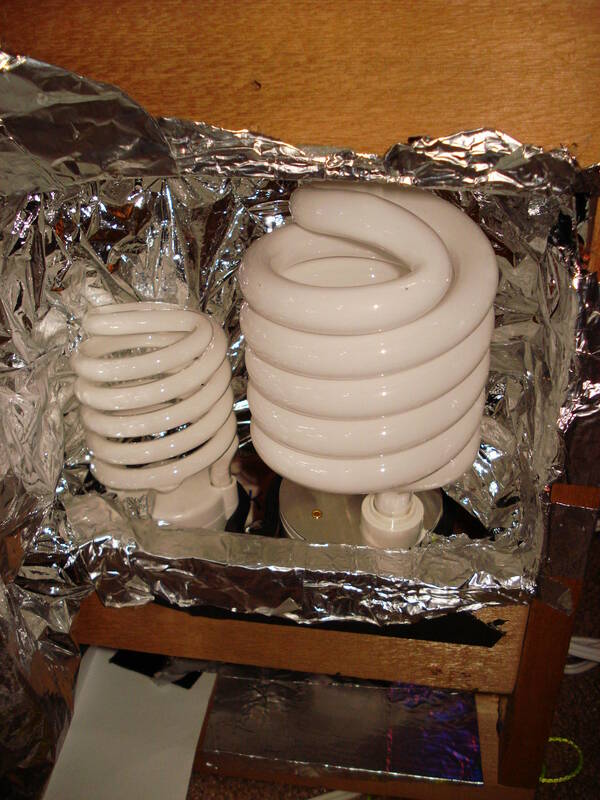 Its funny you recommended that 2-way spliter, because just today I thought "Those reflector fixtures are expensive, and I need more bulbs for my plant since 50 real watts of CFL is not enough. 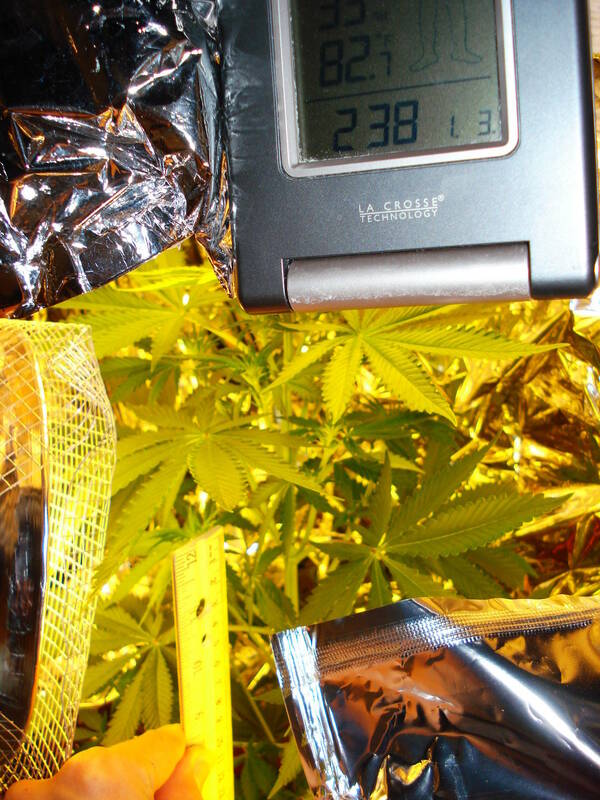 What If I bought one of those spilters I saw in another grow journal at the Growery. That will really make use of those reflector dishes!" And that's what I did. And there so cheap too, it would be silly not to do it. Also, since it puts the bulbs at 90 degree angles, it gives the plant more even lighting instead of just straight top-down lighting like I have right now. There was only one in stock, so I got it. I'll get another one later when I actually have seeds. 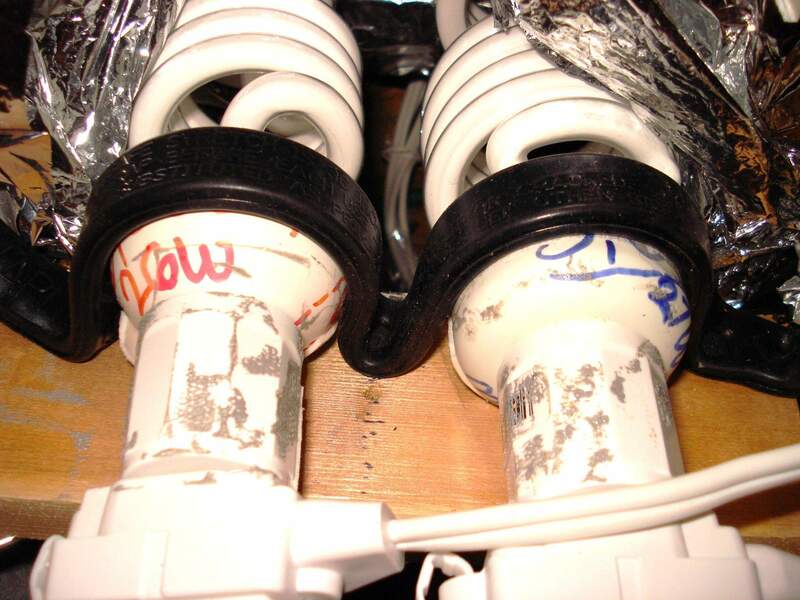 Here's the splitter and *right* CFL bulbs. The splitter is a cheap version of the one you pictured, but it should work OK.
^As pictured above, I also found some excellent 26watt 6500K color temp CFL at the store today. 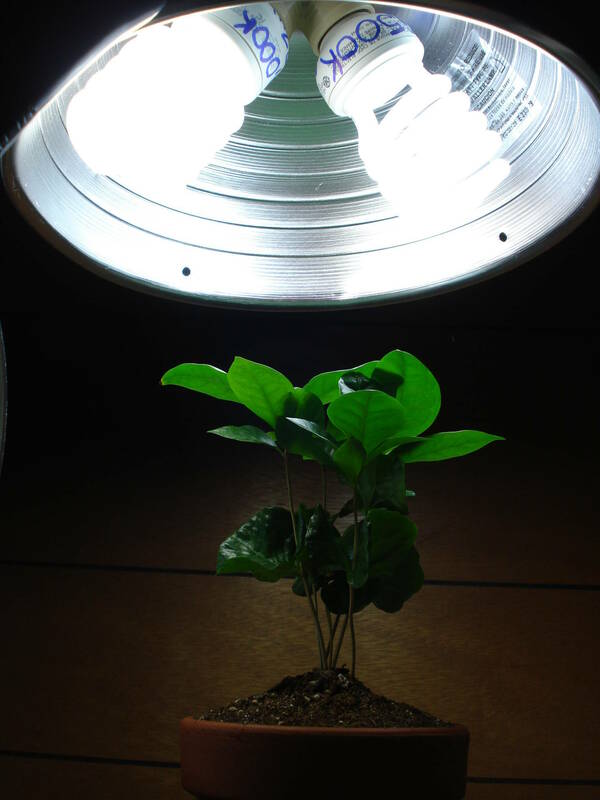 I've been reading that during the Vegetation stage, plants like about 6000K color range or above, so I'm going to use a combo of a 27Watt 5000K and now one 26watt 6500K on a 2-way spliter socket connected to one reflector lamp. I hope that makes sense, bascially 2 different bulbs hooked up to one lamp clamp. Why not just put a measuring jug under the drip system for a day to see how much it drips out? 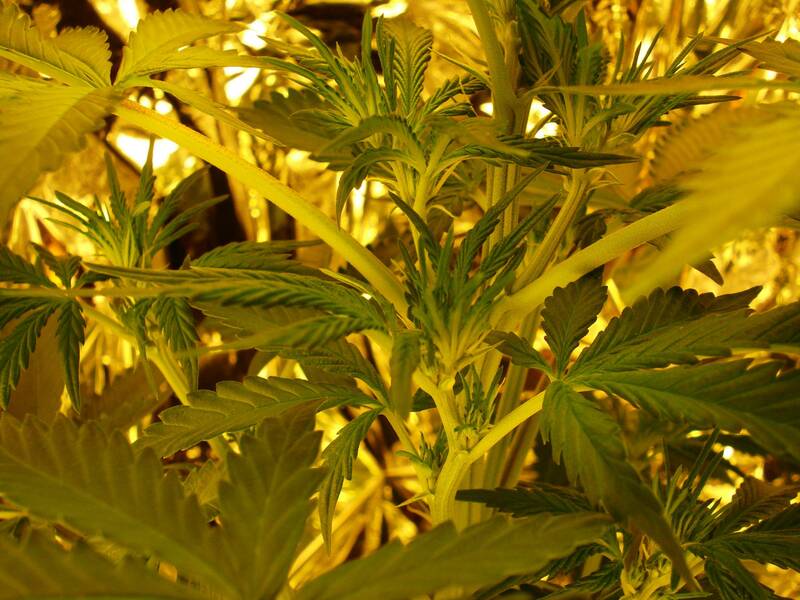 Then you can see if that's enough for a marijuana plant each day. 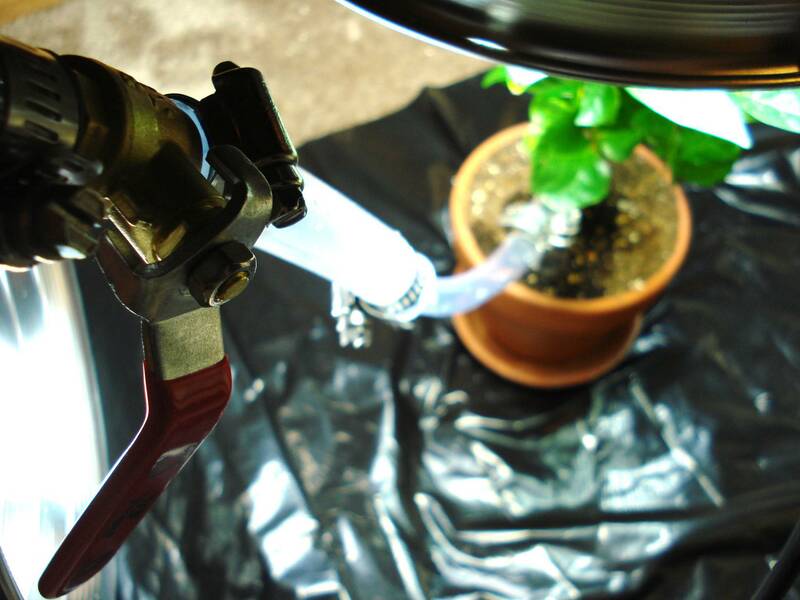 Actually, that was going to be the next part of my Gravity Drip project, but since I've (ironically) been having problems with leaks at the water-jug to vinyl hose connection interface, I can't test the drip rate until I find a better alternative. Once I find a leak-free connection, I will be fine-tuning the valve to get the best drip rate, and I will be using time and a measuring cup to see how much water comes out over a period of time. 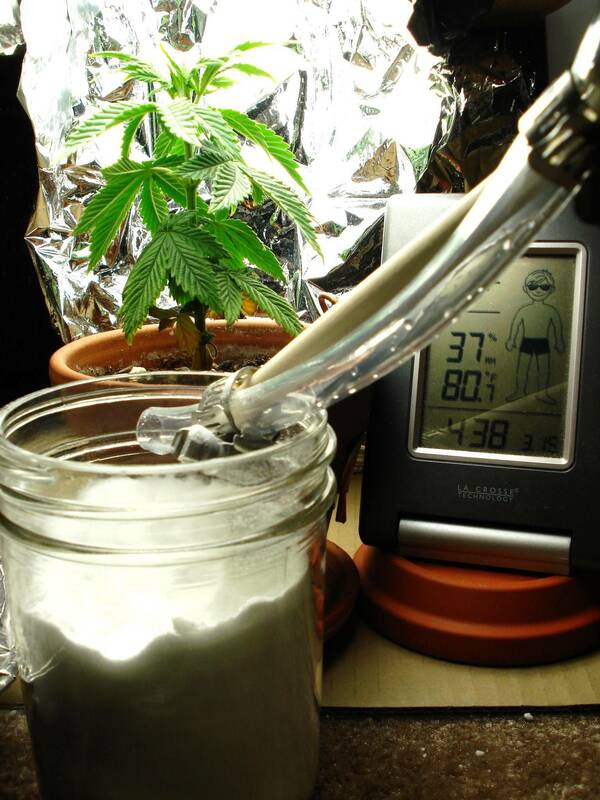 I will also measure the amount of time the container (which ever I use) it takes to drip thru the whole container, to see how long I can be gone from my future plant without having to manually water it. Thats important because I don't want to overestimate and return to a dying or worst dead plant. 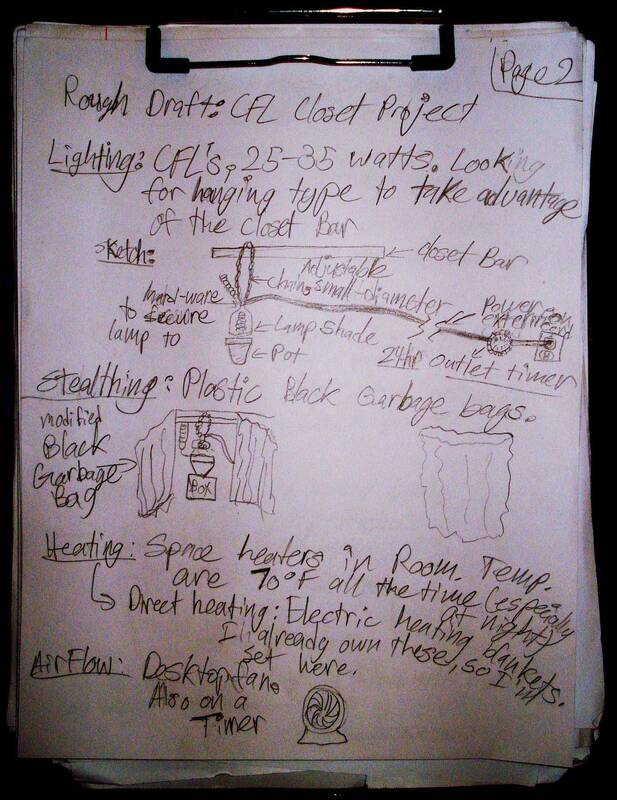 But I have found a better alternative, which I will discuss and build (while taking photos) in my next journal entry. File up and smoke down! 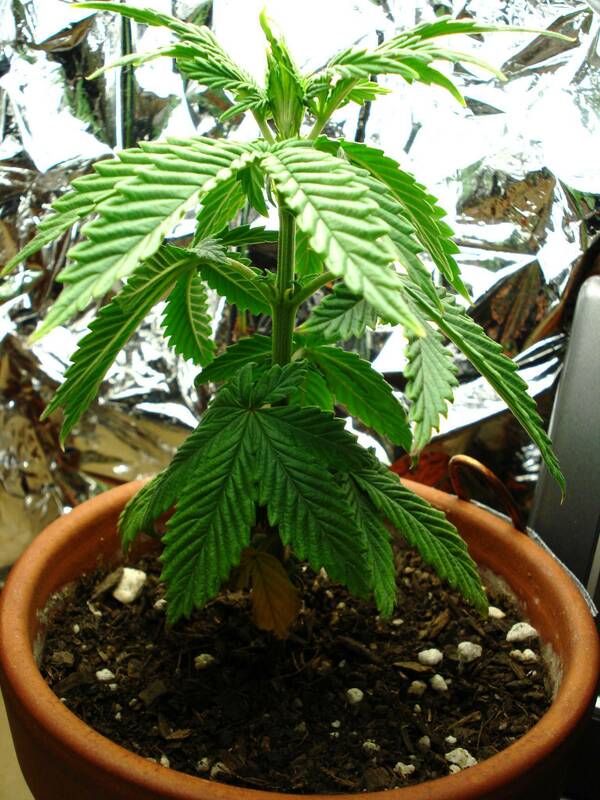 Because I don't the strain, flowering time, feminized/regular, Brand-name/bagseed, etc. 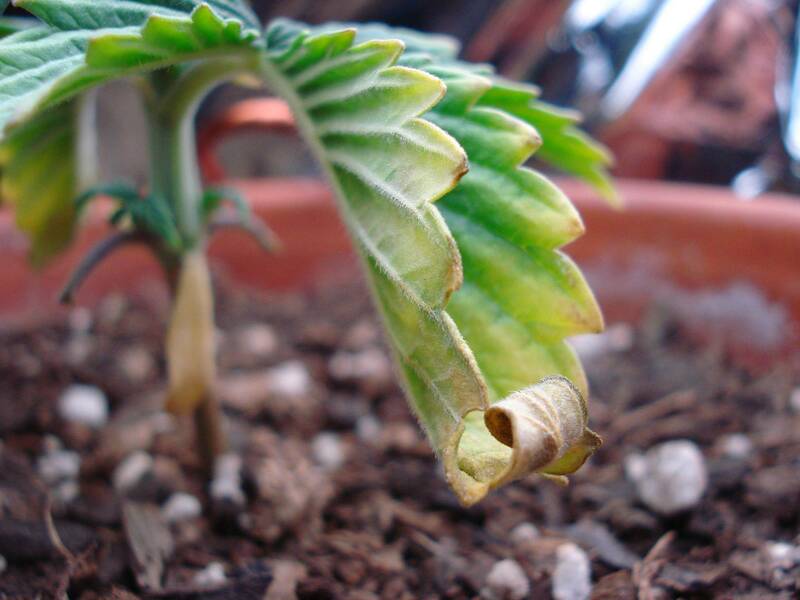 of the seeds, I don't know if I will hit my 4-20 goal close enough to sacrifice almost-matured budz. 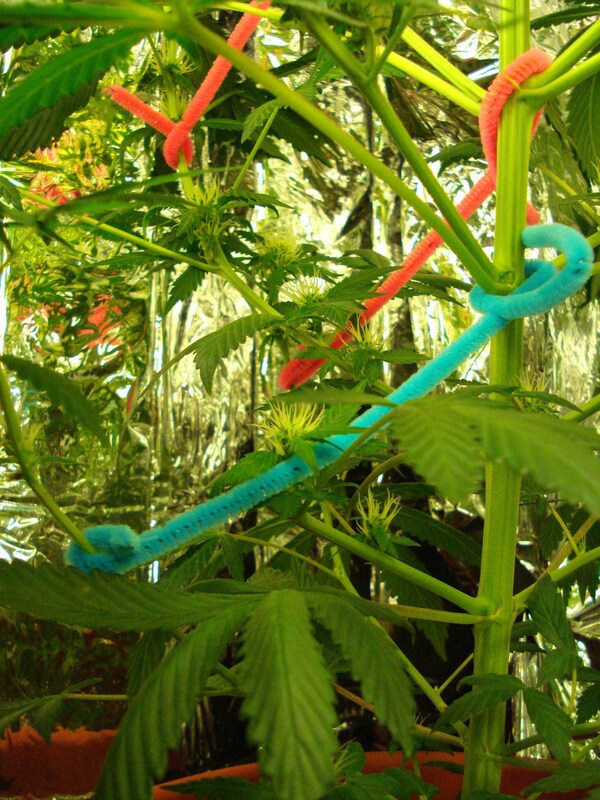 Because of this unknown, I've descided to buy a couple Brand seeds in which I know a little about. The cheapest one was 5 BP ($8 US) but it had a note by the choice that said "(Not Guaranteed)". 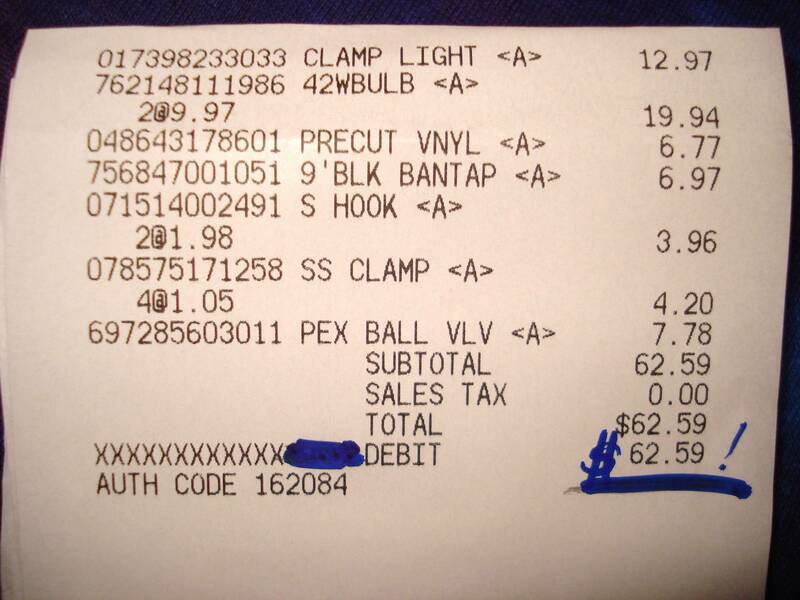 The second choice said "Guaranteed - Signiture Required" for 12 BP (~$19.40 US). This choice was a little to sketchy for me considering I had to sign it personally. That seemed like evidence the cops could use againist me in court. And then there was the thrid choice: "Guaranteed - No Signature", which to me sounds kinda like a oxymoron. This was my choice, but at a price tag of 15 BP (~$24.20), it was a hard price to pay. And if it got taken by Customs, I would loose all that money I spent on that shipping. But, they said "guaranteed" so hopefully they pack it well, or whatever that money is going into for the shipping. Its from a UK website, which means its gunna likely take a long time to travel overseas and make it here. I hope it doesn't get confiscated by US Customs. 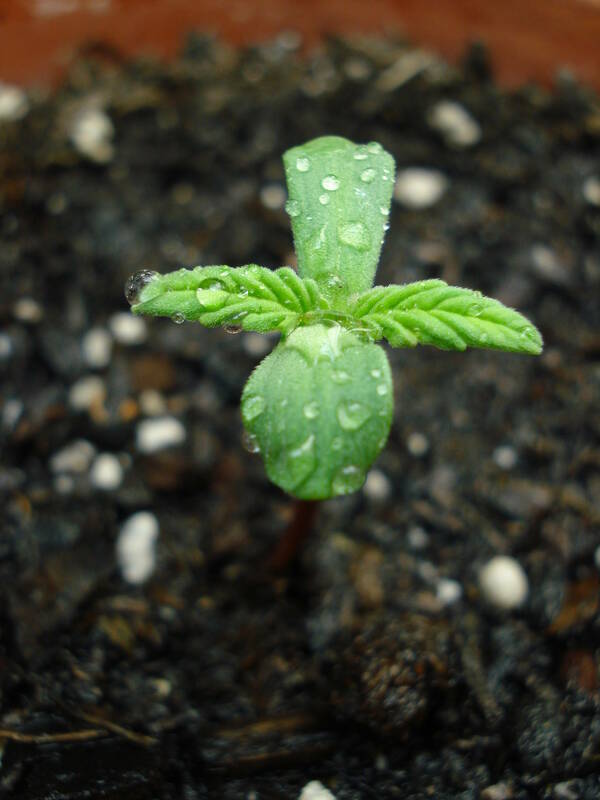 Here's the actual "Order Confirm"
In the meantime, I will be working on perfecting the drip system, looking for quality soil AND most importantly, research the best way to germinate seeds. 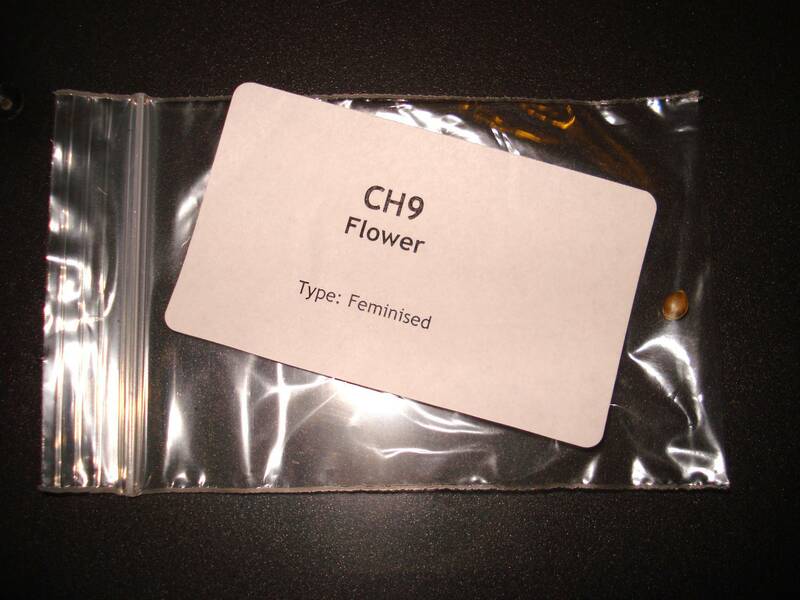 Before I explain how I finally figured out my gravity system, I wanted to share a silly statement the company I ordered from put in their "Order Confirm" email that they sent me about the seeds. ^ Yeah, my bank won't think that company name is unusual. Makes it sound like I enjoy buying stuff for a children's toy store. And here is the actual total for the shipping and the 2 lonely feminine seeds (values are in British Pounds. 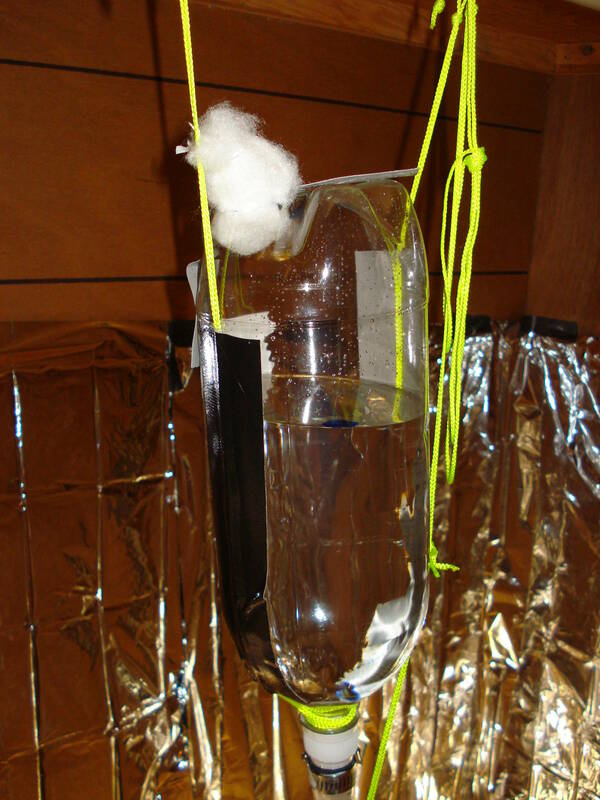 ^Problems: The metal ball-bearing inside the chrome tube was too difficult to get out. Tried cutting tube, but it was too thick and smooth for a hand saw. 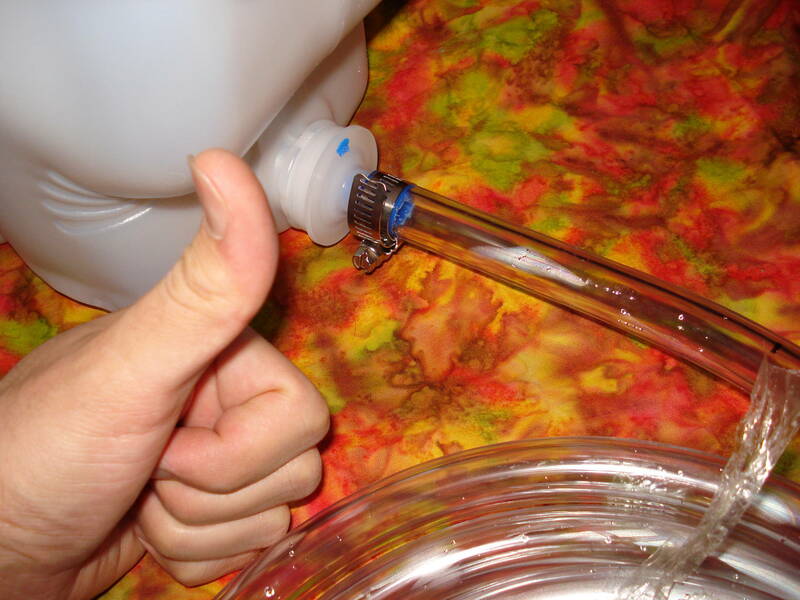 Attached hose for quick upside-down grav. test, it leaked like no ones business. 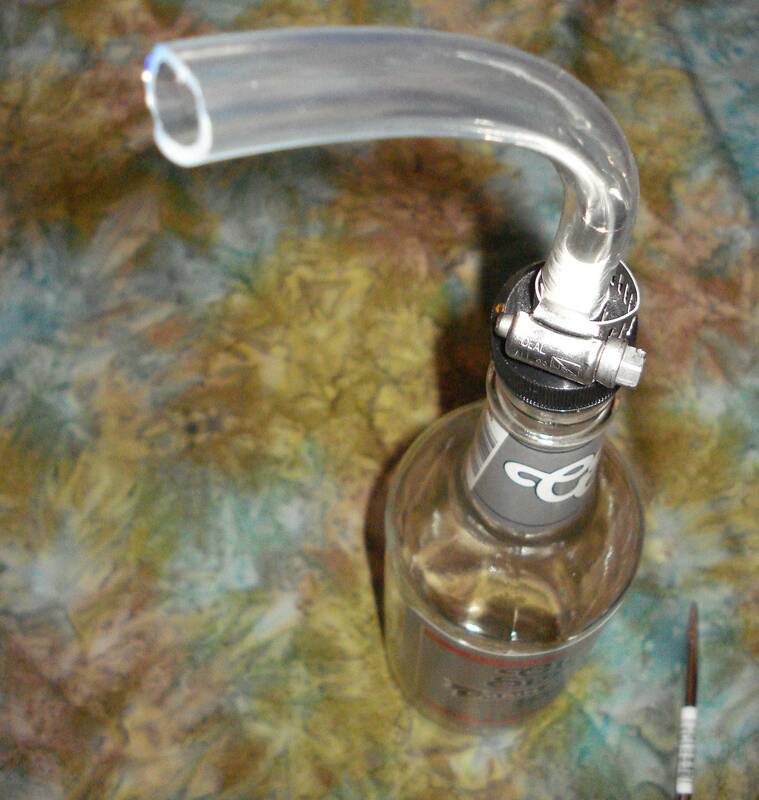 This one would of being a good one because of the screw off fill-lid and long metal stem. The capacity was OK, at a couple litters. ^Problems: Leaked at plastic valve interface. This would of been the best one, considering the 2.5 gallon capacity, but a leak on a container this big would be a distaster in my rented apartment, and also dangerous with the lights being on around it. ^Problems: This time, it leaked at the cap/pour stem interface. Also, having to drill a hole into the spirit bottle cap was time-consuming and too much extra work. Pour adapter needed a lot of retrofitting to fit in inside the cap and tightly on the bottle. Since it works best in alcohol bottles, finding a cheap plastic alcohol bottle to use might be a problem. This one finally worked, and all the credit goes to the rubber O-Ring gaskets. I tried just putting the hose on without, it leaked, but once I put on those rubber O-Rings, it cured the leaked immediately. 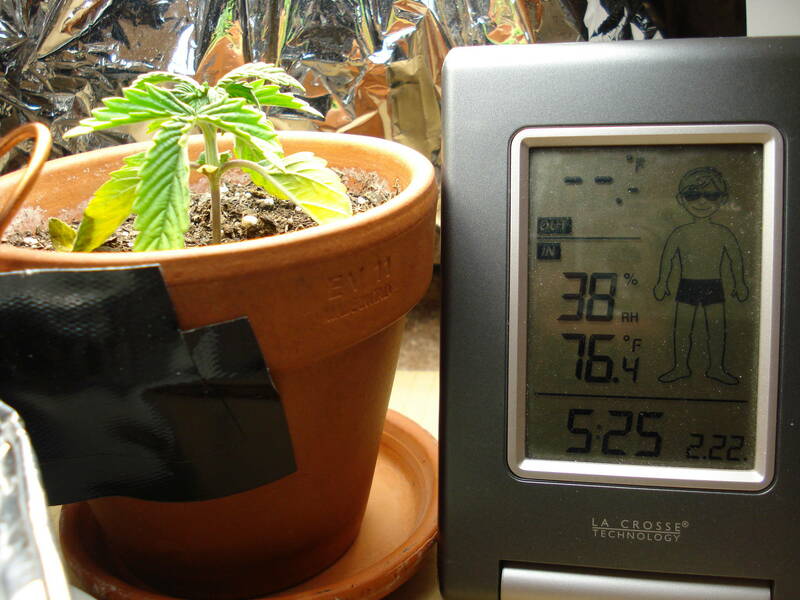 Today was a good day for this "pre-seeds" grow project. Success! ^From left to right: One 1-1/8" MAX diameter metal plumbing clamp ($1). One water bottle with "push/pull" Sport valve ($1.25). One box of 13/16" O.D. x 5/8" I.D. x 3/32" thick rubber O-ring gaskets ($2). 2 feet of 3/4" I.D. x 1" O.D. vinyl tubing (~$5, not shown). Tools: 1 flat-head screwdriver (not shown). 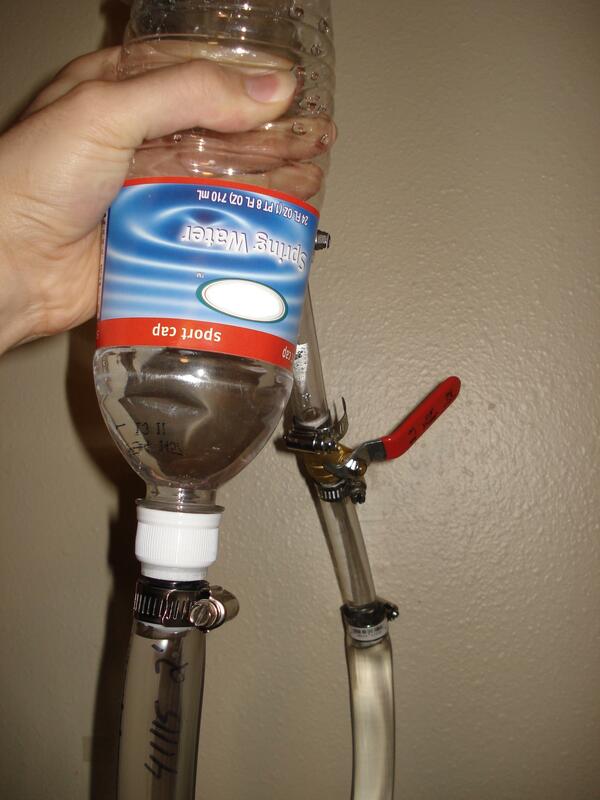 1) I took the water bottle and emptied out some of the water using the valve. Then I dried the rim of the valve off with a towel. 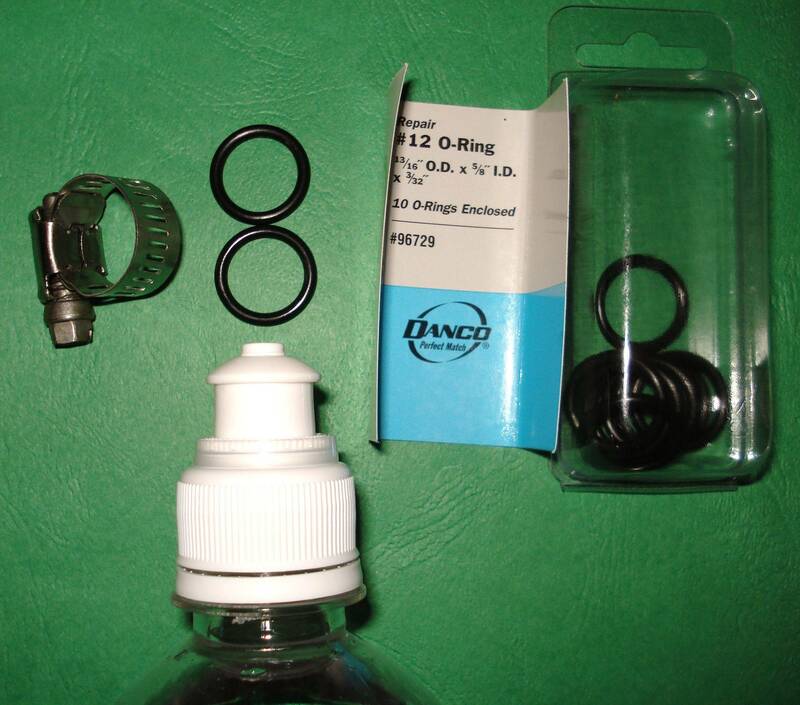 2)With the water bottle valve fully opened, I started to slide O-rings down the shaft...I mean valve. 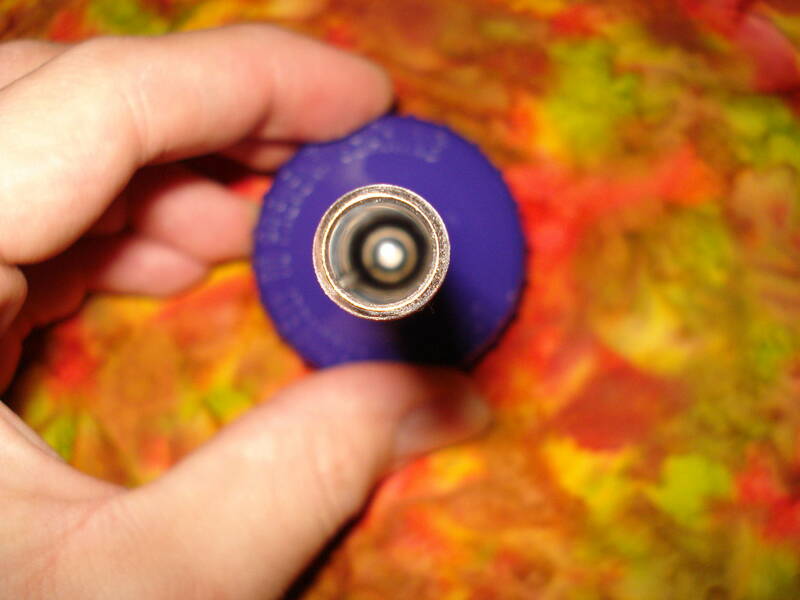 3) I made sure it slid all the way to the bottom, where there's a gap between the moving valve and the valve sleeve. This will prevent the valve from closing prematurely during the tubing "slide-on". 5) After that, with the 1-1/8" clamp already on the tubing, I slide on the 3/4" ID vinyl tubing, making sure it didn't push down the tip as I thrusted the tube down the shaft...I mean valve. 6) I then made sure the valve was still open after the push-on. Then, I slid down the clamp into position, and tighten it down to "snugness" using the flat head screwdriver. 7) Lastly, I got the already made valve/tubing assembly (made from previous attempts) and I thrust-ed the smaller 3/4" OD into the larger 3/4" ID tubing, and again, tighten down with a clamp. 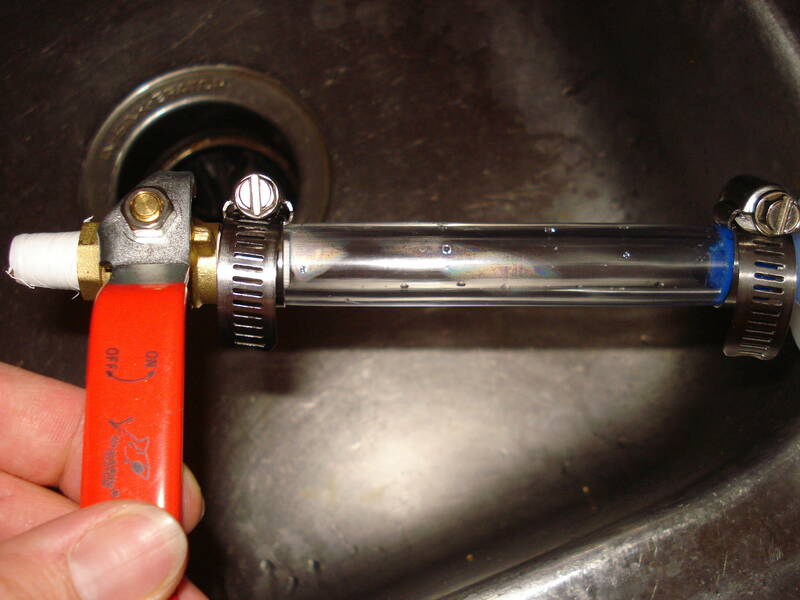 8) The brass valve was turned off, and I gave it the "squeeze" test, to see if it could hold water under slight pressure. It did, very well actually. This revelation makes me believe with a lot of confidence that (given the right size) the O-rings could work on likely all 3 of the above "failed" projects. Its really the turning point in making a completely tight leak-free seal. This is what it looked like when I tested it. 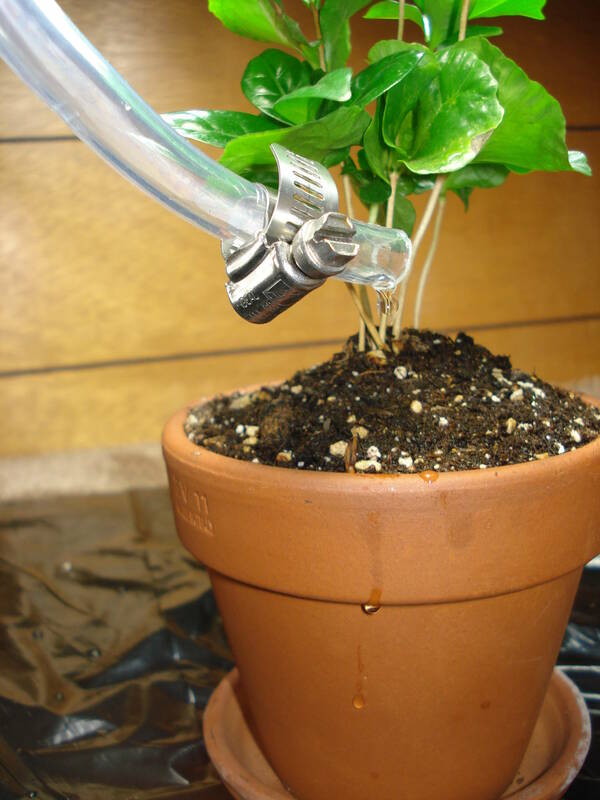 9) Well, it passed the leak test, now I'm gunna try it out on my stand-in plant, a young coffee plant, to see how it drips. 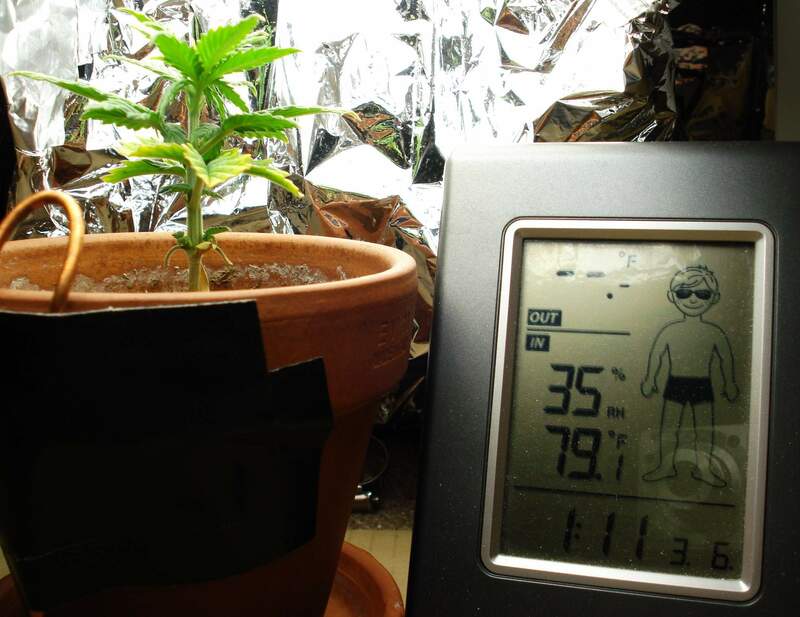 Once the seeds come in, I will be using it on it (at a safe time for the little guy). 10) Very Lastly, I'm going to hang it up from the closet rails. I'm thinking of some string tied around the neck of the bottle. 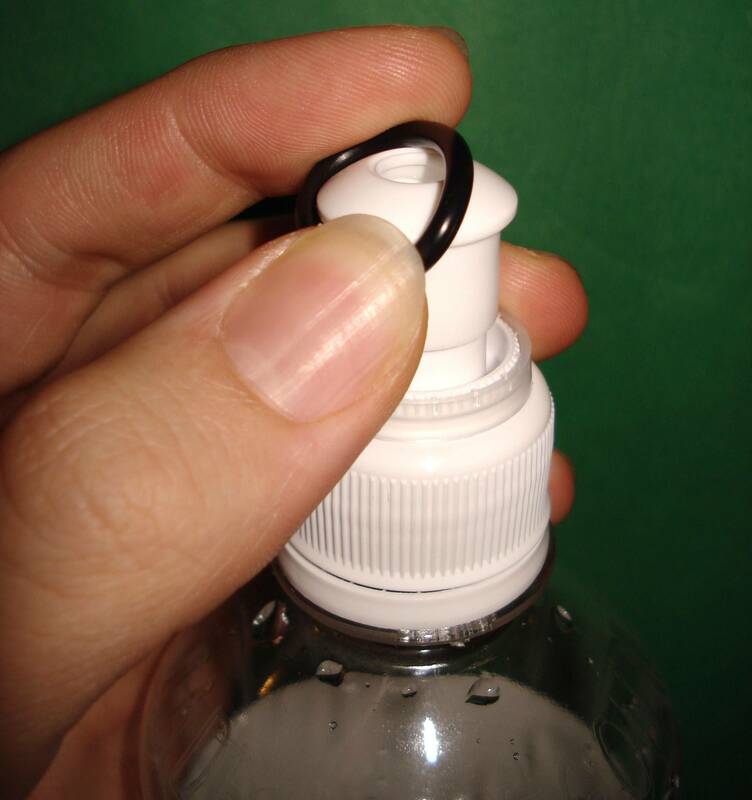 Also, I will be attaching a larger bottle to the valve, because this one is too small in capacity. I'll be back on Tuesday to show the final set-up in the closet area. During my search for the best bulbs, I could not find the right ones I was looking for. 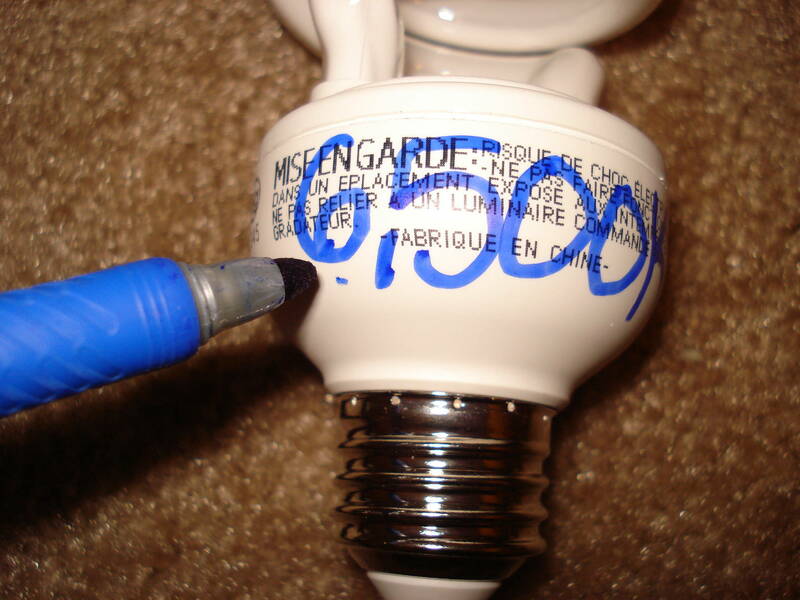 The "perfect" CFL bulbs I was looking for were ones with a color temperature range between 5000K-6500K in spectrum in a wattage near 50 watts each. 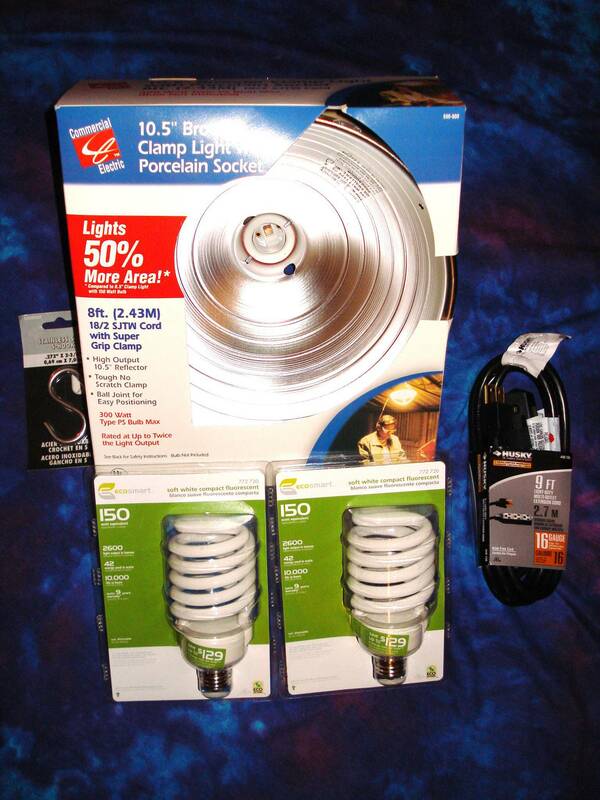 But, all I could find were those 5000K-6500K bulbs in 27 watts. Because of this, I am likely going to have to get another reflector dish. 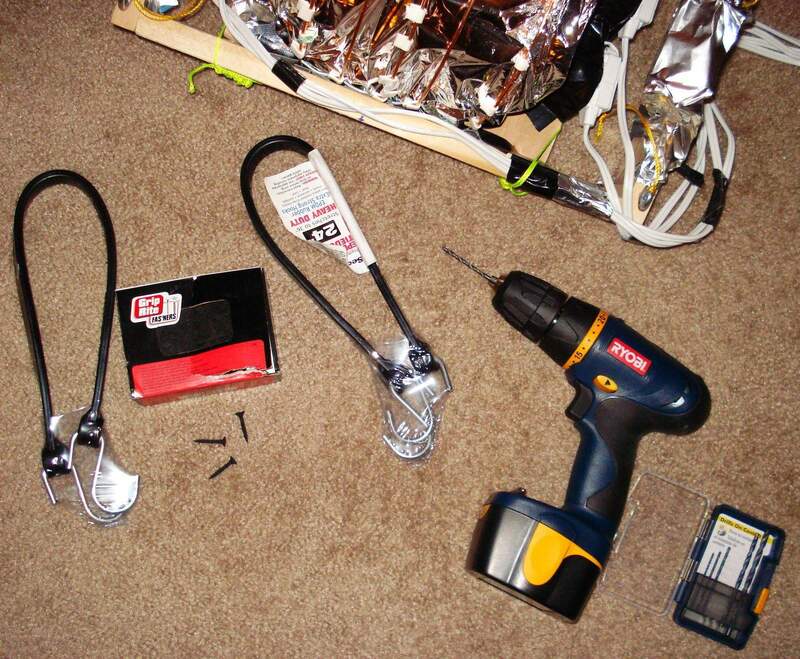 But, for the time being, I bought a bulb socket splitter, so that I could make better use of my hanging lamp. The one I found was a GE and I later found that not all splitters are made the same, that this GE one had an angle narrower than 90 degrees, while other socket splitter brands were 90 degree connections. I bought the last of the GE type, but I will buy more once they are in stock again. 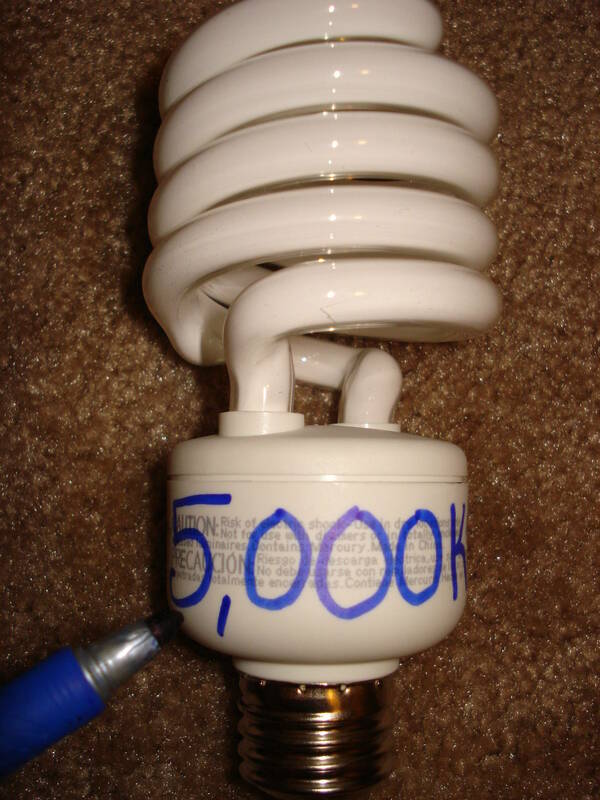 I had 2 types of CFL bulbs in the end of my search, two 5,000K 26 watt CFl and two 6,500K watt CFL. 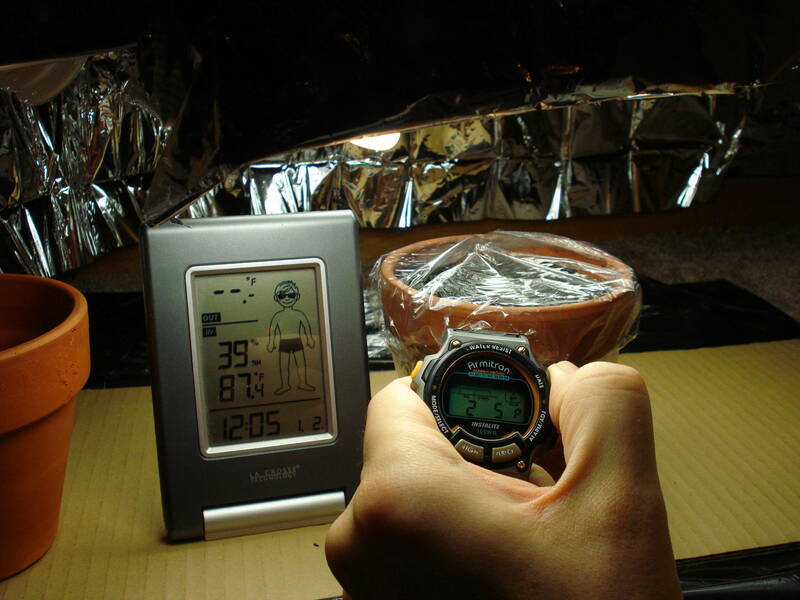 I also bought some 2,700K "warm white" 42 watters, but those are the wrong color temp. type (should be 5000K-7000K) for the vegetation stage. Before I installed the bulbs in their 2-way arrangement, I had to mark them so I didn't get them mixed up with eachother. 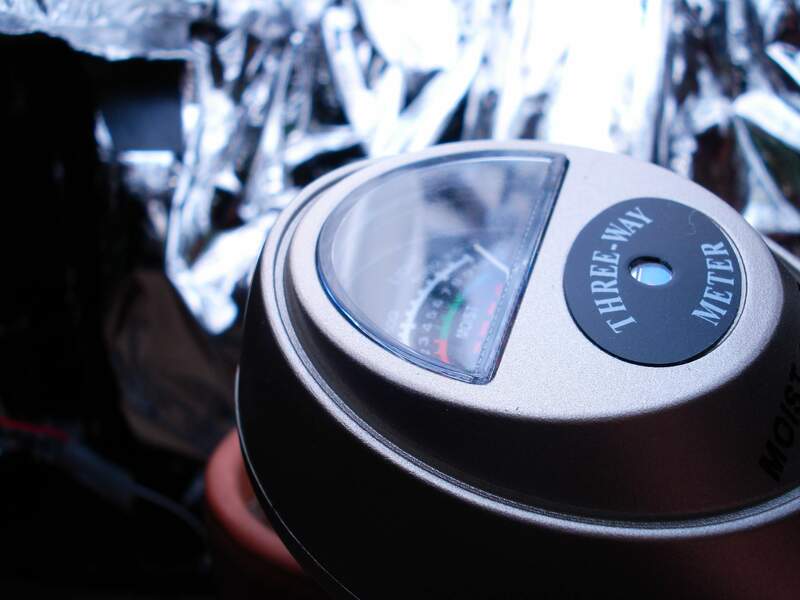 1) I took a felt pen and wrote the color temperature and wattage on each bulb I'm using. 2) I screwed them into the special, unique 2-way GE splitter. 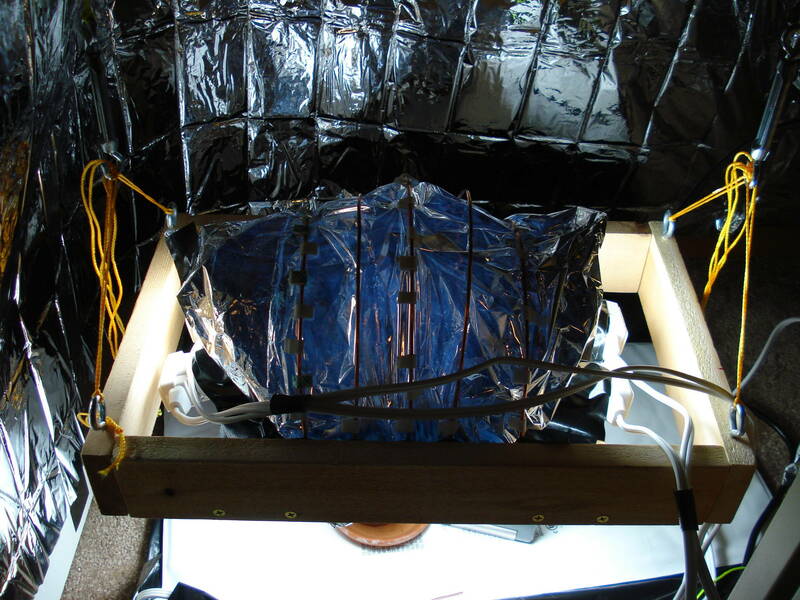 I was considering using this type of set-up, so I could maximize the use of my "expensive" lamp, but because the bulbs actually stick out beyond the reflecting dish and do not use the reflecting dish efficiently, I scraped the idea. 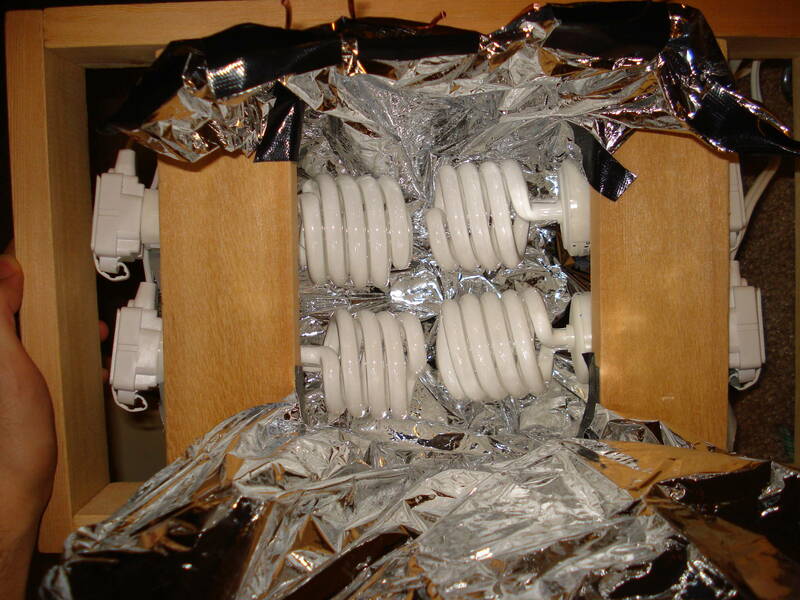 I'm sticking with 2 separate reflector dishes side-by-side with two 26 watt bulbs inside each one. 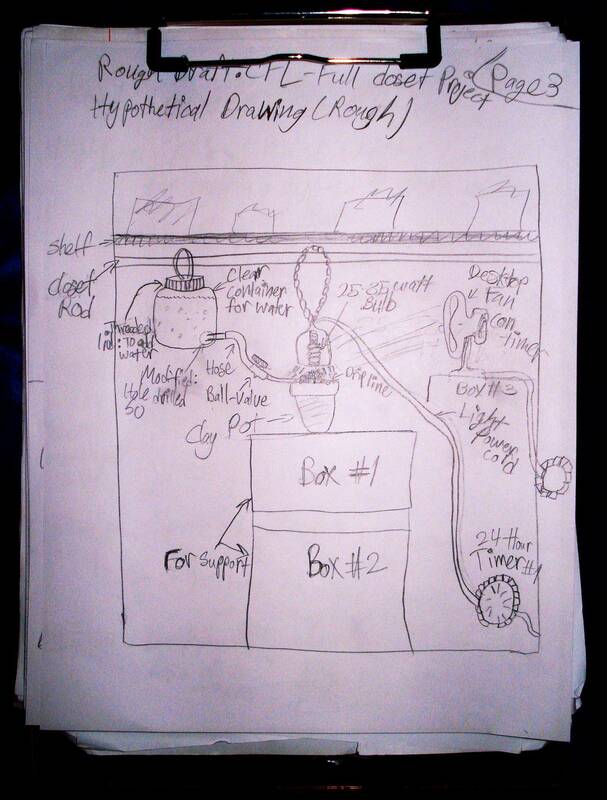 On Wednesday*** night, I will be working on setting-up the drip system inside the closet. ***Note: Didn't do it today: life (and late sleep) got in the way. Hopefully Wednesday. It Looks Great My friend! I hope it turns out good. Thanks for all your help with my questions so far. And no Silly BallSack, I'm not a girl. If my video avatar of the hot babe and the last name "Crystal" confused you, then know that the video I choose is of a very hot asian reporter sniffing some dank budz, which to me is the hottest thing I've seen on TV before. 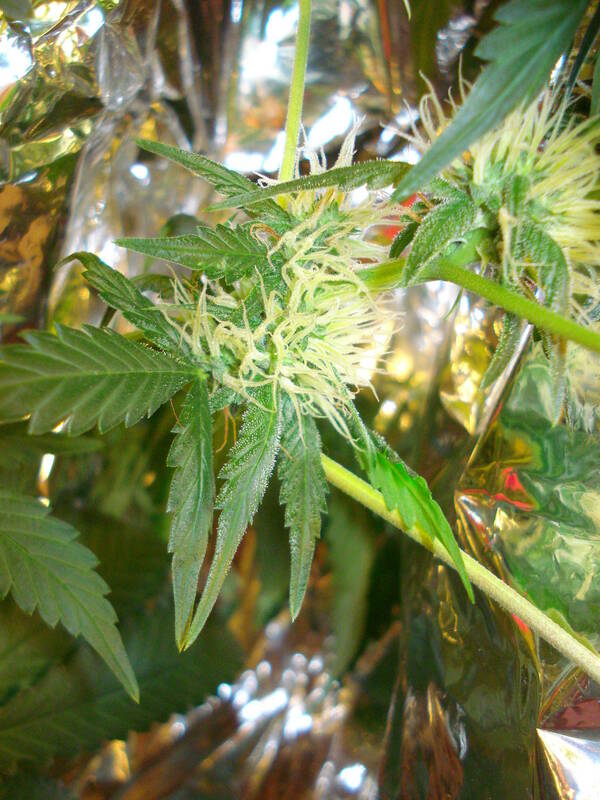 And the name "crystal" is reffering to those white "crystals" on kind ultra-dank budz like "White Widow" or "Ice". My entire screen-name is a self-referential to budz and weed, and its a close link to my actual intinals TCC. Afte looking at the photos in Harry's CFL log, I noticed that all the walls were silvery, for the purpose of reflecting stray light from the bulbs back toward the plant. 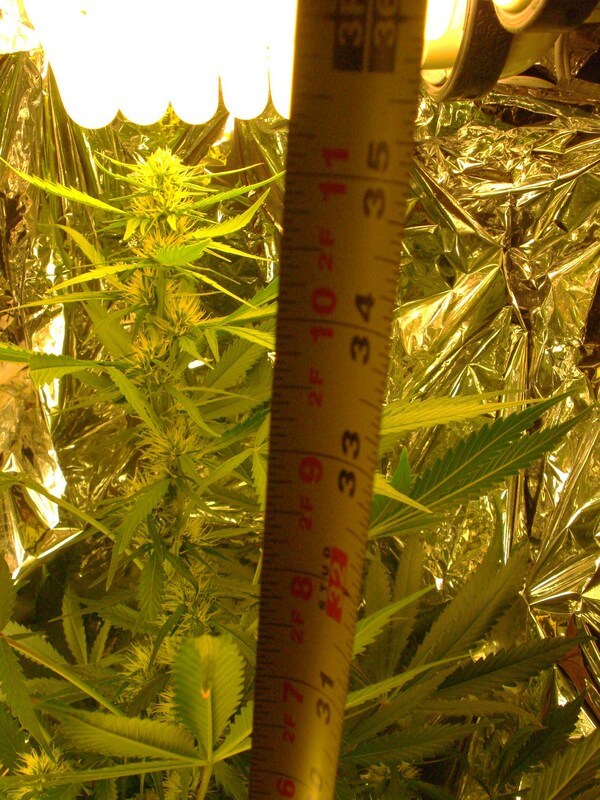 This simple principle now seems obvious to me, and there's no doubt in my mind that knowledgable, real indoor growers put these same materials in their indoor set-ups, regardless of the type of lighting they use: its improves any lighting set-up. 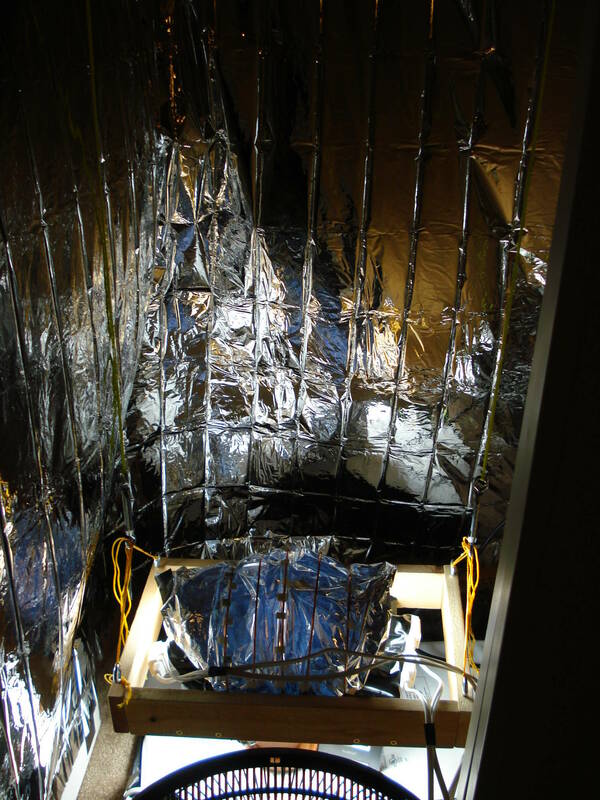 So, to improve the light efficiency of my closet, I desicided to add some reflective material. 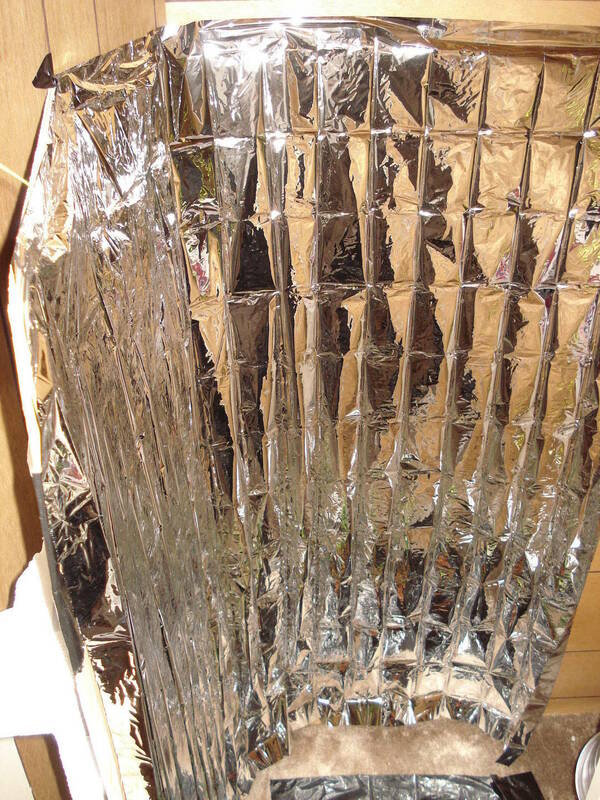 I thought about what to use, then I remembered something I bought for camping a long time ago.....After some searching, I found a emergency "survival" Mylar(R) blanket left over from a camping gear package I bought several years ago. This is was great news because I didn't have to spend any money on it. Now to build a structure to support it. 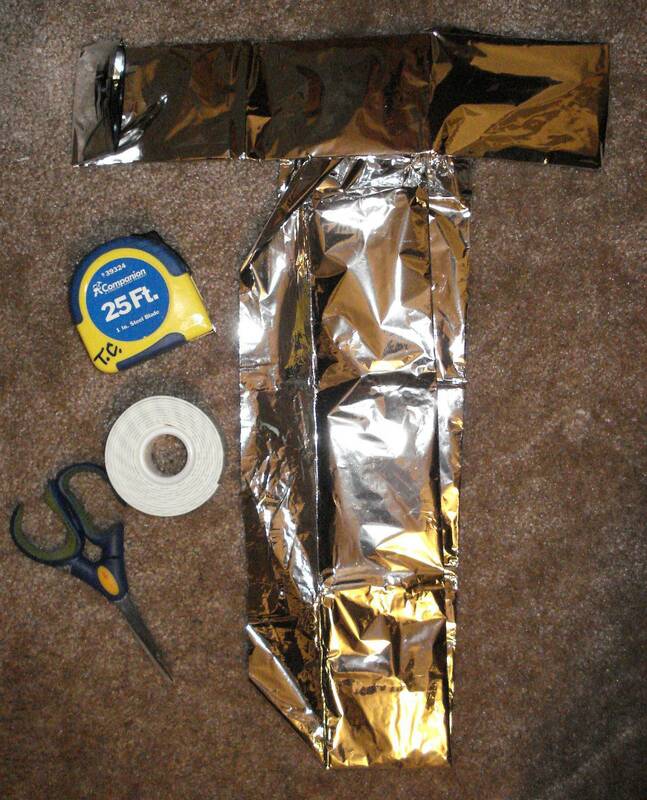 ^In photo: Sharp scissors, double-stick foam tape, tape ruler, and of course, the Survival Mylar(r) Blanket. First, I measured the inside of the closet around the 2 walls (next to door, and back wall) to see how much I needed. 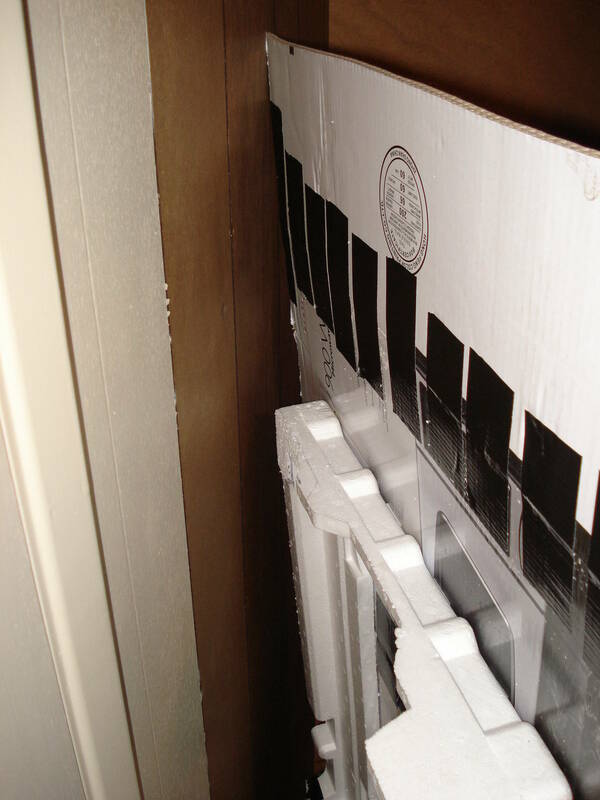 The closet is about 65 inches tall or 5.4 ft (to the metal rail) and the 2 walls together was about 68 inches long (5.6ft). 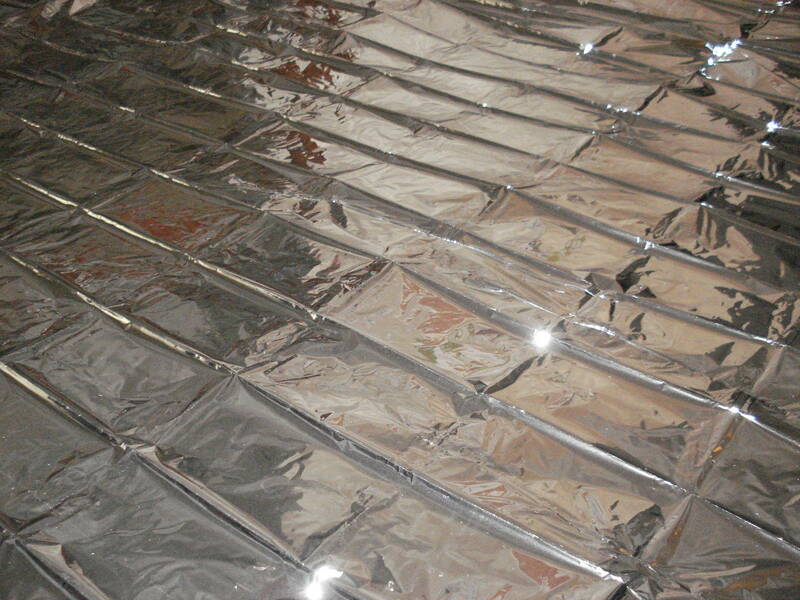 Then, I laided out the Mylar Blanket on the floor to see how much material I had to work with. Then, I took some measurements. Its about 80 inches long and 60 inches wide. It was a little short height wise (the width), but had good lenght. I measured out a piece 68 inches long (out of the available 80 inches) and cut it with the sharp scissors. At this point, I realized that the wall was not a 90 degree angle. 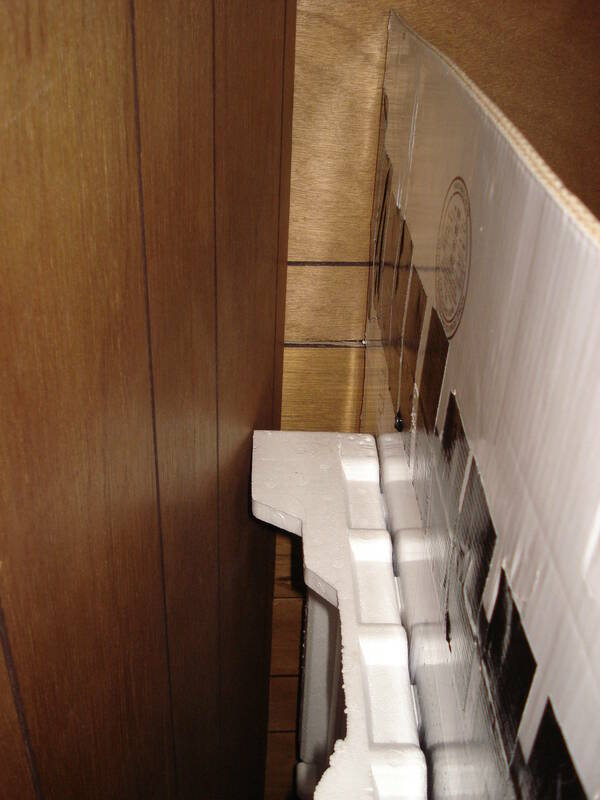 Its was more like a 120 degree angle, going outward toward the room's door. 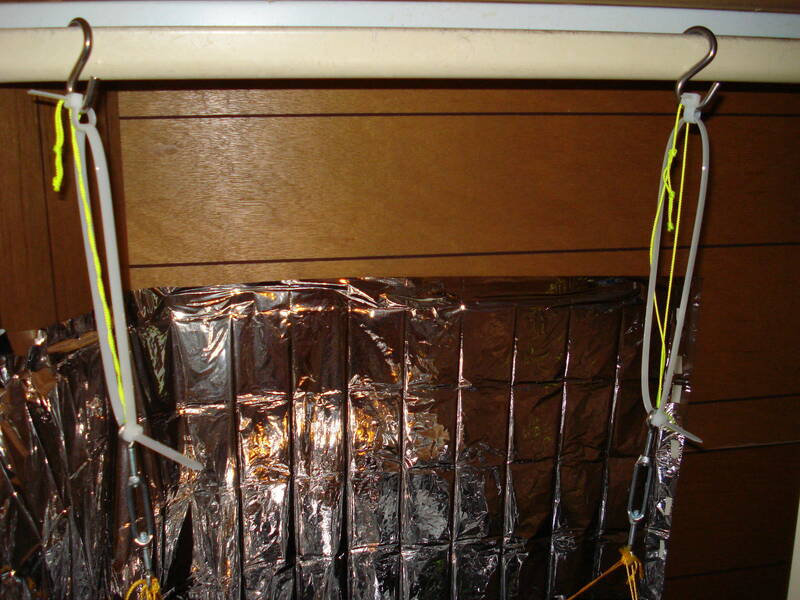 I knew just putting the sheeting on that angled wall won't do much good, so I desicided I needed to build a simple structure to act as a "wall" to angle the light back into the closet using the Mylar sheeting. To try to save on costs, I searched around the room and found some left over cardboard and foam from a microwave I bought. The hard foam would make a great wall structure, while the cardboard would make a great flat "wall" to attach the Mylar sheeting to. I also used this poster project board I used (and kept) from a school project. That's why you will see random photos on a white board: thats my no-longer-in-use board. First, I had to stick together the 2 seperate foam pieces on top of one another. I used double-stick tape and duct tape to attach them together. After much taping of the boards (to keep them from folding on themselves), I attached the boards to foam "back-bone" structure. 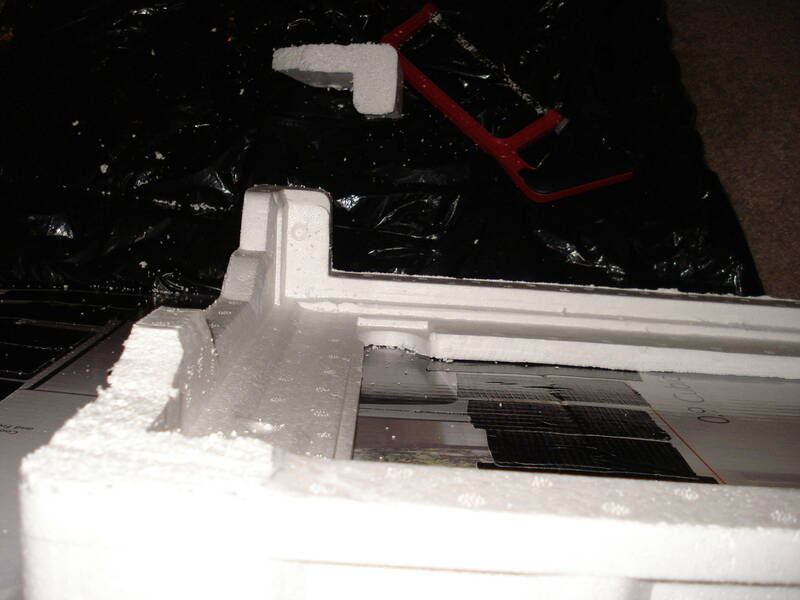 ^First thing I noticed is that the foam "legs" on the foam structure were gettin' in the way of the wall. Also, note unusual angle on the wall. ^It had 3 legs, and I severed all of them on one side. ^Fits great! Then I realised it might be best to make like a "V" angle, so that the light reflects and collect, similar to a satillete dish (although mine is not nearly that advance). Only bad thing is it goes a little outside the closet, and gets in the way of the opening door, but the stealthing tri-pod was doing that anyway, so I'm cool with it. 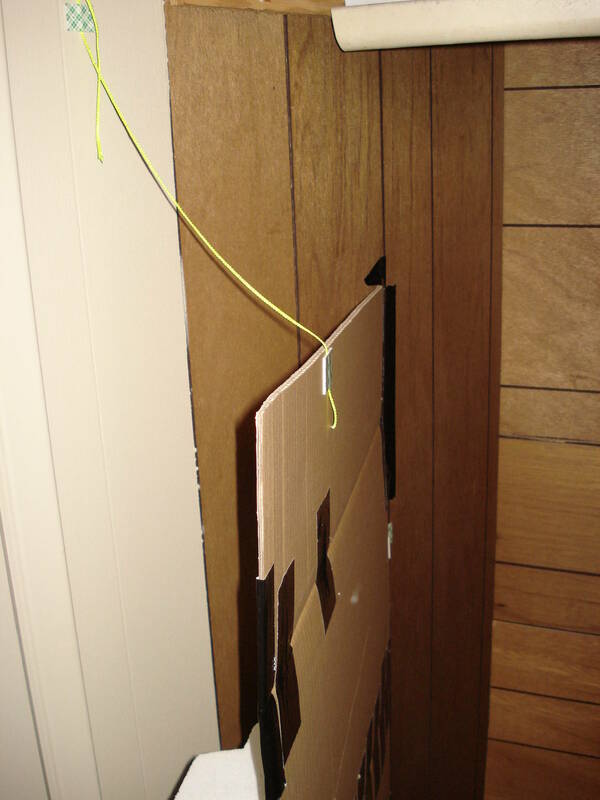 So, I taped the side of the cardboard to the closet wall to hold it in place. I also taped around the stubby foam legs I cut, for added strenght. Almost done....Now I cut and placed small pieces of double stick foam tape on the cardboard wall and the closet wall. I just put on the top of the walls, so I could save tap and make it flowing and free at the bottom, like a hot Fembot's metal skirt. ...It turns out I used so much tape that I ran out at the very end of where I needed to put tape. Just enough! Whew! I pealed off all the tape-backers and hung the reflective sheeting, one tape point at a time. Final hung the whole sheet. ^At this point I realized that I should NOT of cut that little section off: I should of just left it as is. I could of went around the wall and onto the metal cabinet I have inside there to make it more 360 reflective. I guess I'll have to buy another "survival blanket" and complete the job. So I wanted to see how well it worked with just the CFL's turned on. I switched on the CFL lights in the dark room and got this. ^ When I first turn on those lights, I was mesmerized by how it changed the look of the closet. 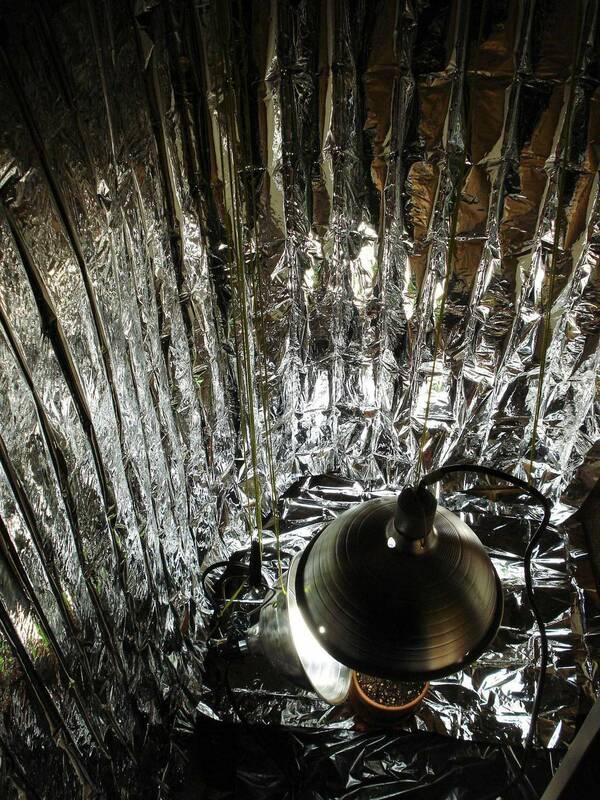 With this new Mylar material, it looks I'm growing inside a stand-up shower stall of an Alien Space Ship! Well, it was complete...sort of. I still wanna do the other half, which is the right side of the wall with the cabinet and the inside "wall" that is the closet door. 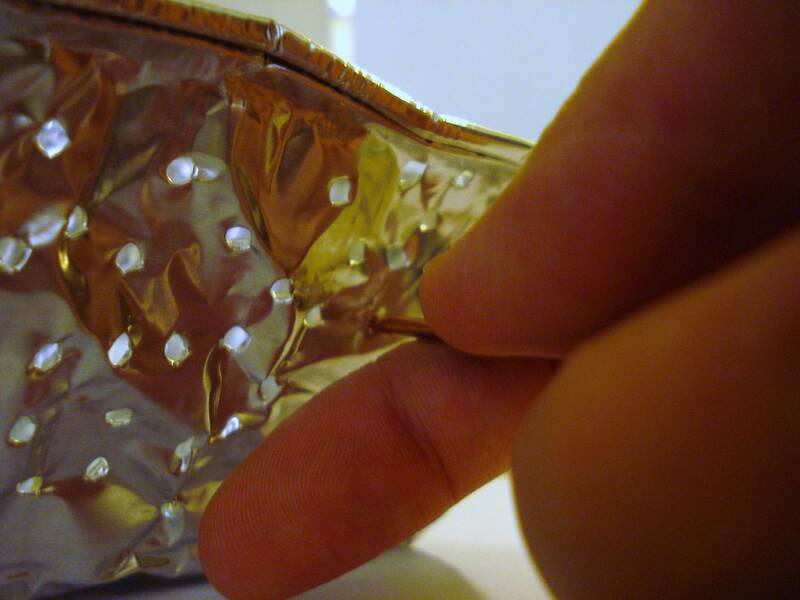 I might even put reflective material on the sleathing trash bags, to reflect the light back instead of just abosorbing it. I'll have to see how it looks, if it reflects the light or just scatters it everywhere in my room. 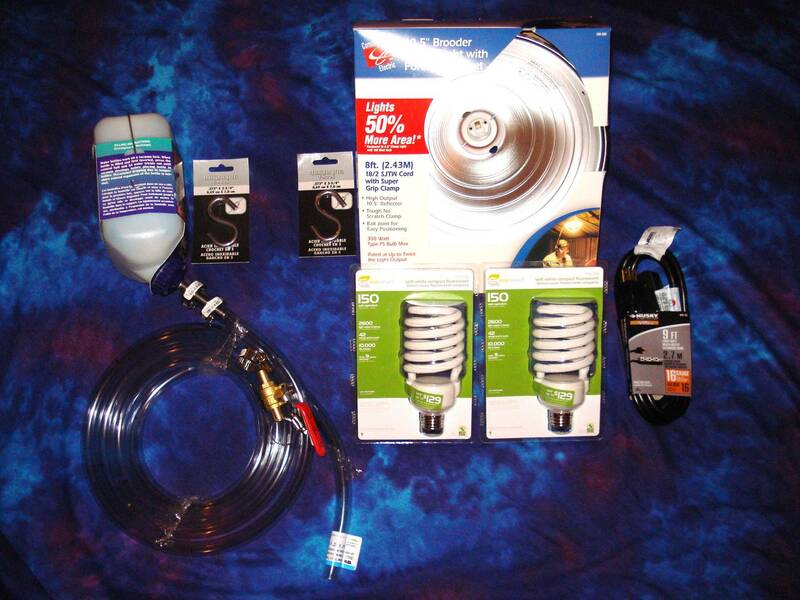 I bought some more supplies today, mostly for lighting: My next project is going to be drilling holes into the 2 large 12" lamps I own and putting string inside them so that I can make a " ^ " shape with the lamps facing 45 degrees to one another. 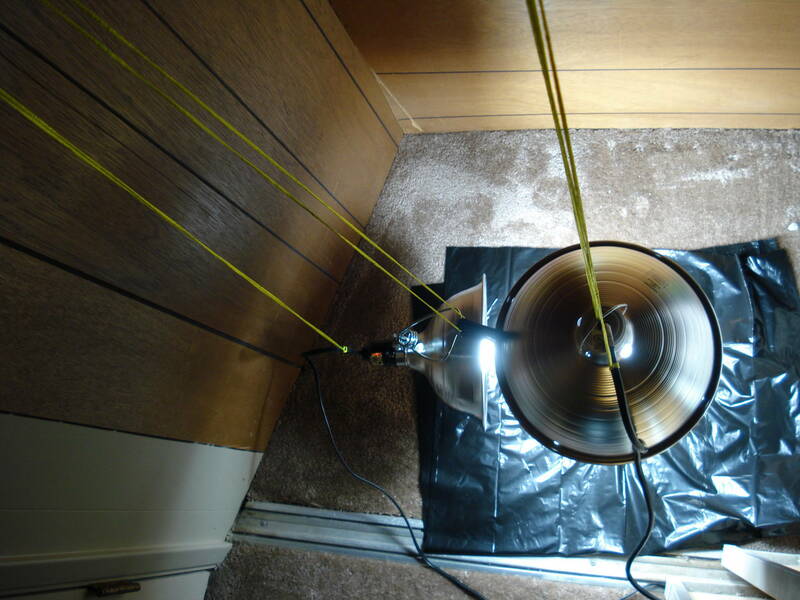 Also, I will be taking my smaller but cheaper 8" wide clamp lamps and attaching wire onto the reflective "dish" and wraping reflective Mylar sheeting around the wire frame. 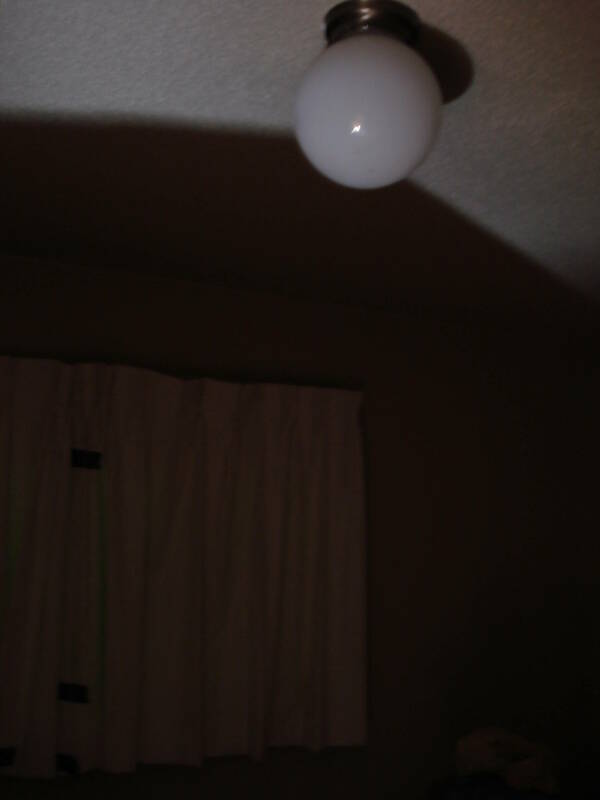 I'm doing this because when I put an adpater to fit 2 bulbs in the socket, the bulbs sticked WAY far out, and wasted a lot of light. This will make it more efficient by directing the light to its rightous destination. the video I choose is of a very hot asian reporter sniffing some dank budz, which to me is the hottest thing I've seen on TV before. 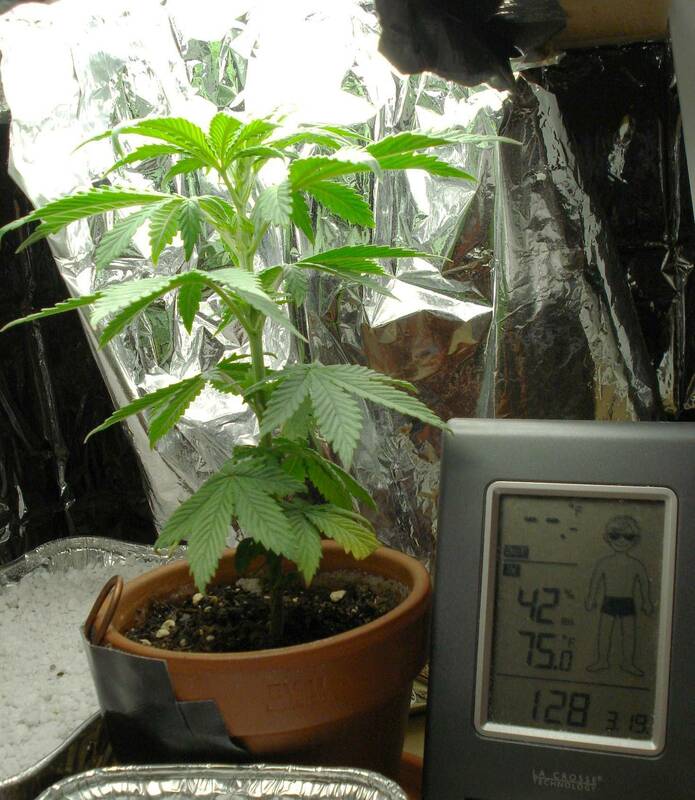 Now about the grow log, quite awesome. I don't have any comments really other then a hearty thanks for taking the time to share. 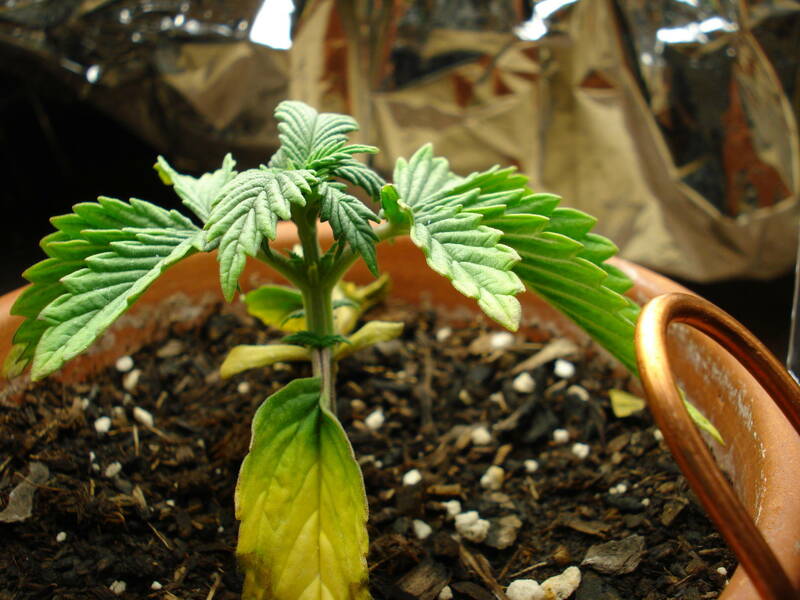 I will definatly be following this grow. Your actually making my journal look bad I have very few details in mine. But I guess I am only half way motivated being that it's not my plants I am documenting. On Thurday, Febuary 4, 2010, I checked my mail box and my most important package for this project was inside. It took about 8 days total to ship from Europe: not bad. Because I had to do a homkework assignment on Thurday night, I didn't have time to plant the seeds. So I did it on Friday. 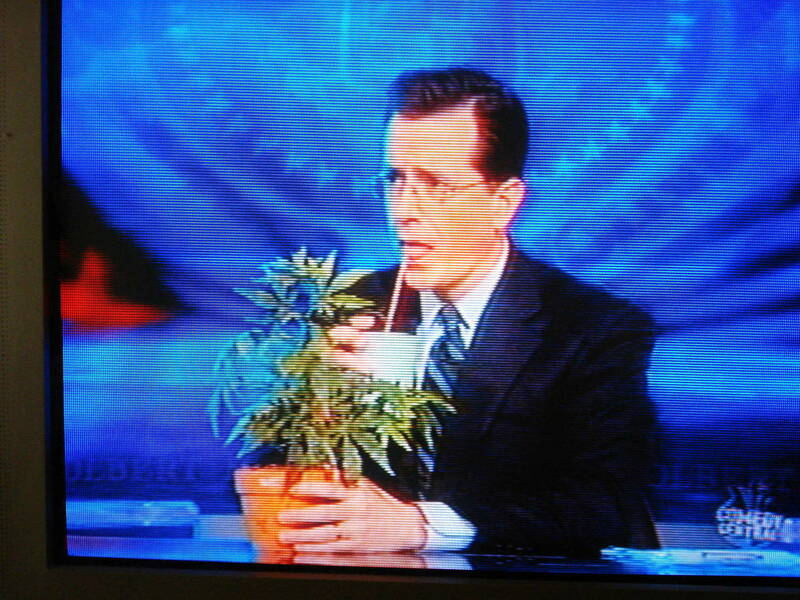 On Friday, I waited all the way to the magic time "4:20pm" (which by the way, was *really* hard!) 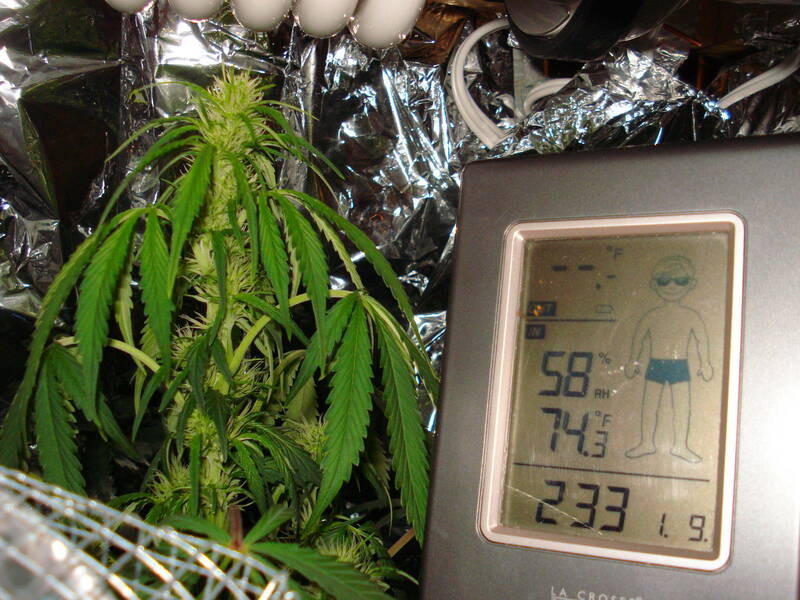 as a symbolic act of good luck for my dream goal: smoking my dried, completed harvest on April 20, 2010 (420 day! ). I hope it has some significance, even if just metaphorical. 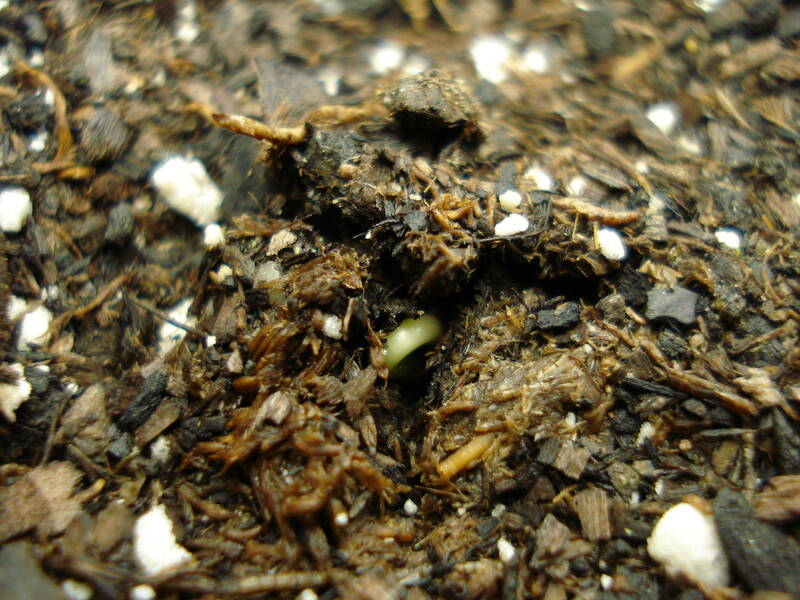 First, I took one of the seeds at random from my 2. The second one is going to be my back-up in case this one dies or doesn't sprout. 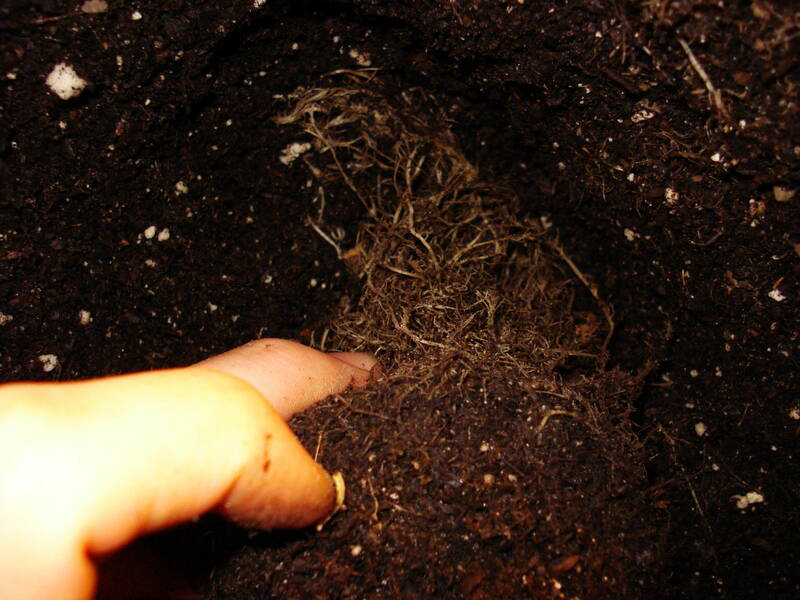 Next, I opened the bag of my Fox Farm Ocean Forest soil and grabbed my dry 3" clay pot. 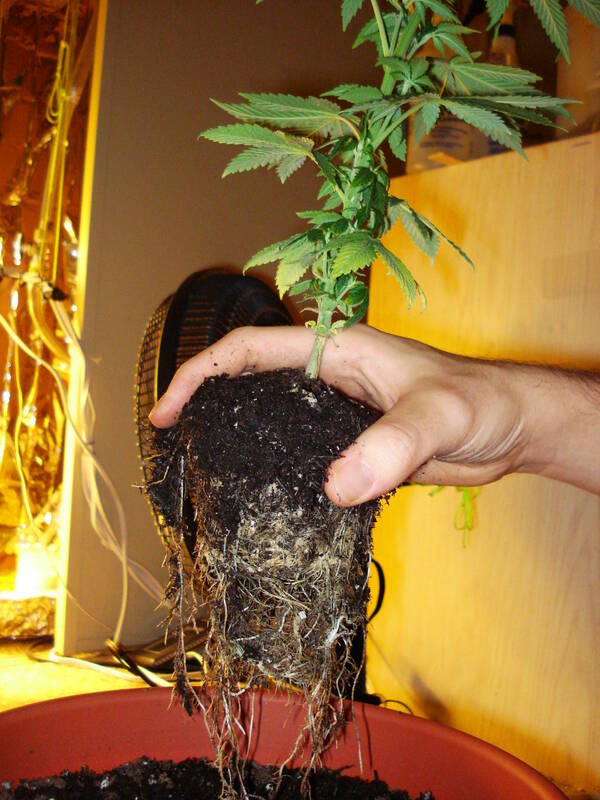 ...but other "Trusted Cultivators" said not to use them, and I already had some clay pots, so it was an easy second choice. 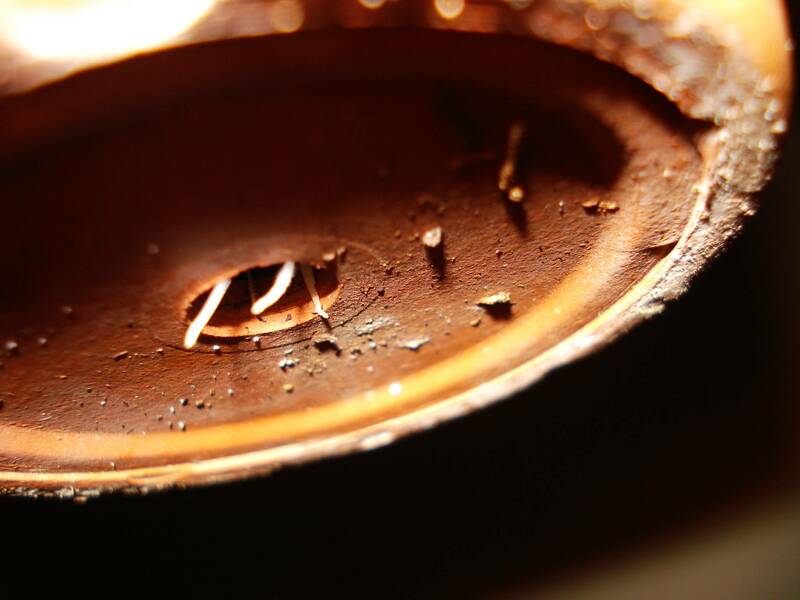 Plus, clay is a good material to get rid off excess water because the water is soaked into the clay and then evaporated, which is good in case I accidentally over-water. 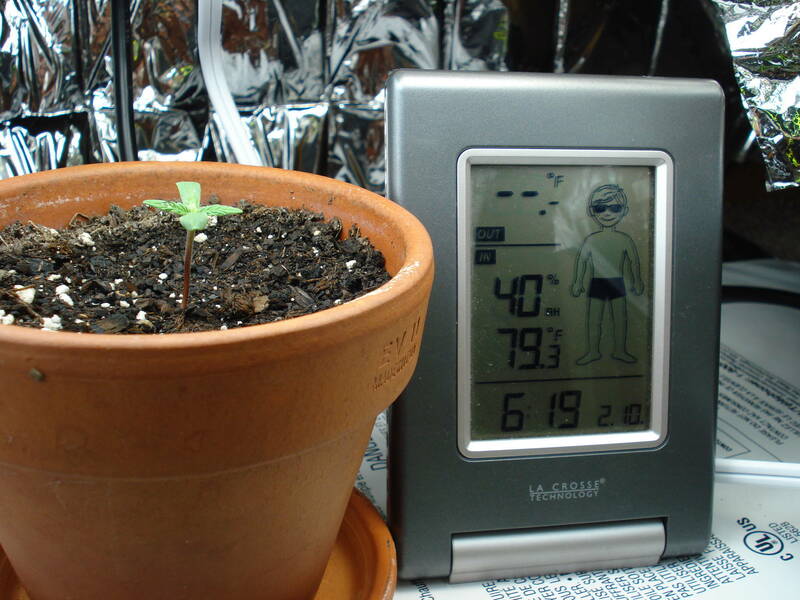 Anyway, I dropped in the seed just right on top of the soil at exactly 4:20pm. 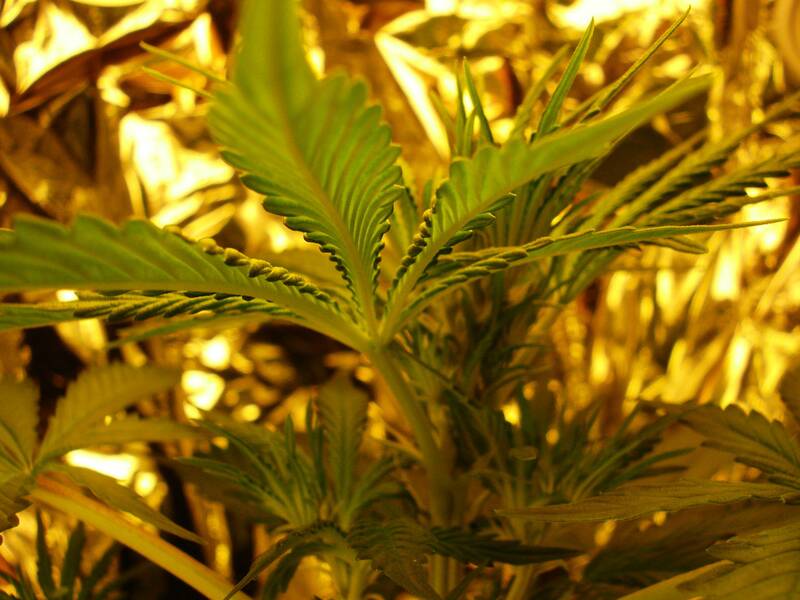 It was more of a symbolic gesture, with the time in mind, than a actual planting of the seeds. The actual preparing of the soil, such as picking out the little bark pieces, lightly misting the soil with a spray bottle, and "fluffing it up" for aeration and the mixing it up to make it "uniform" moist didn't finish until about 4:33pm. 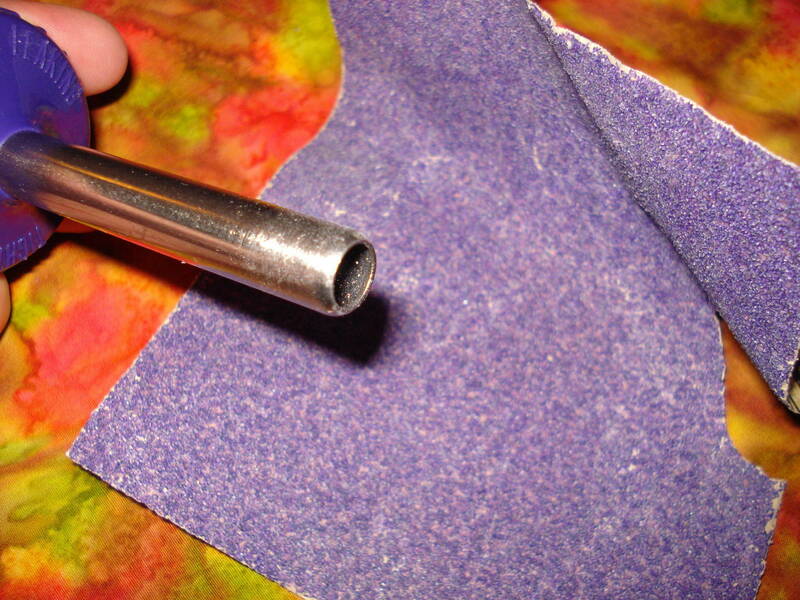 Then I made a ~1/2" hole to put the seed in. 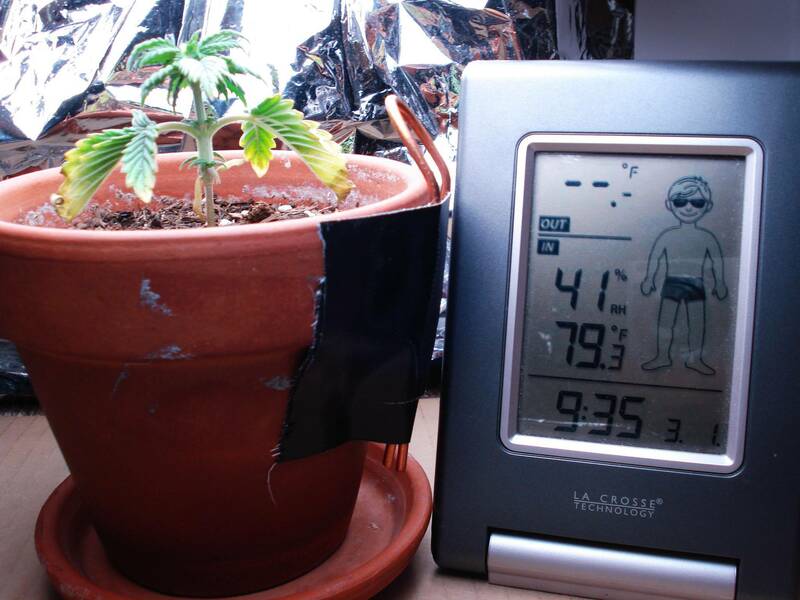 ^I know, kinda backwords, but I was rushing to get the seed in the soil at exactly 4:20pm, I hope this "rushing the planting" isn't my downfall later. But I think I put enough care to the soil's damp-but-not-wet condition to do the seed good. 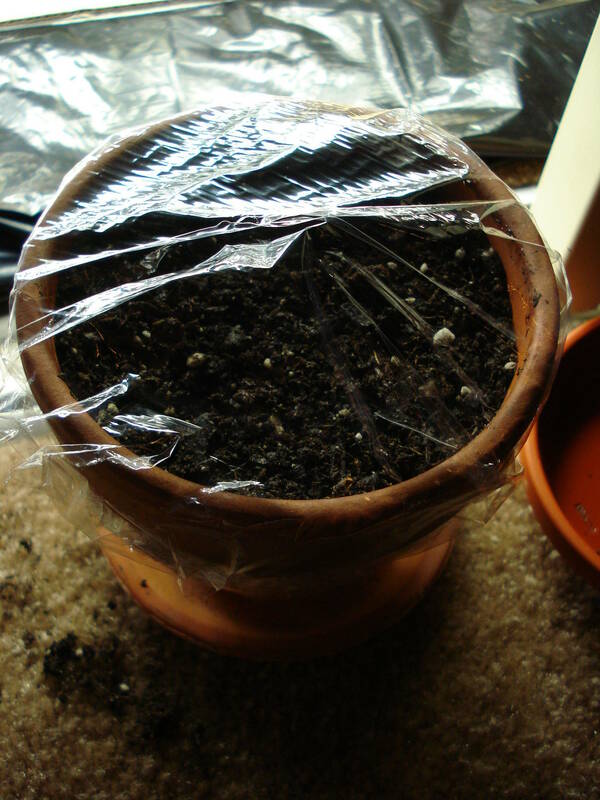 After I watered it, I wrapped the top of the clay pot with clear plastic Syran(R) wrap, as recomended by another person here and from some of the readings I've seen about growing in soil. 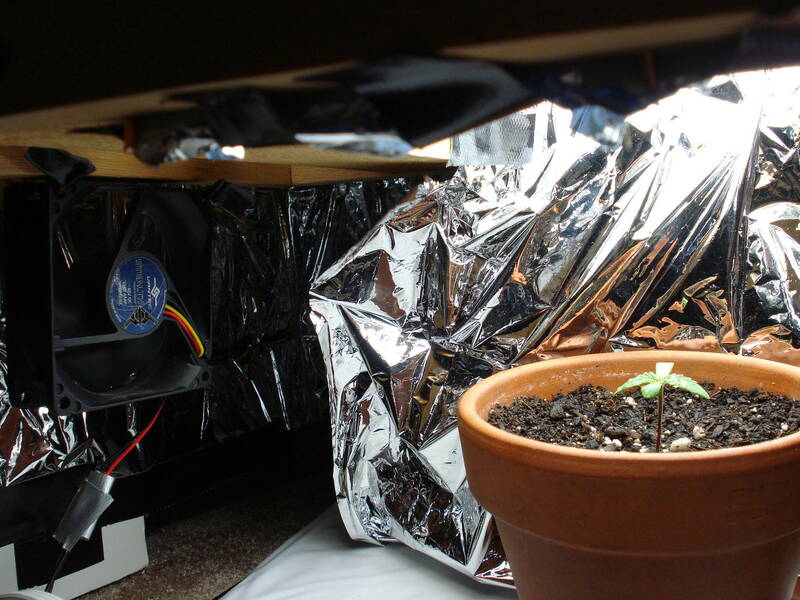 The purpose of the plastic syran wrap is to act as a "mini" greenhouse, keeping the moisture high in the plastic "tent" while letting light in. 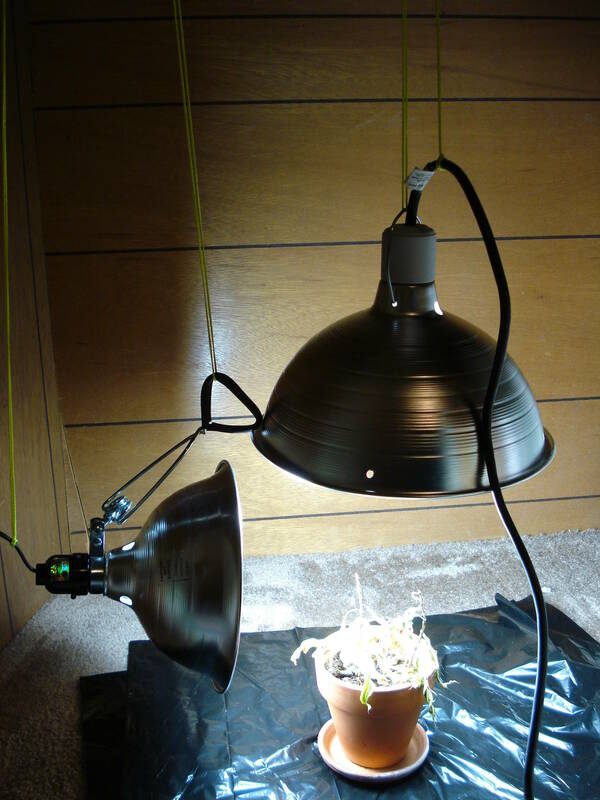 Now, I put the seeded pot underneath my 3-bulb (2 of 5,000K 27watts CFL bulbs + 1 of 6,500K 26watts CFL bulbs, 80 watts total) hanging lamp. Note that the time is 4:33pm now. I also noticed that the temperature was getting too high at 87F, so I descided that my desktop fan would run the entire time the CFL lights do. 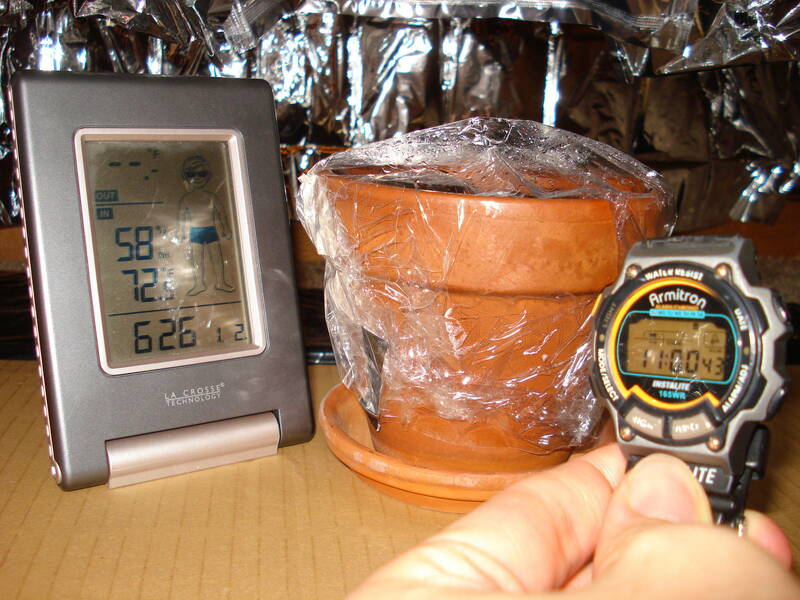 With some adjusting with the distance between my pot and the fan, I found that a distance of ~3 feet on its Lowest speed setting. 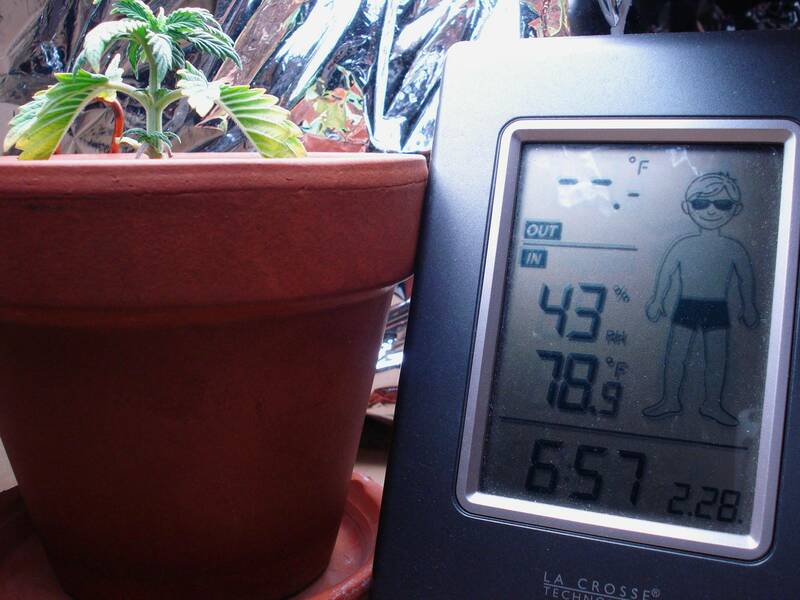 ^After about 1 hour or so, the temperature drops to about 75-78F, which is an acceptable range for me. I left on the light and programed my timer to go off at 7:00PM. I did 1 hour over regular 12-on/12-off because I planted them so late in the day. I changed the time to "6pm" after it passed the 7-hour mark. 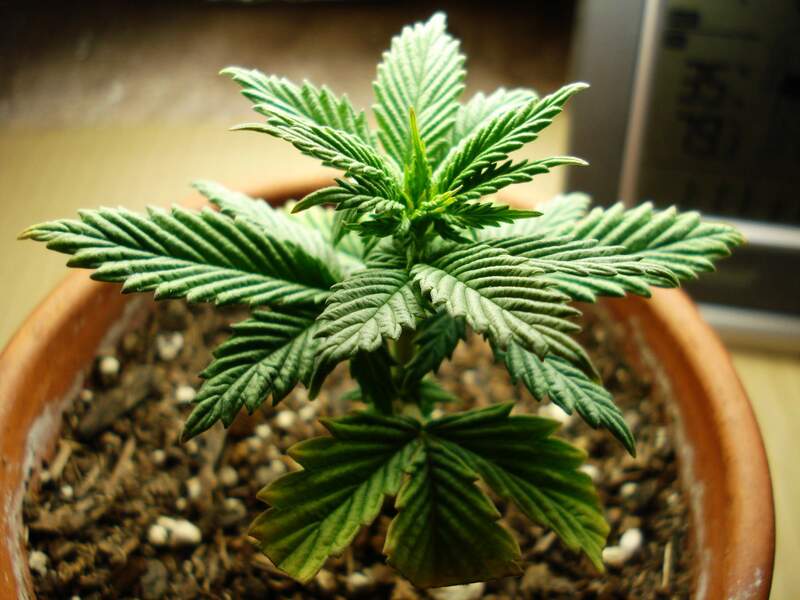 "Many beginniger growers don't suceed with germination because their seeds are not heated in the night, and they get to 60F, which is too cold for germination." 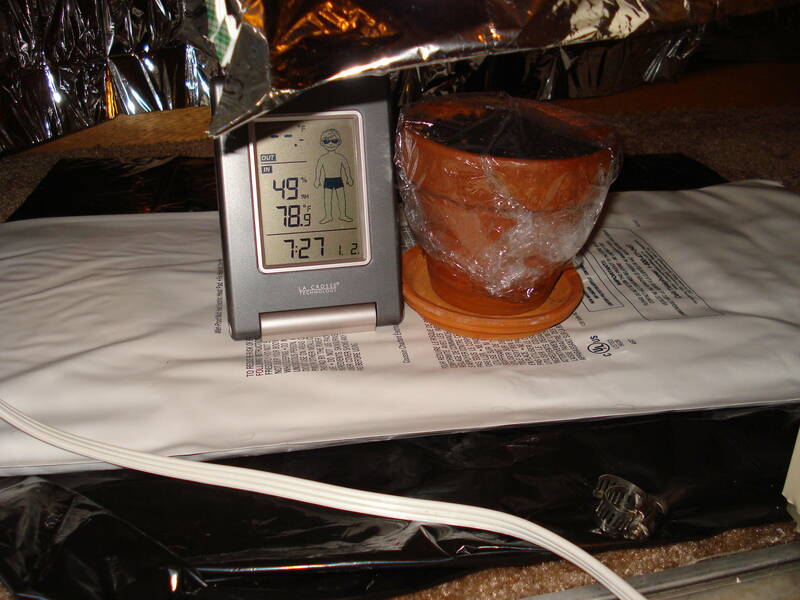 Reading that, I knew I should put a heating blanket under the pot to warm it up. The Bottom "over-flow" clay dish acts like a buffer, and hopefully its not blocking *too* much of the heat from the blanket thast it doesn't reach the seed. I guess I'm just going to have to see in the future. Well, everything, the lights, fan, and the heating blanket, are all on timers, so for now, its semi-automated like I hoped. 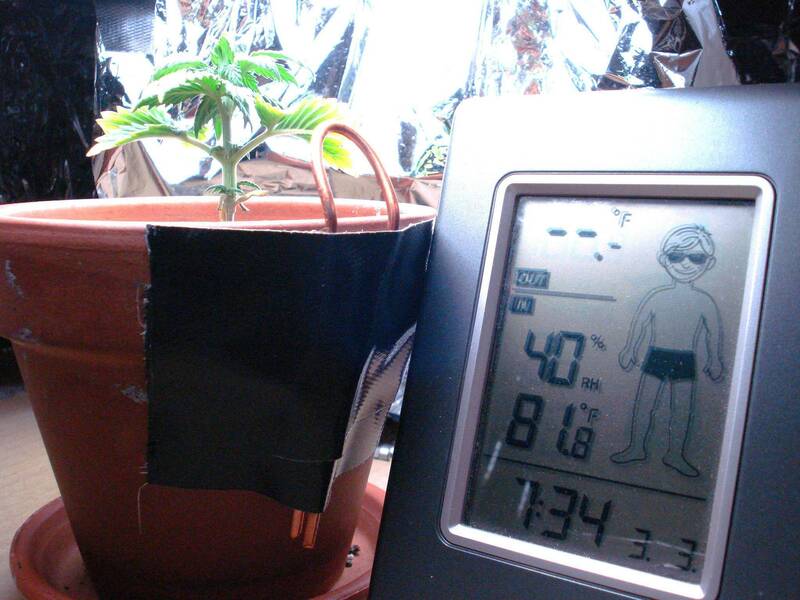 I will be checking the "mini greenhouse" in the morning to see how its doing. "This Time, Its For Real"
Why did you pick out the bark from the soil? They put it in there for a reason. The reason why I took some of the bark out is that I read in another post that growers pick out the bark from cheap soils to improve the "quality" of it. I didn't take out very much bark pieces, maybe a quarter-coin sized worth, and it was just from the top-soil. 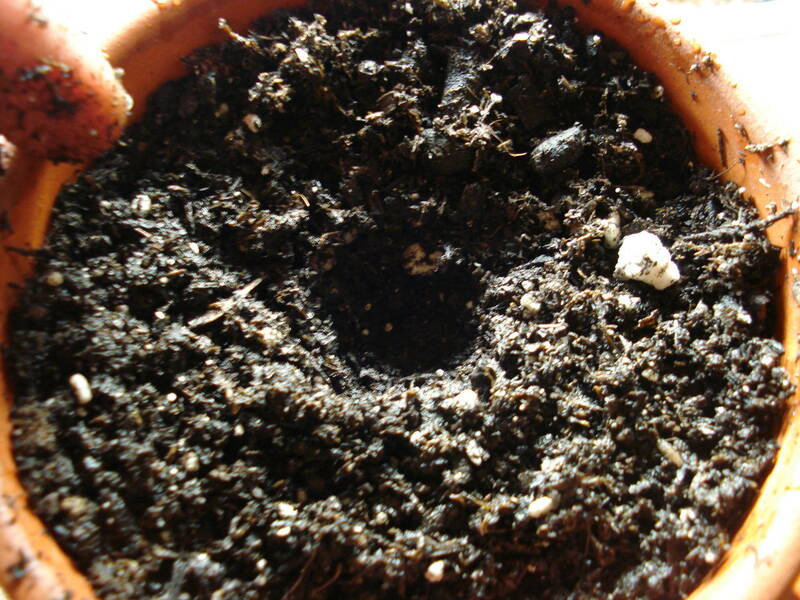 Other than that, all the soil inside the pot is untouched. 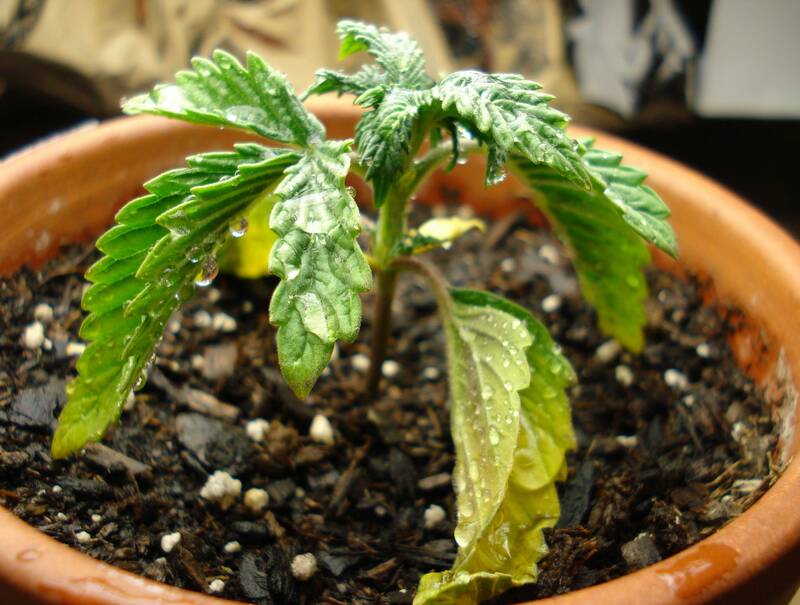 Also, how wet should the soil be to germinate the seeds? right now its "moist" but not soaked, is that how it should be? 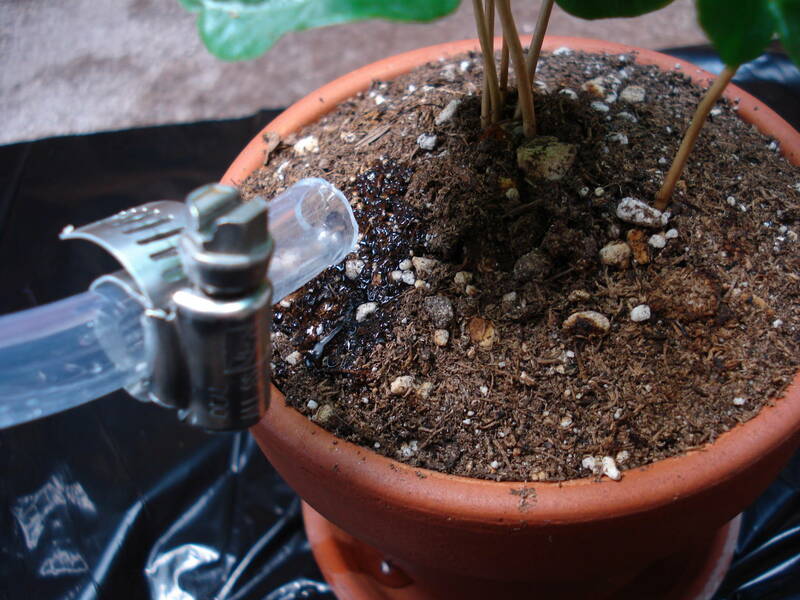 Could I gauge the "proper" wettness of the soil by the amount of water droppelts collecting on the top of the plastic "greenhouse" wrap? But I won't be doing it again....thanks for pointing that out Trip. Don't Remove Soil Bark: Check! 149,434 topic views. 0 members, 1 guests and 26 web crawlers are browsing this forum. Generated in 0.07 seconds spending 0.004 seconds on 17 queries.